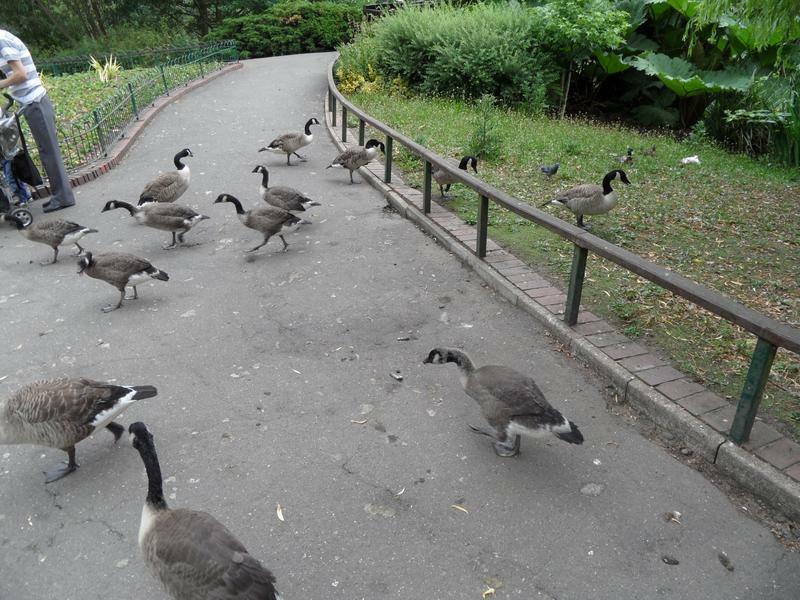 so we usually only visit the east side. 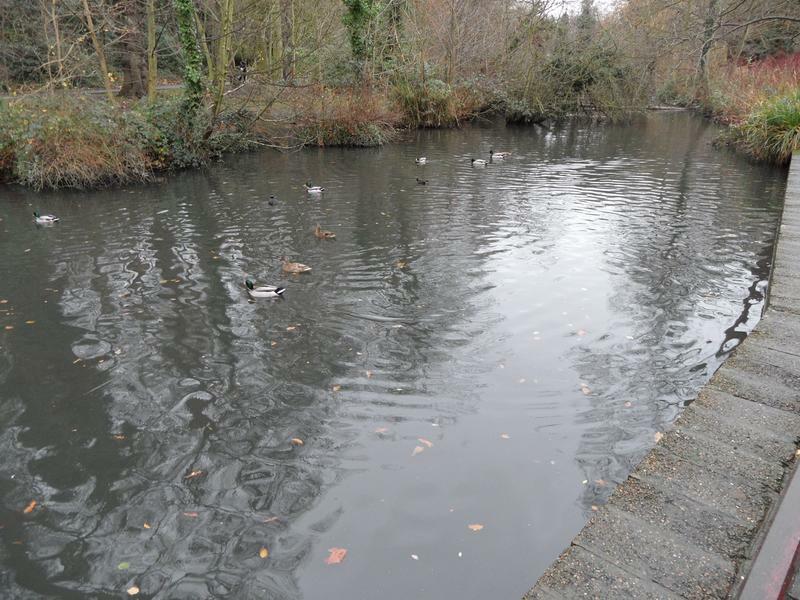 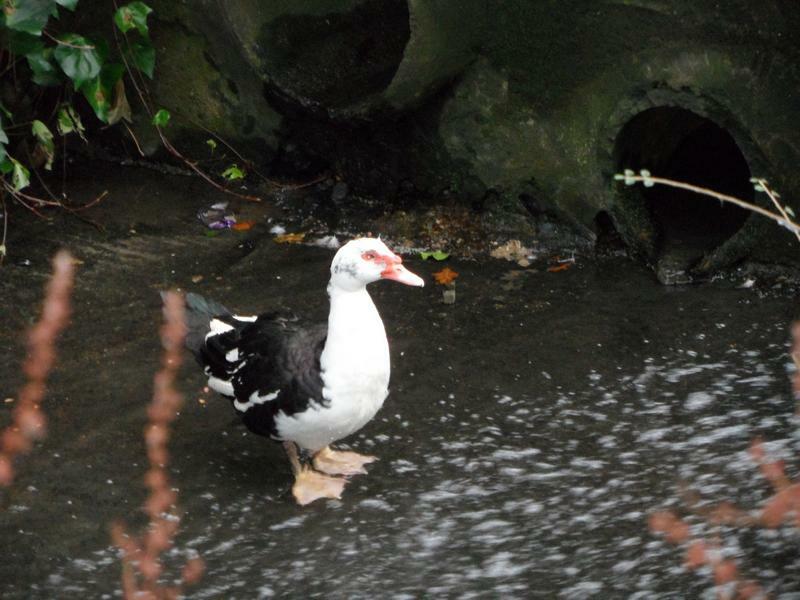 2nd |January 2013, Ivan the Muscovy Duck was a away from his normal haunts, on the edge of the stream leaving the pond. 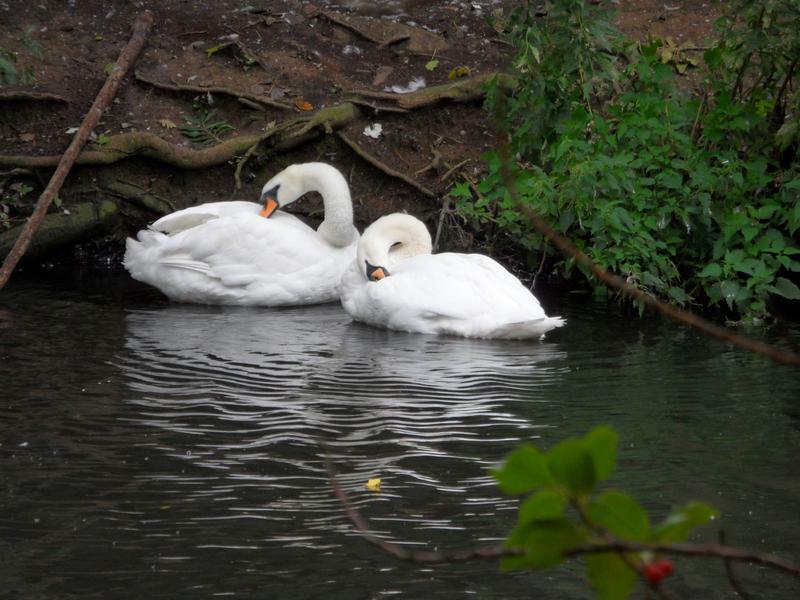 Two swans here as usual, few other ducks coming our way. 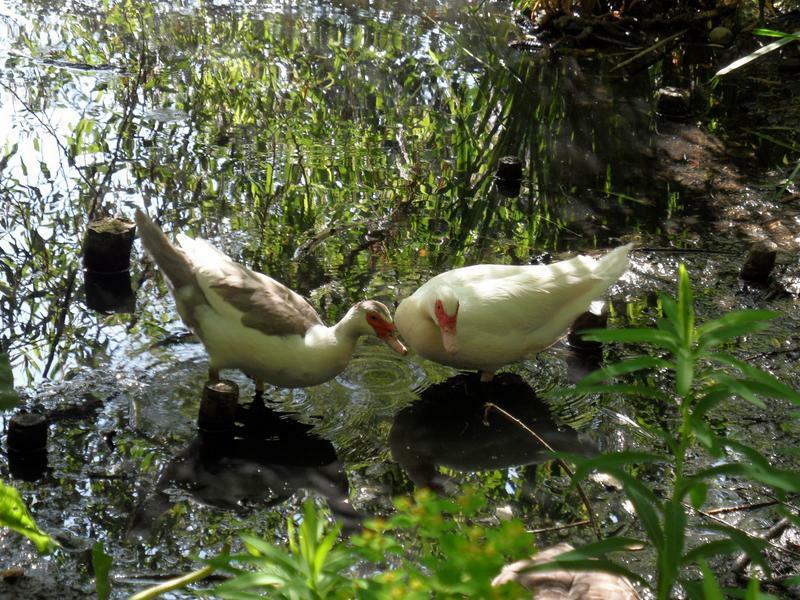 A pair of while Domestic Ducks. 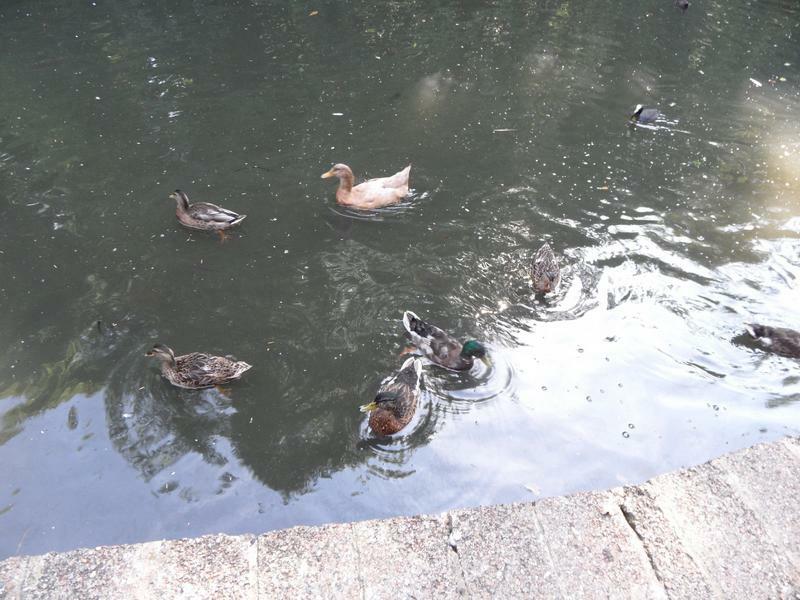 A Buff Orpington Duck, surrounded by Mallards. 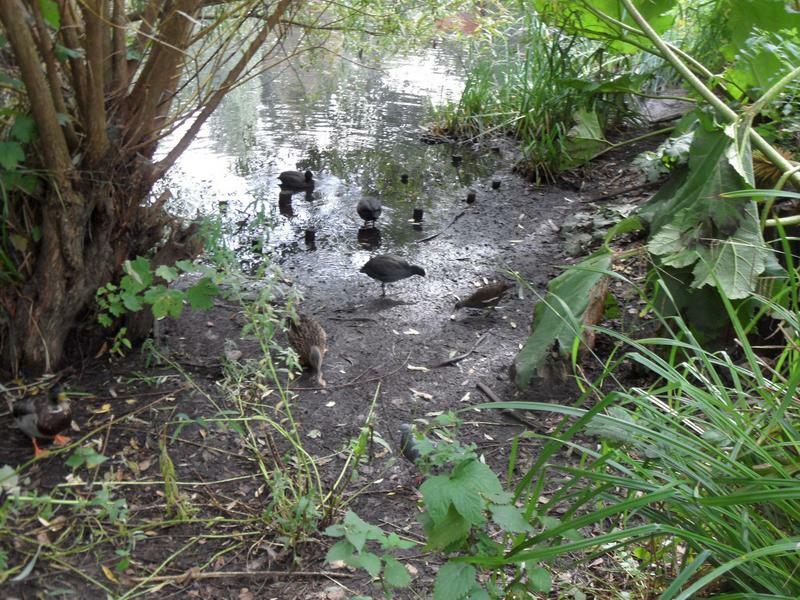 A Coot and Moorhen under the tree. 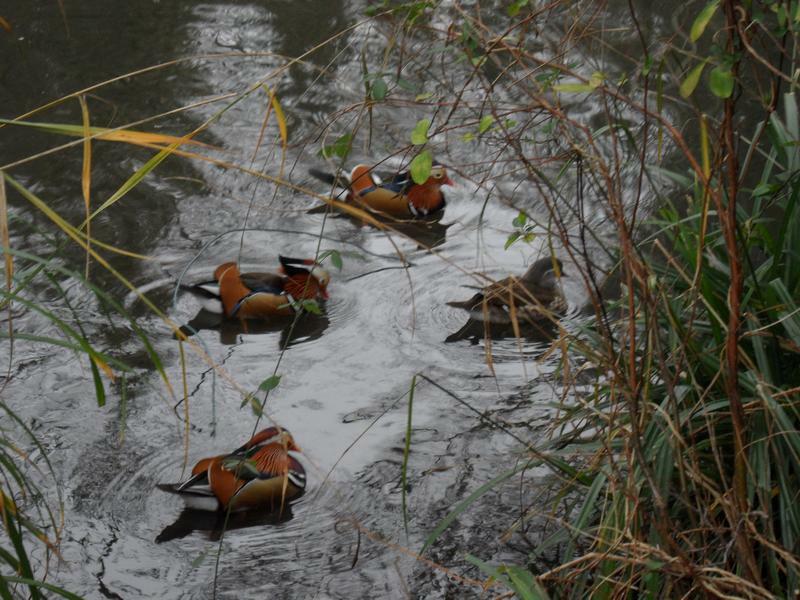 Four Mandarin Ducks, sometimes we seem them here, but often not, the boys following a girl. 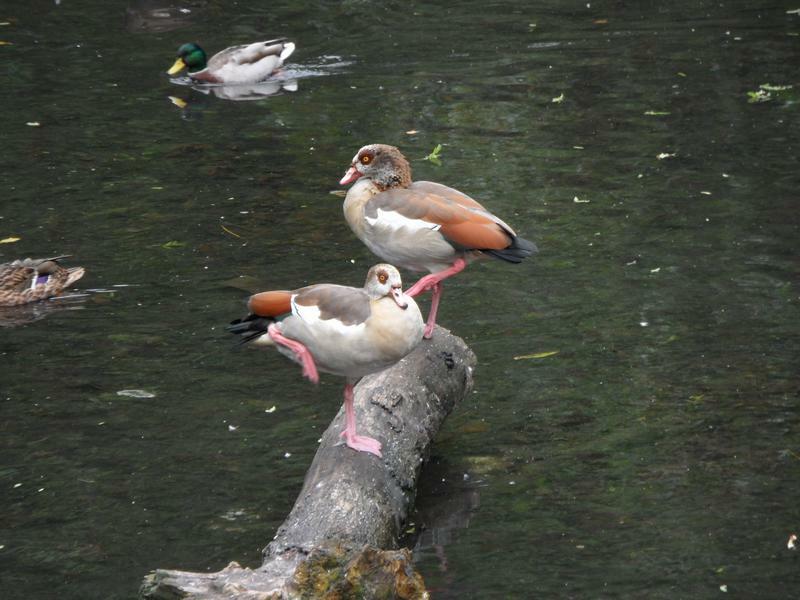 Two of the Mandarins again. 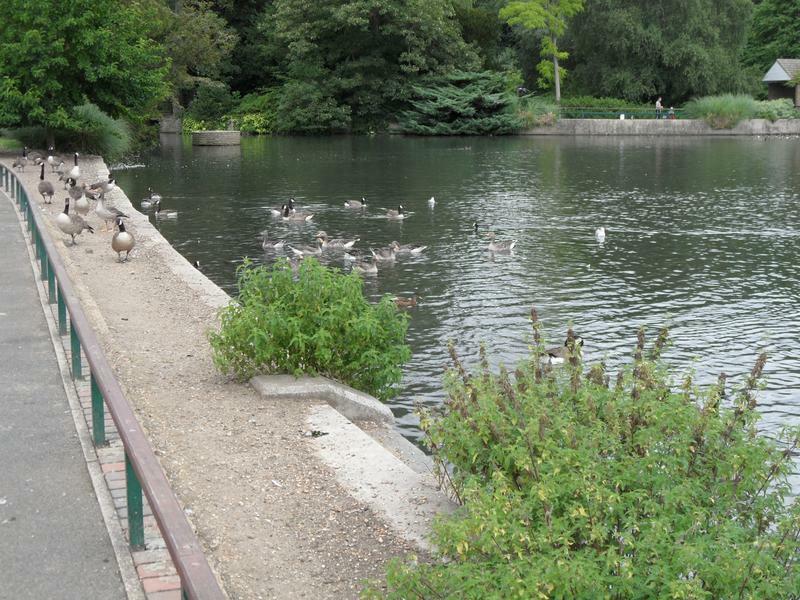 The main lake, mostly sea birds. 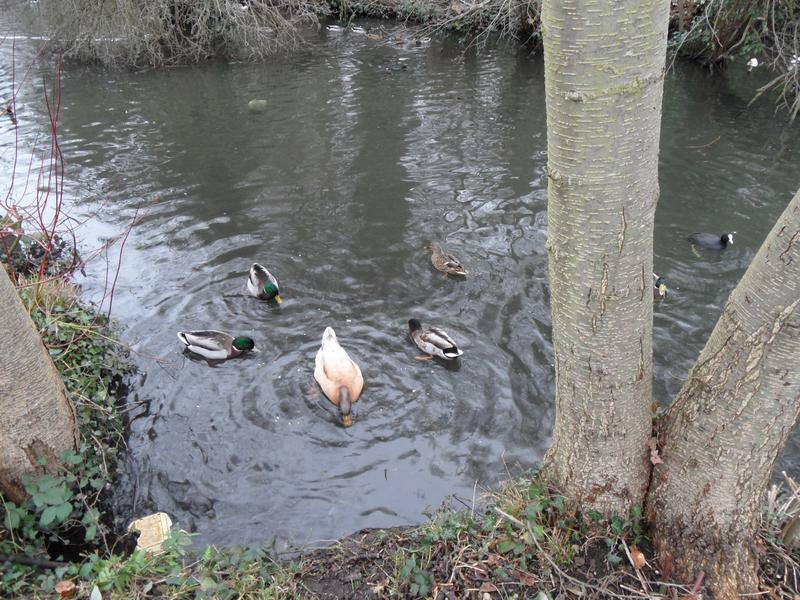 More Mandarins ducks on this smaller pond. 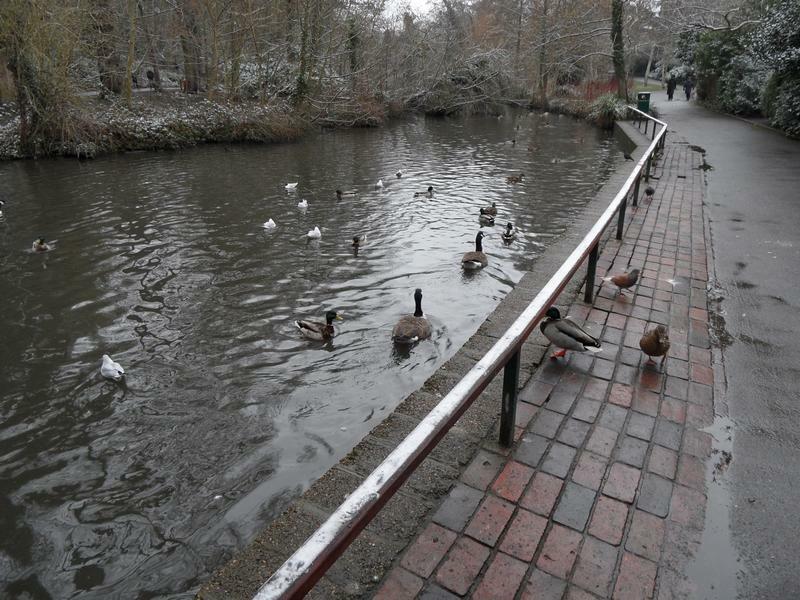 3rd February 2013, still very cold, not many people around. 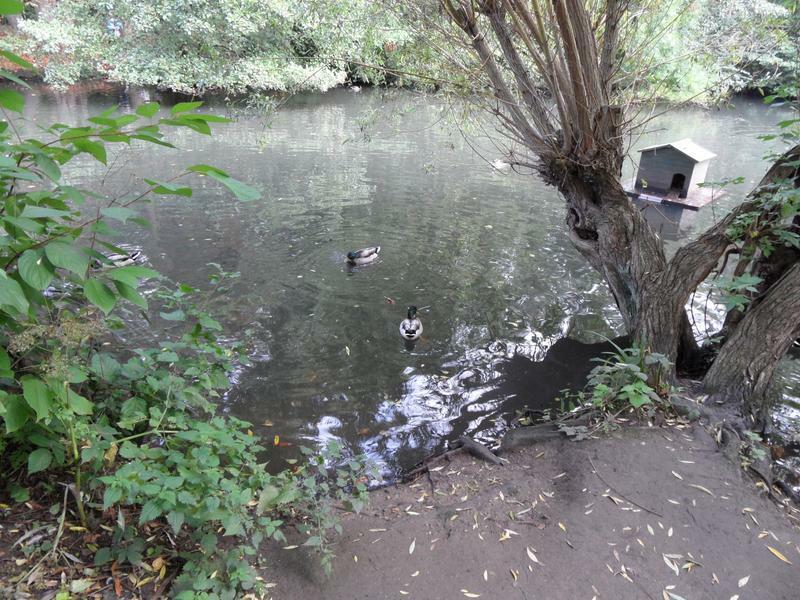 Ivan is sufficiently hungry to get out of the water and follow me around. 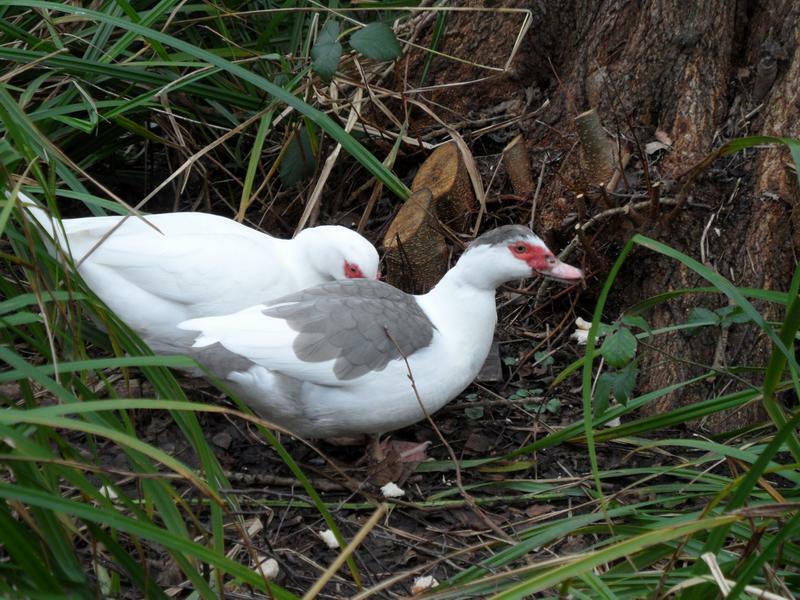 The pair of White Muscovy Ducks, apparently both female, have found a nesting area near a tree, but it's also right next to the path. 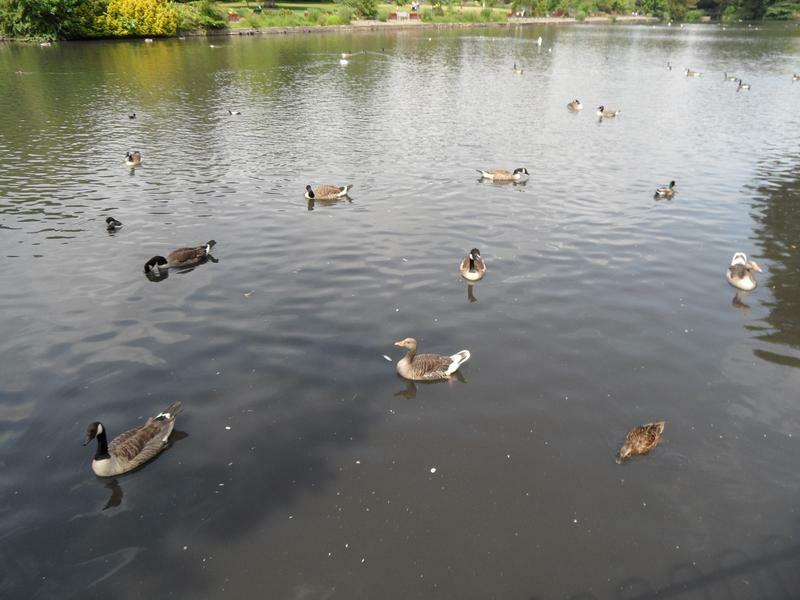 A lot of Tufted Ducks on the main lake. 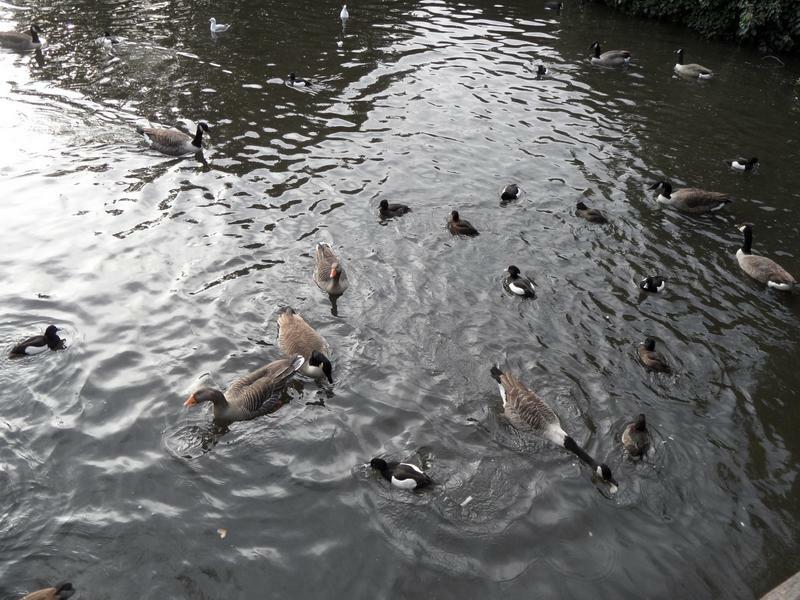 Who keep swimming around in formation. 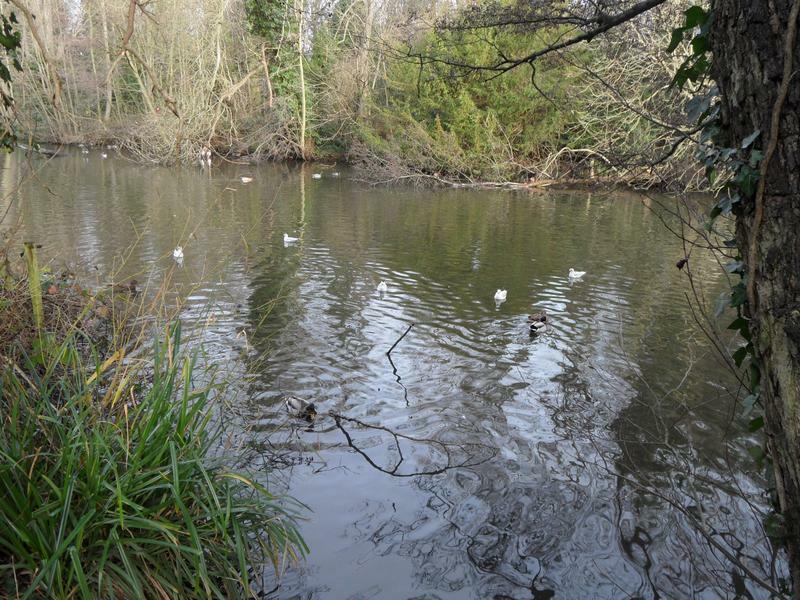 3rd March 2013, during the winter a lot of vegetation around the lakes has been heavily cut back, allowing easier access for everyone. 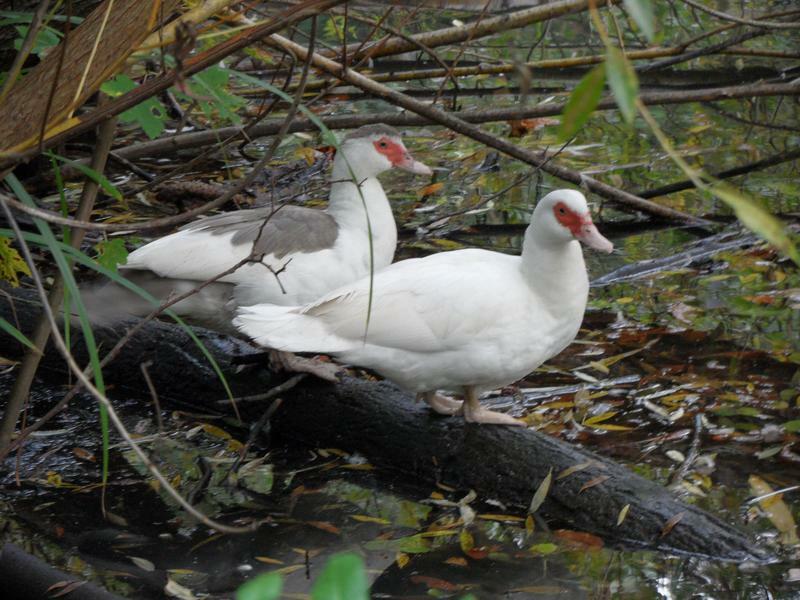 Large and smaller Muscovy Ducks. 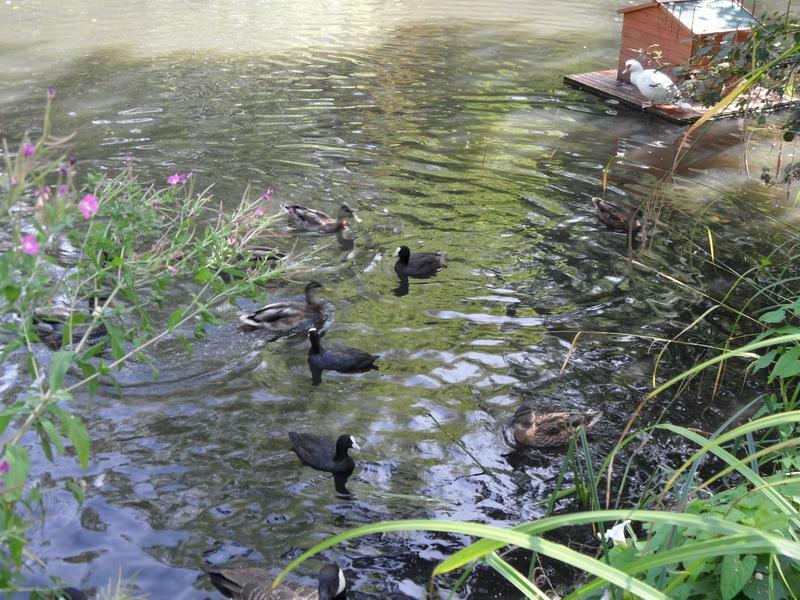 Tufted Ducks on the main lake. 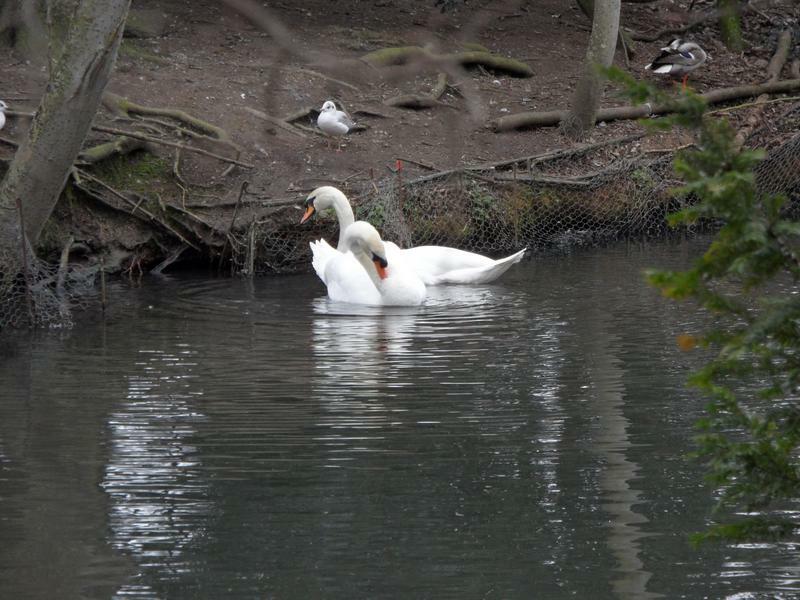 Two Swans near the small island. 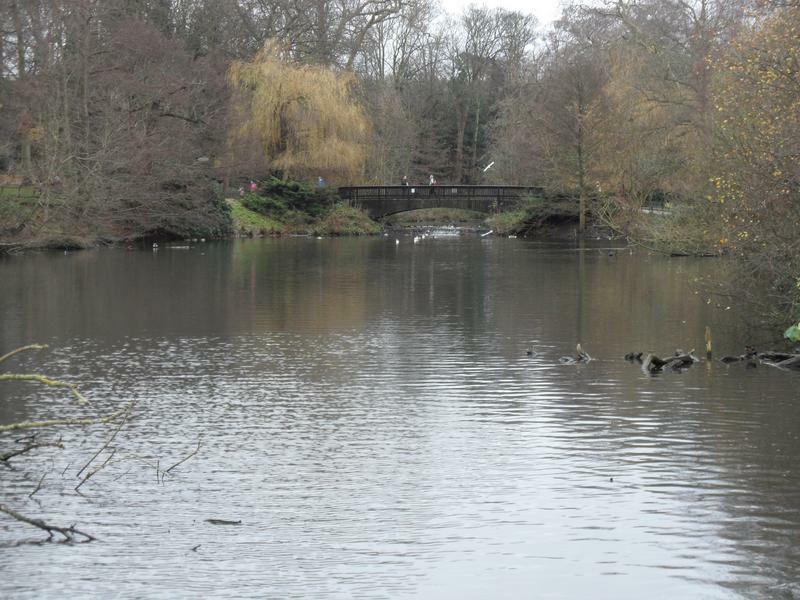 24th March 2013, a snowy freezing weekend, excellent flow of water through the lakes heading north to Beckenham Place Park. 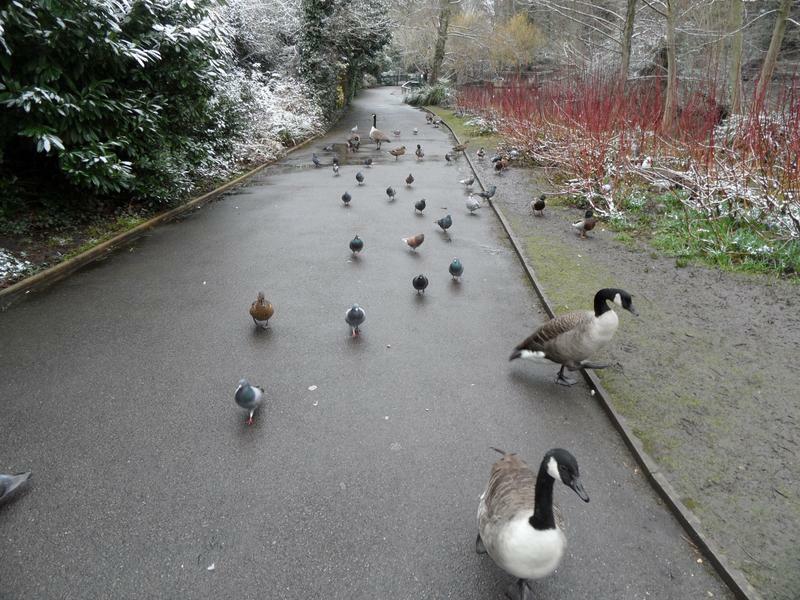 Probably due to the cold, very few people feeding in the park today so everyone is hungry. 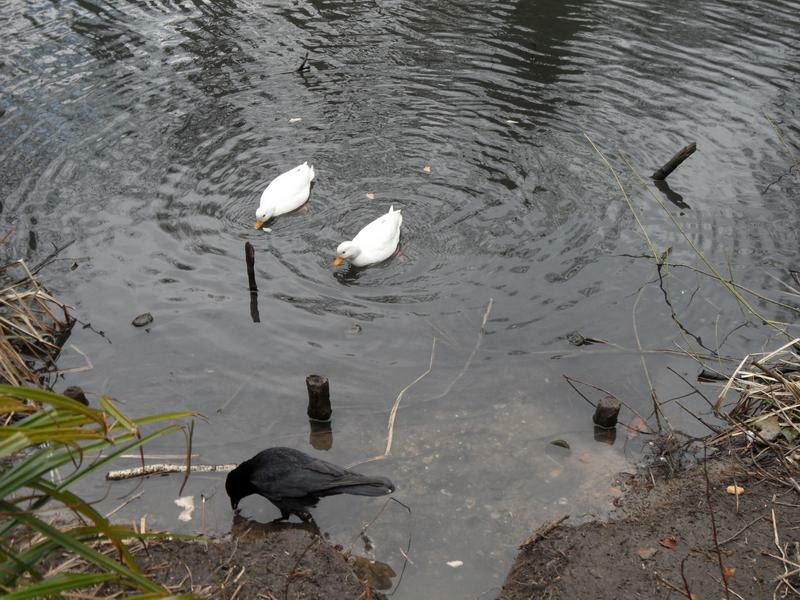 Ivan again heads my way. 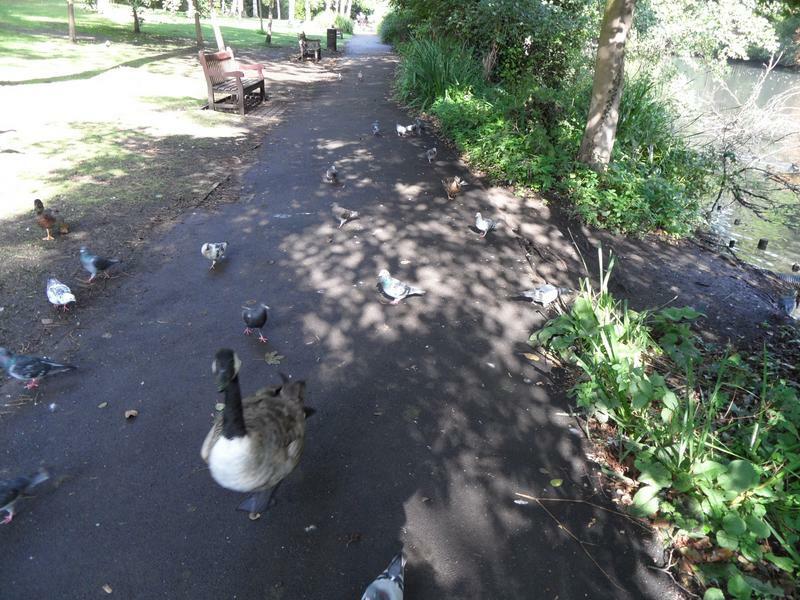 Everyone following me down the path, no dogs on this side of the lake and few people either. 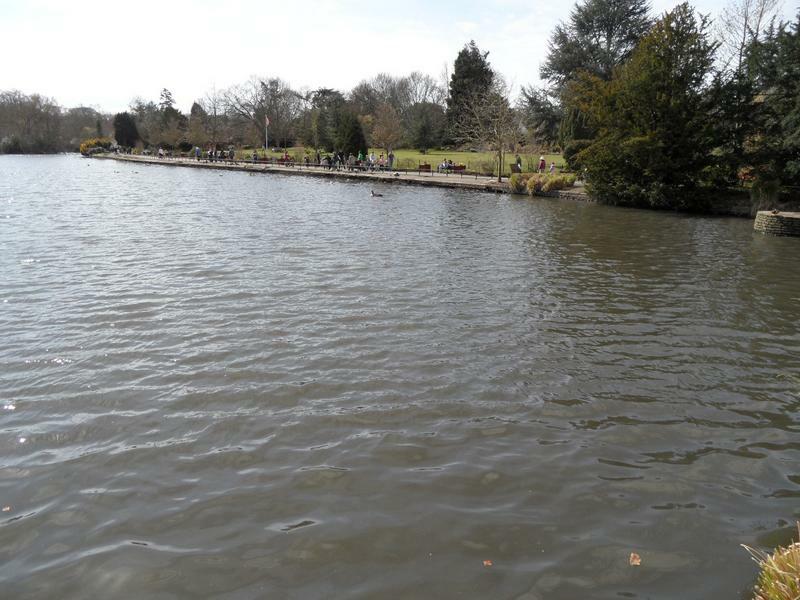 At least the cold means less mud, Ivan heading back to the water. 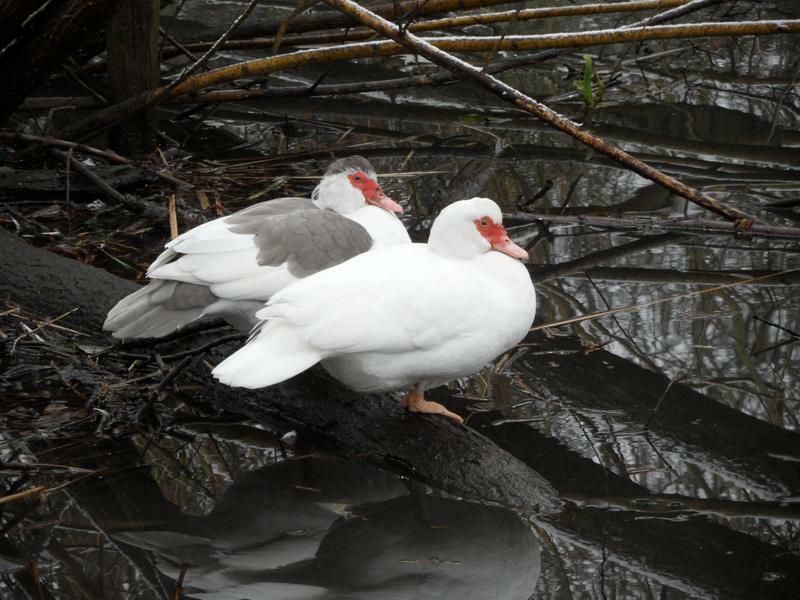 The White Muscovy Ducks are back on their favorite branch this week, the only birds that are not hungry. 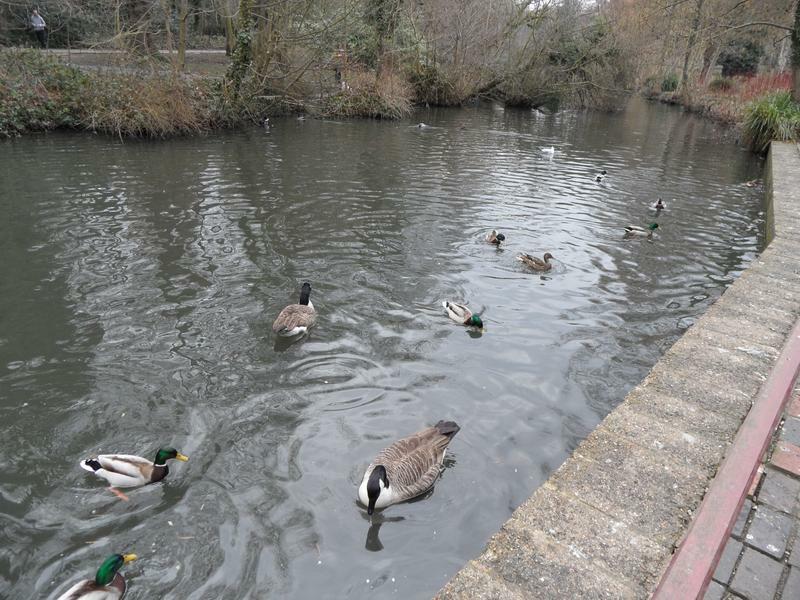 1st April 2013, still freezing cold and few park visitors despite being a holiday, lots of hungry ducks and geese. 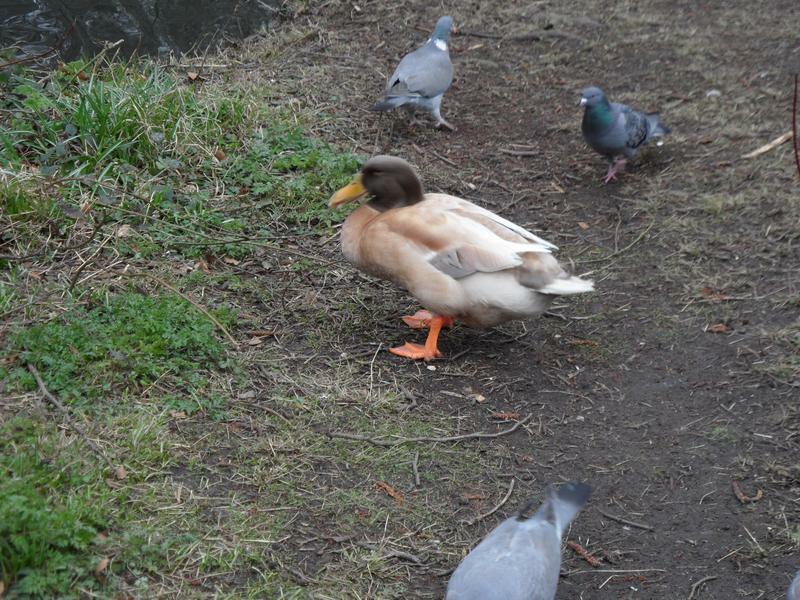 The Buff Orpington Duck is larger than a normal Mallard. 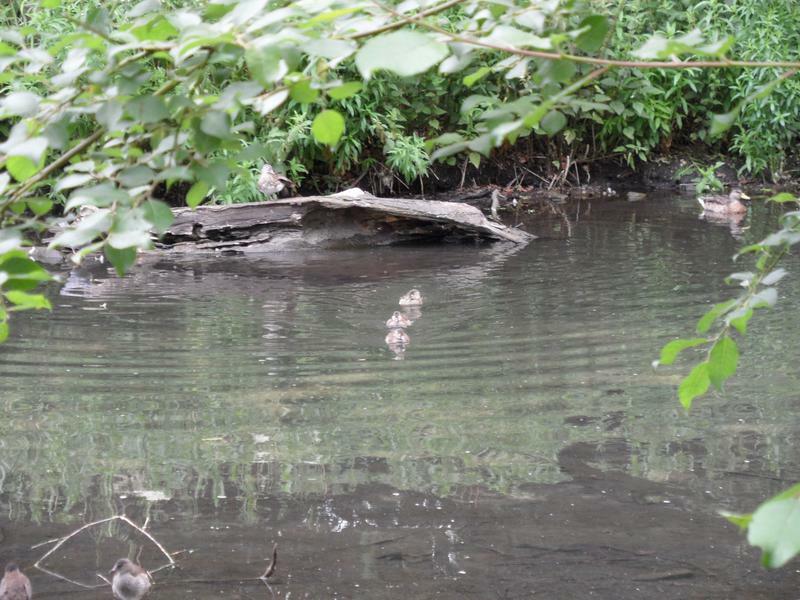 left edge of photo on another log. 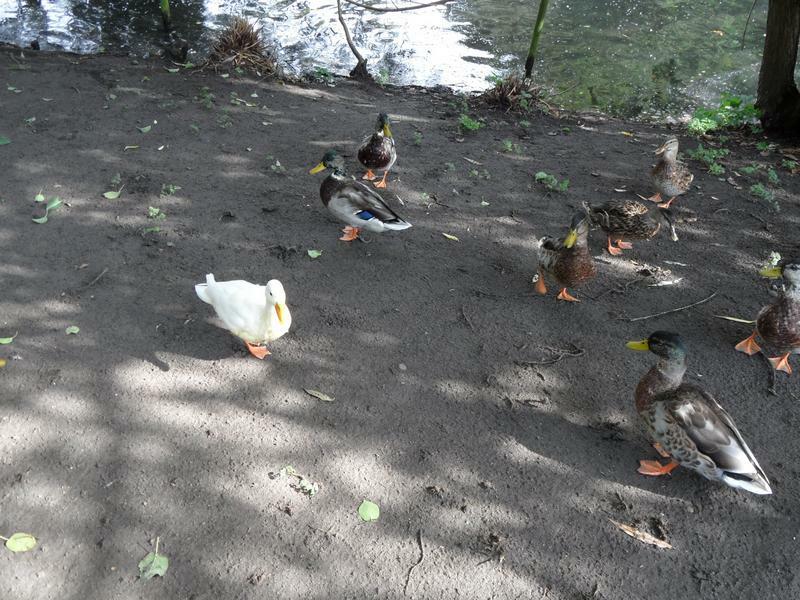 adults at this time of the year, probably White Call Ducks, smaller than Domestic Ducks. 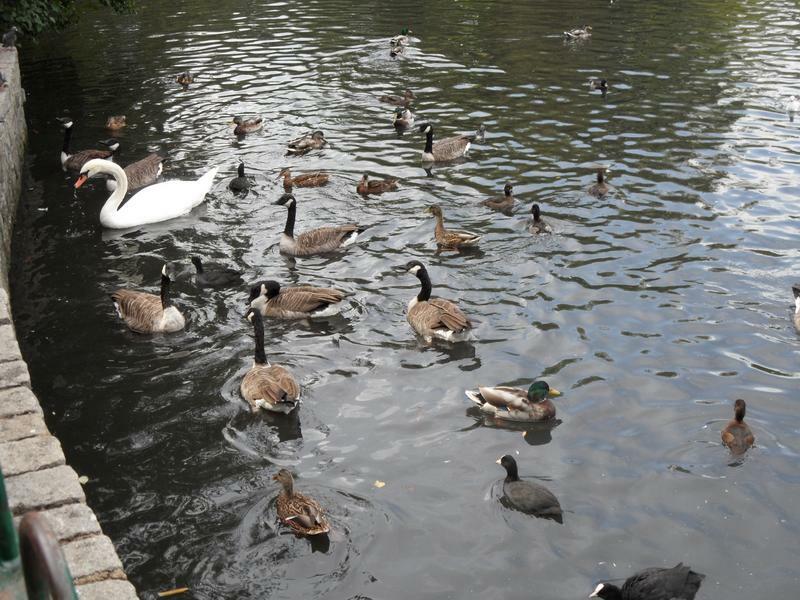 The Call Ducks moved into the water, and swan away into the distance. 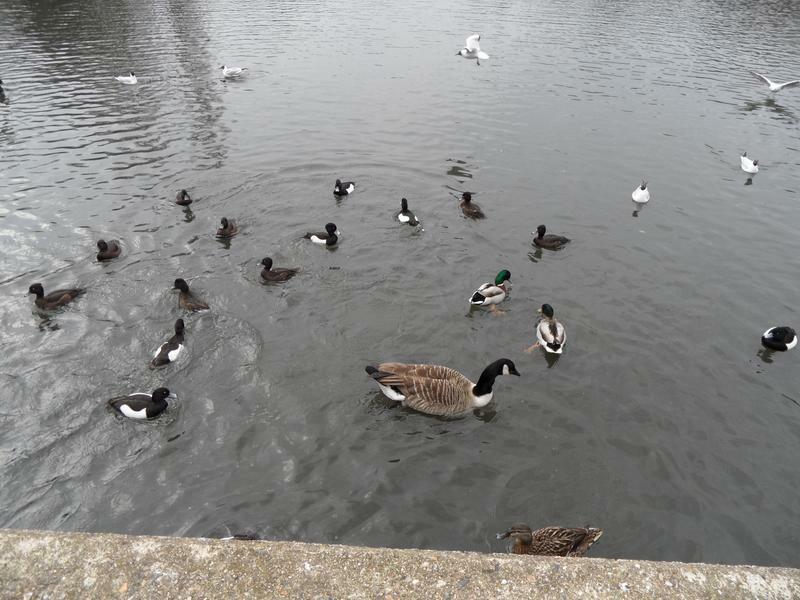 Plenty of hungry Tufted Ducks, although the sea birds kept stealing their bread. 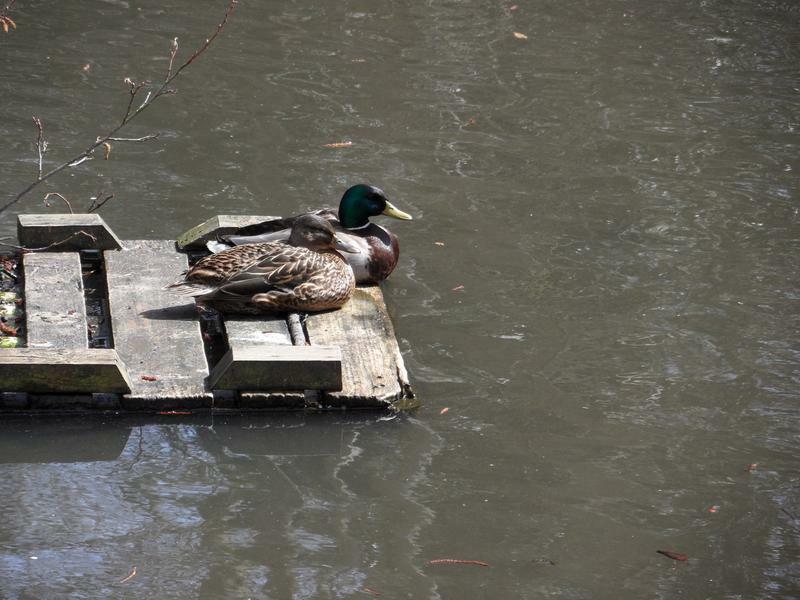 a pair of Mallards on a floating nest board. 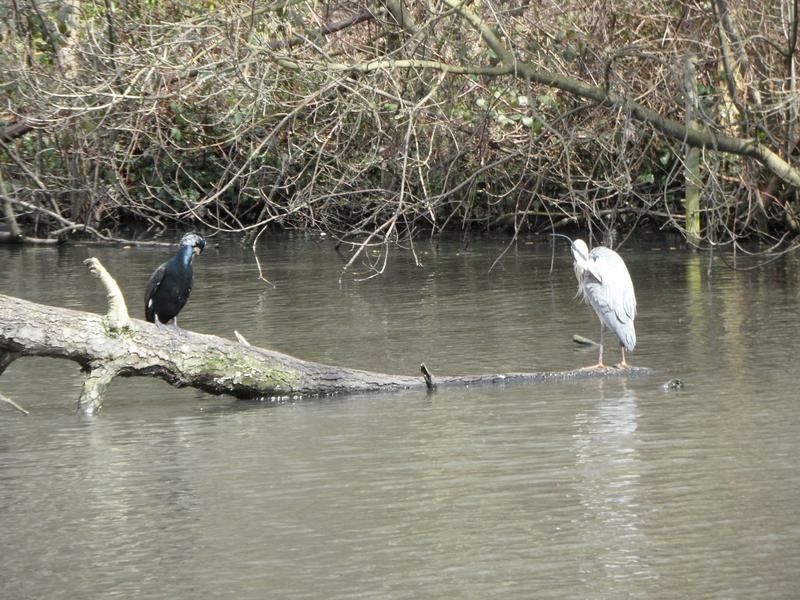 The Cormorant and Grey Heron are on their usual branch. 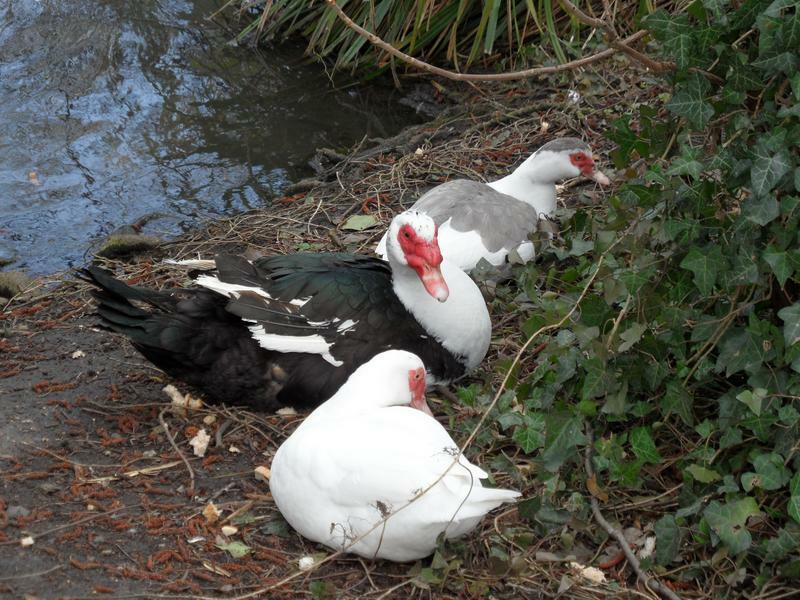 The three Muscovy Ducks are sleeping together, not seen that before, not hungry either, surrounded by bread. 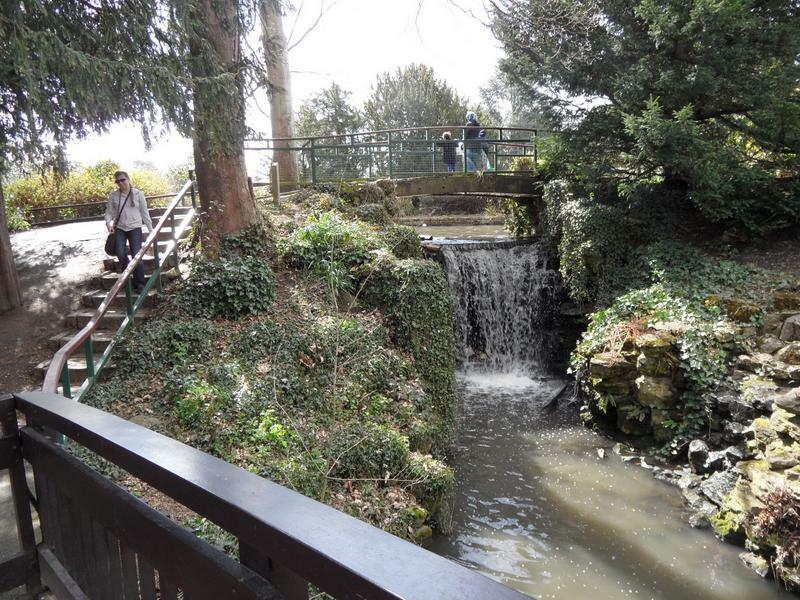 The waterfall from the main lake. 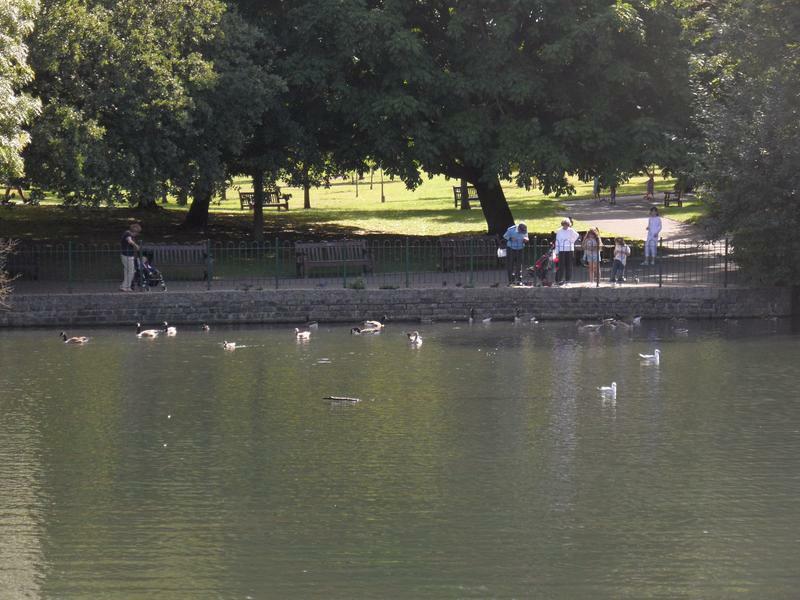 The main lake is very quiet as well, all the sea birds have flown off. 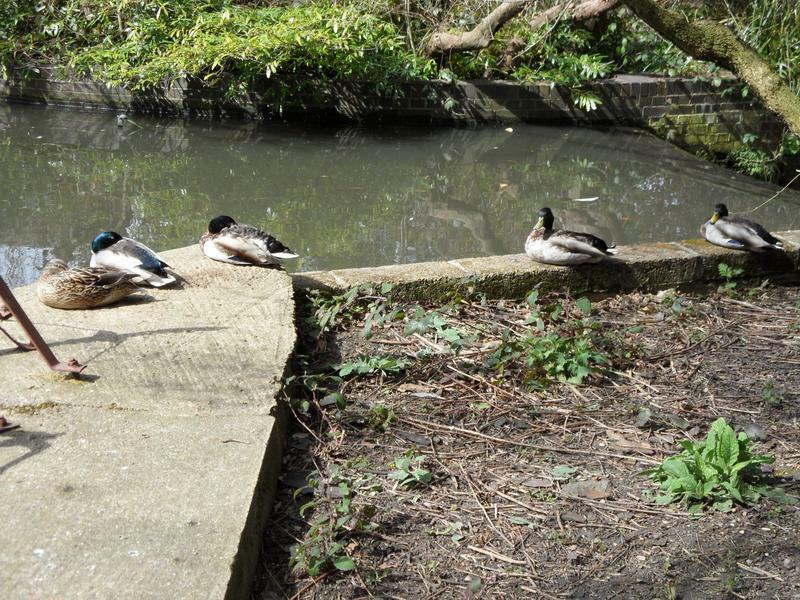 A few Mallards sleeping over a sluice gate. 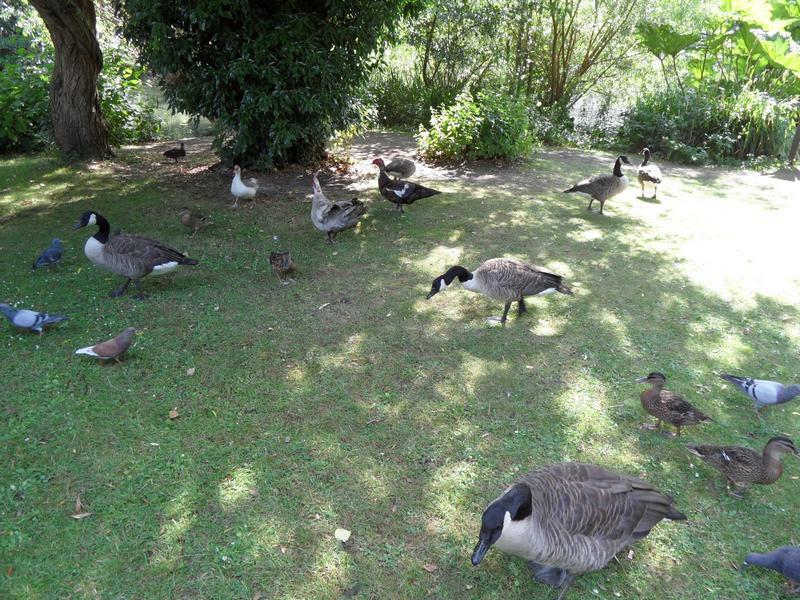 beside the lakes, so perhaps are well fed. 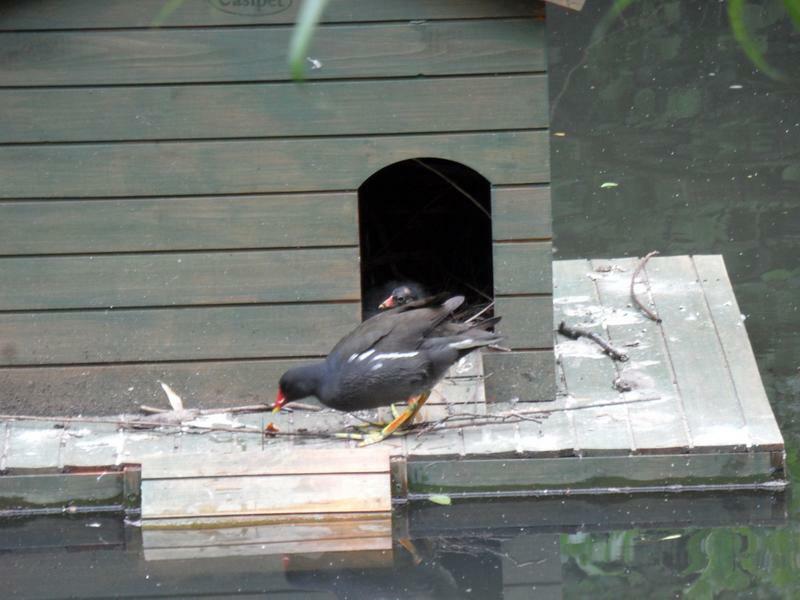 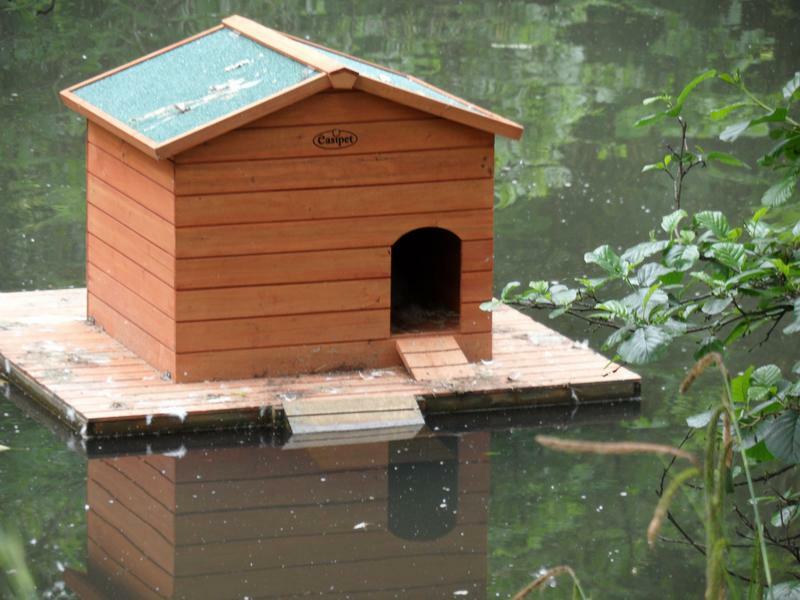 A Moorhen has taken over a floating nest house that appears designed for much larger birds, here feeding three chicks. 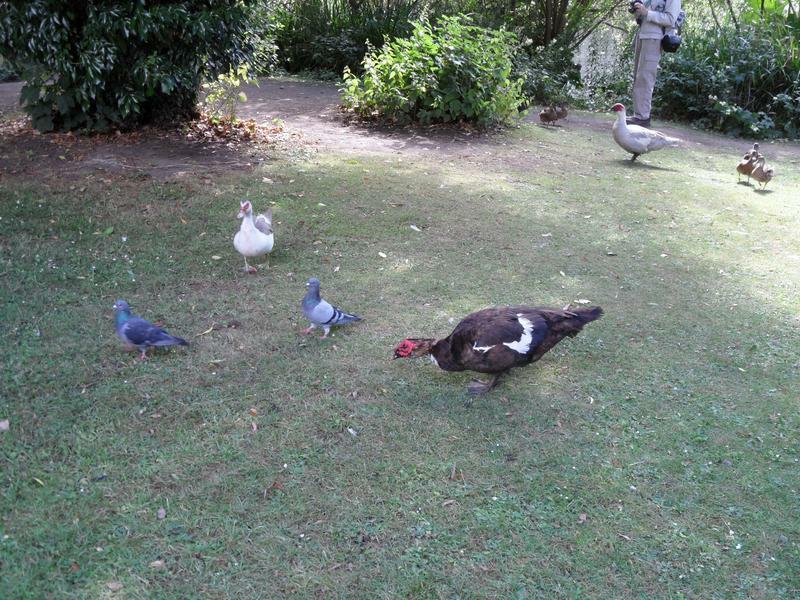 Ivan the Muscovy Duck is not hungry today. 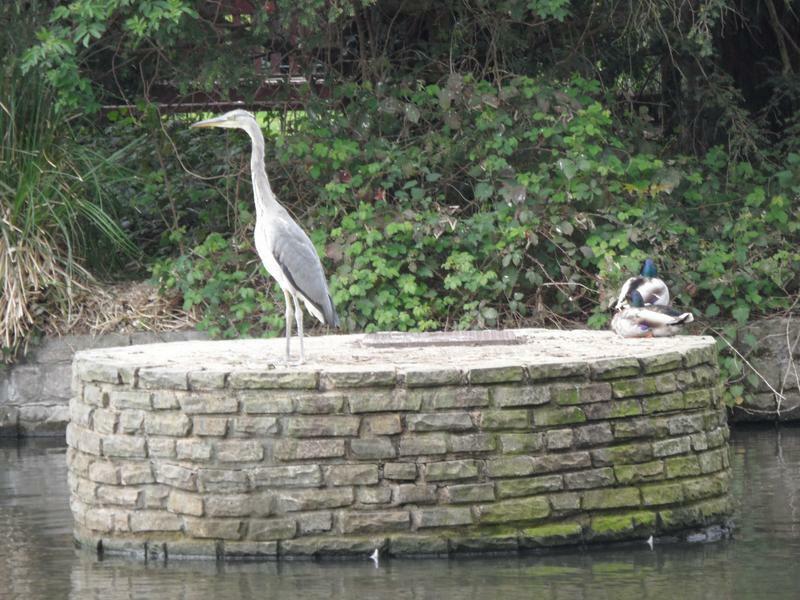 Did not see any goslings or ducklings on the lake, the locals suggest they all get eaten by the ever attentive herons. 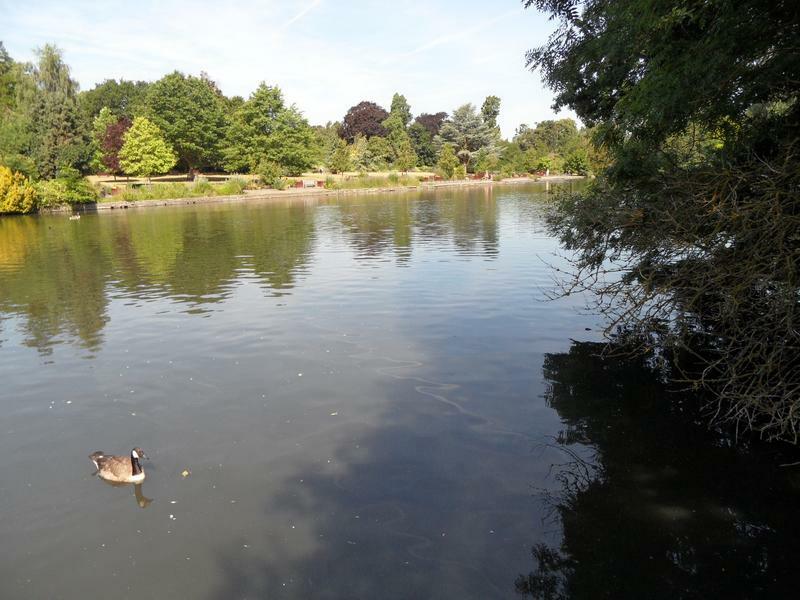 Quiet up this end of the lake as well. 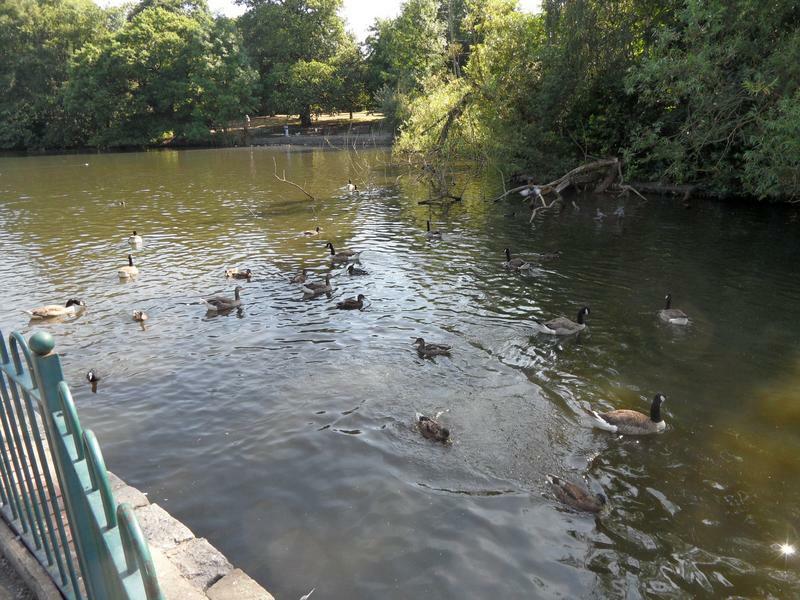 The most southerly lake from the bridge, few Mallards and Canada Geese. 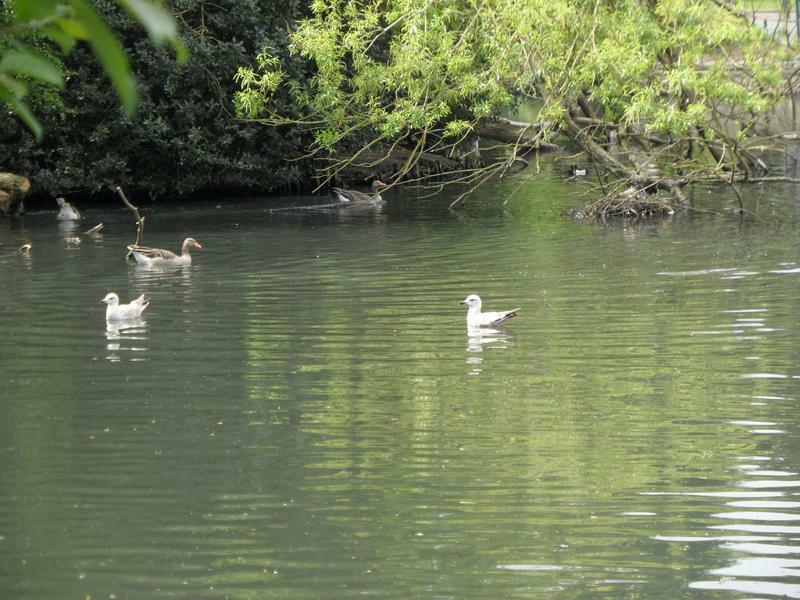 The dog free side of the lakes has easier access to the lawns from the water, two Greyling and a White Goose. 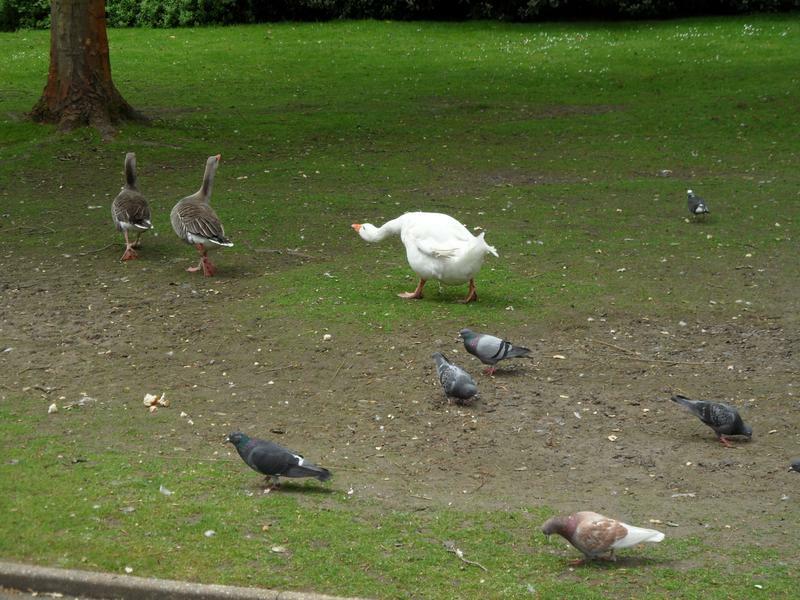 Despite the expanse of grass, the White Goose seems determined to shoo the Greylings away. 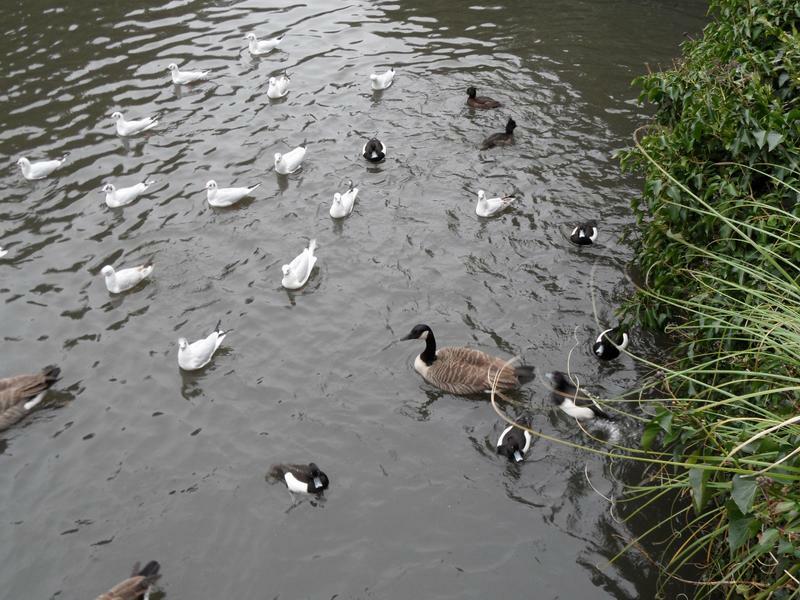 More Greyling Geese on the lake, and a large nest. 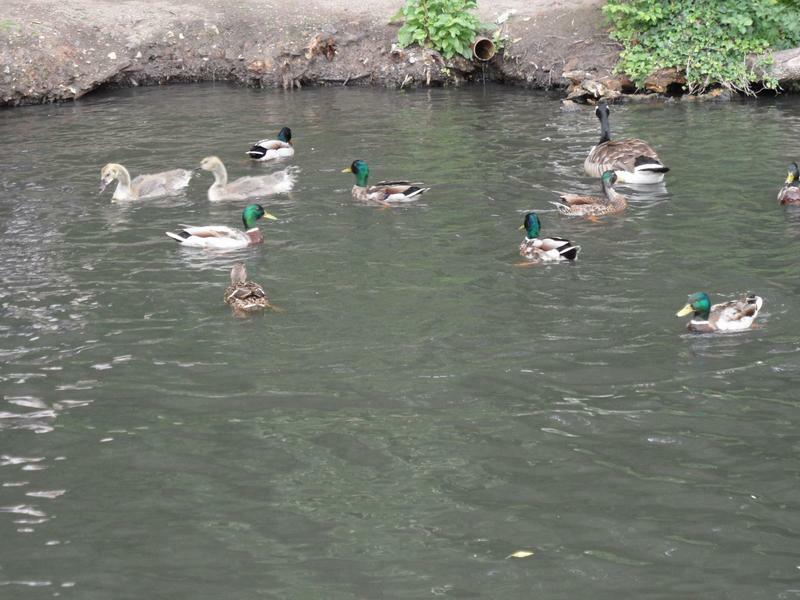 9th June 2013, the most northerly pond is very quiet, just a few Mallards out of the water. 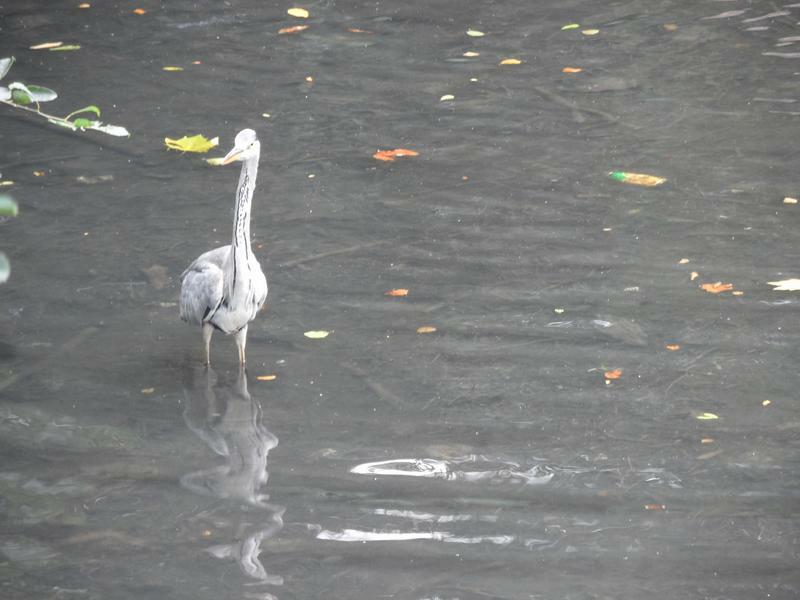 One of the herons that has been decimating the duckling population. 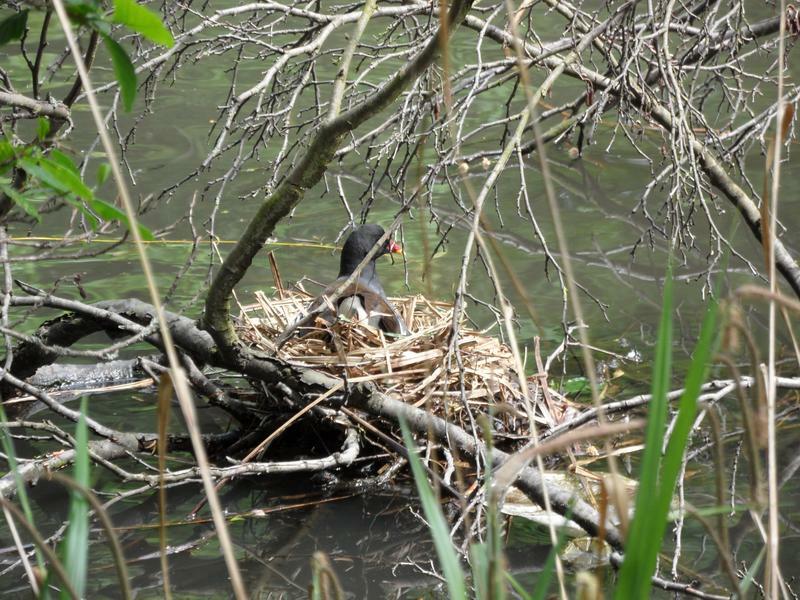 The Moorhen nest box still has occupants. 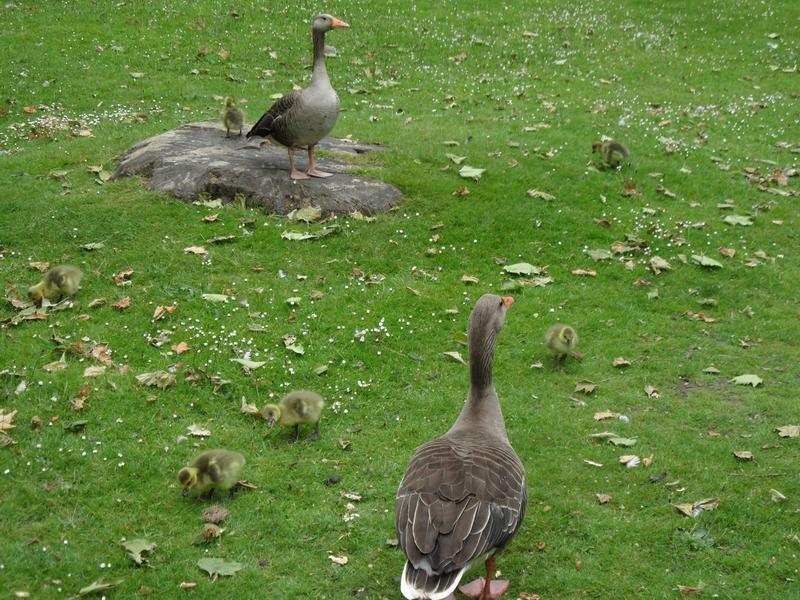 First time we've seen goslings at this park this year, near the northern pond. 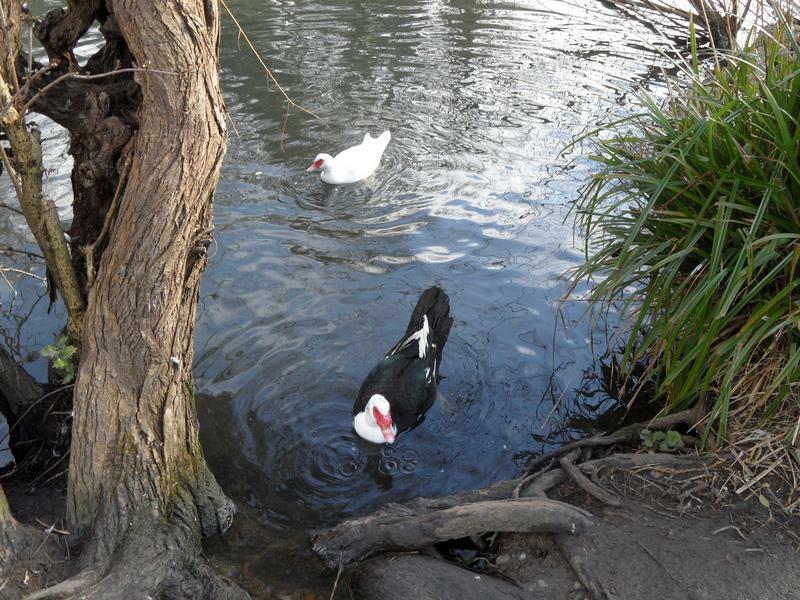 We were told the two Muscovy ducks have a nest in this box, but the eggs have not hatched after four weeks. 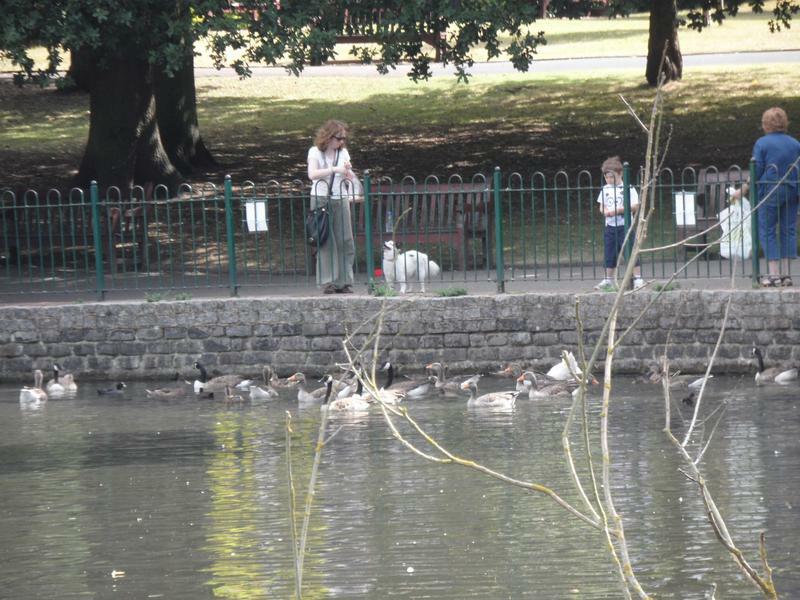 A few more birds on the central lake, following me down the dog free side of the park. 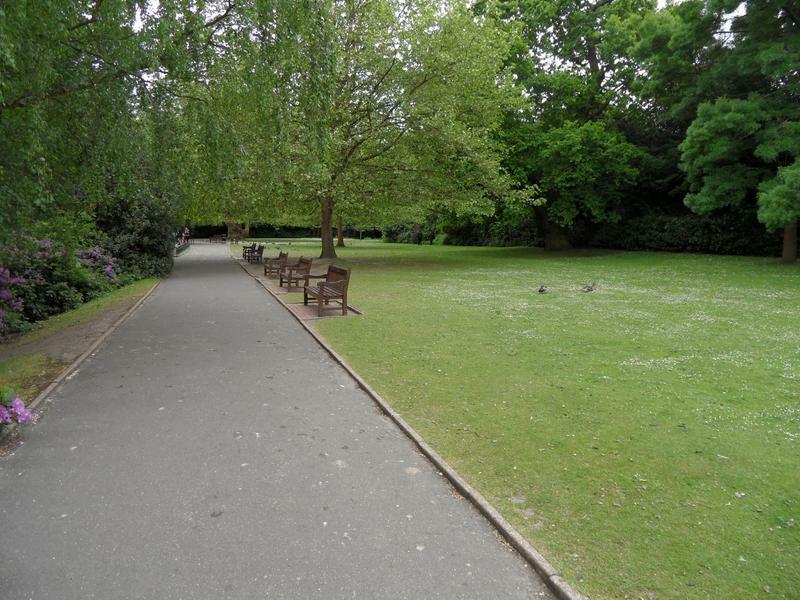 The dog free side is more formal planting and lawns than the doggy side. 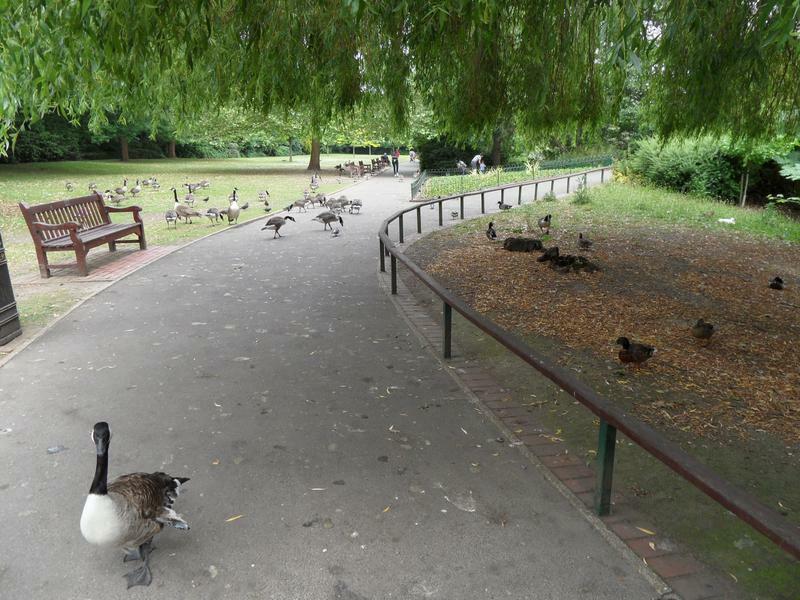 The feeding area next to the children's playground and cafe in the distance on the far side. 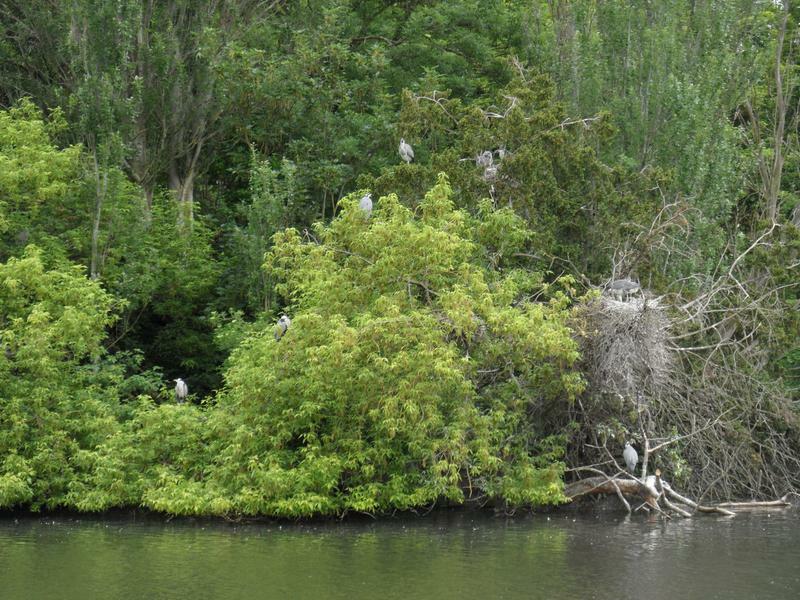 How many herons can you count on the island? 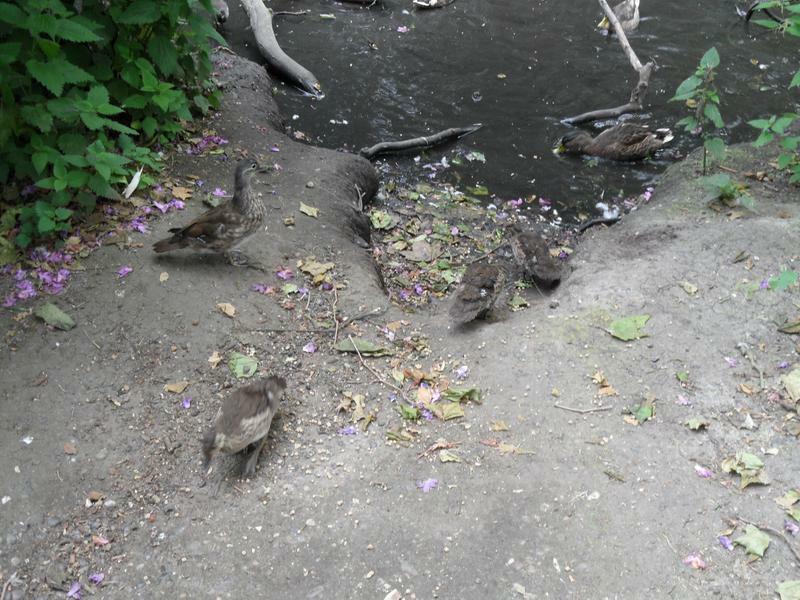 Closer shot of the feeding area near the cafe. 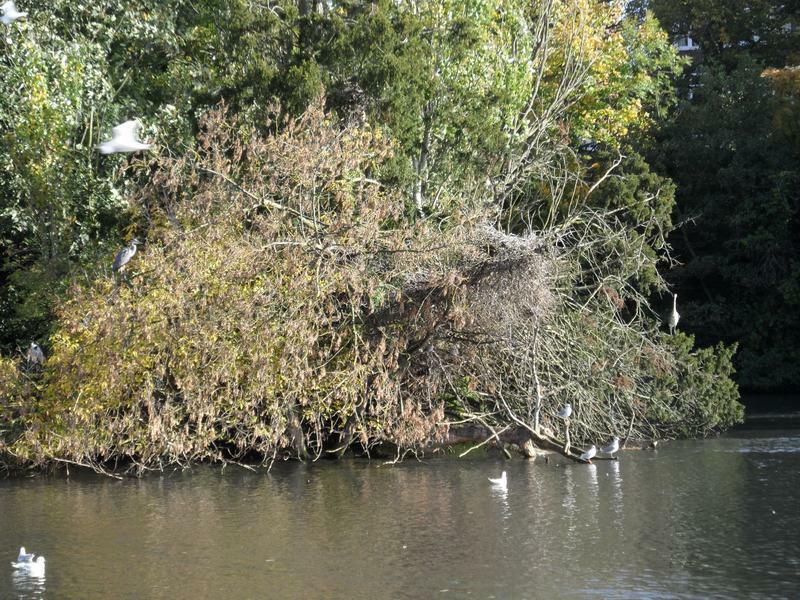 A lot of birds sheltering on this island as well, probably lots of nests, safe from foxes, but not herons. 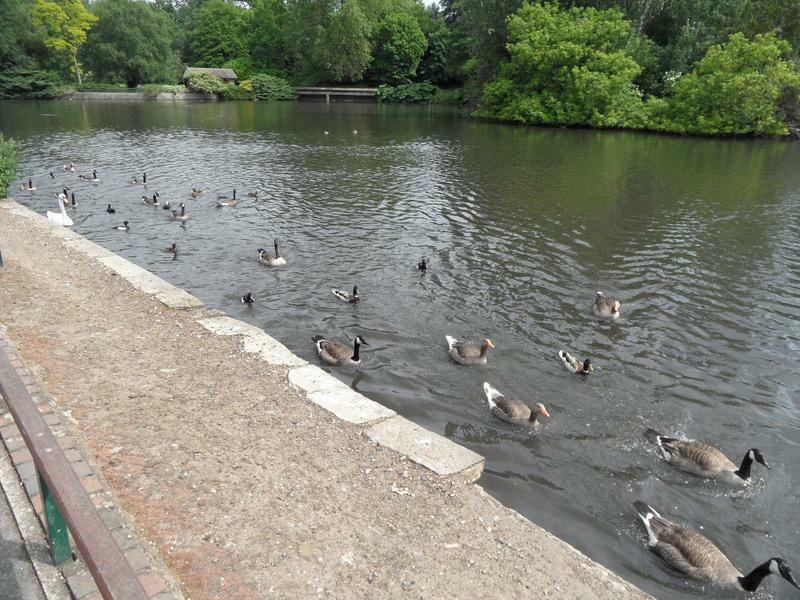 The birds are hungry here as well, heading towards me across the lake. 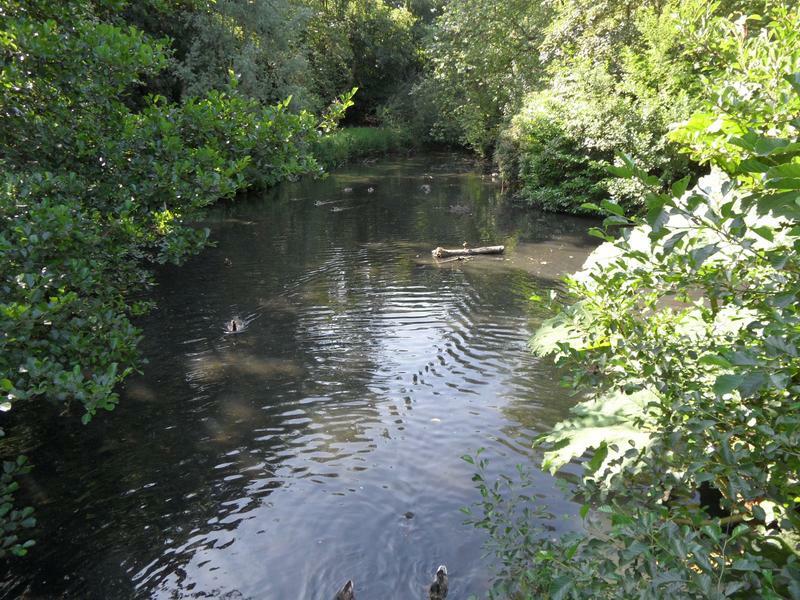 A little further down the path from the last photo, no easy access to the lake so no birds. 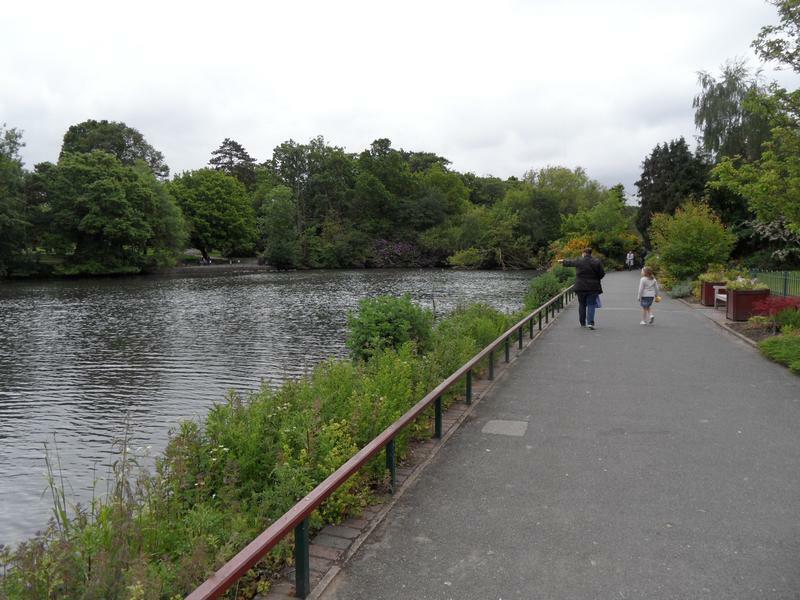 But a little further up the path, next to the high bridge, much more activity on the grass. 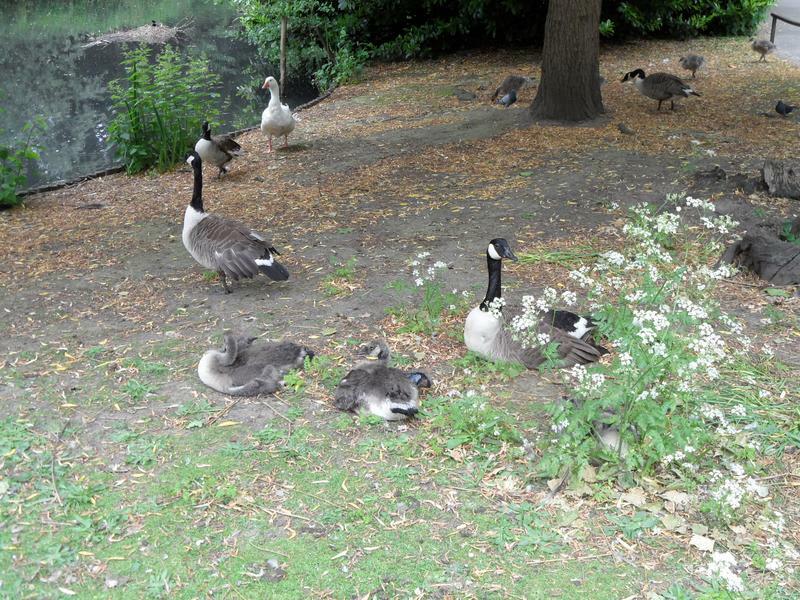 I've found the main goose nursery, several families. 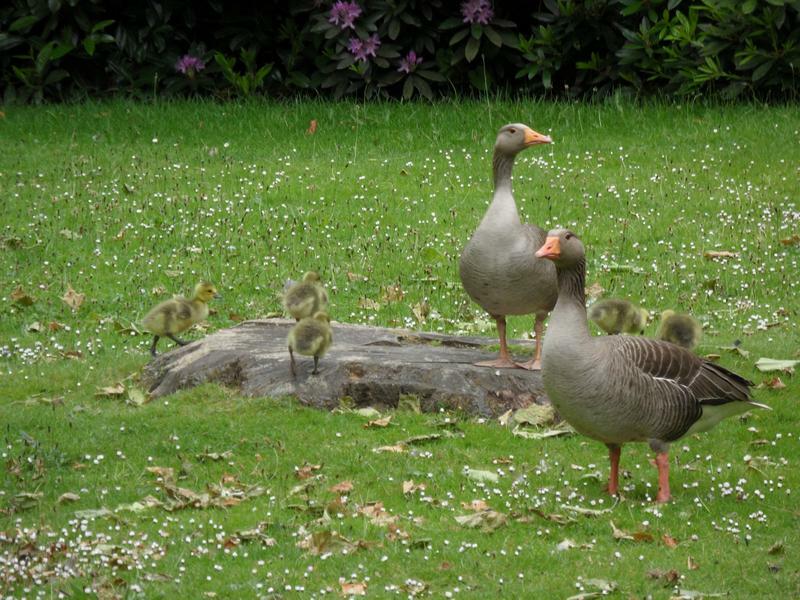 Here nine Greylag geese goslings. 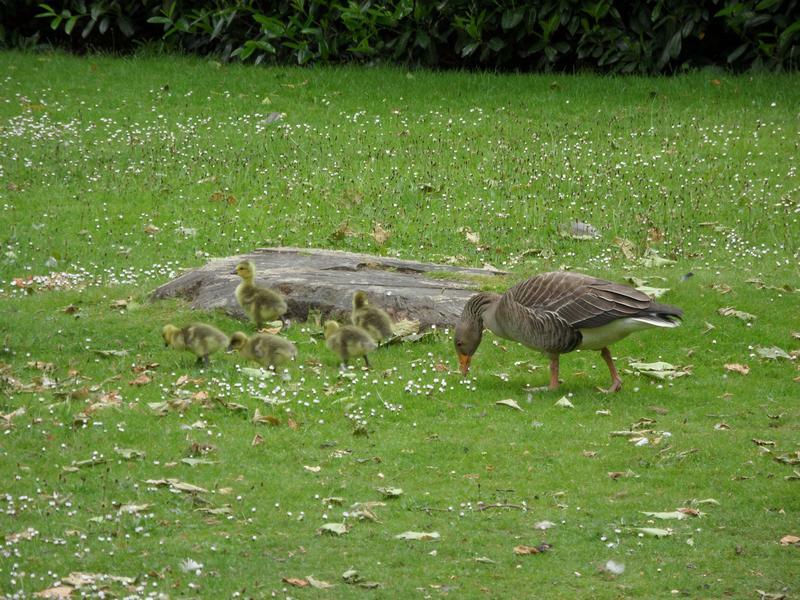 Six more Greylag goslings from a younger family eating my duck pellets. 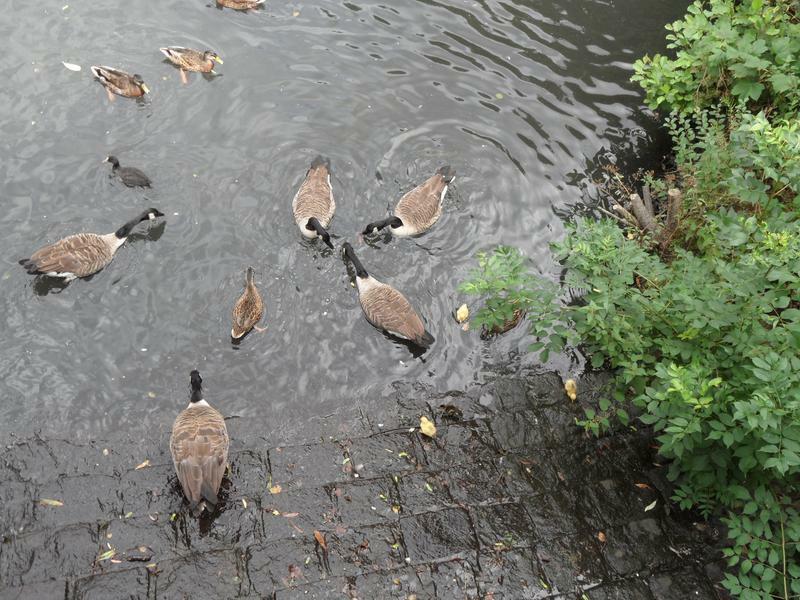 I think this lot are Canada Geese goslings, with one nosey Mallard. 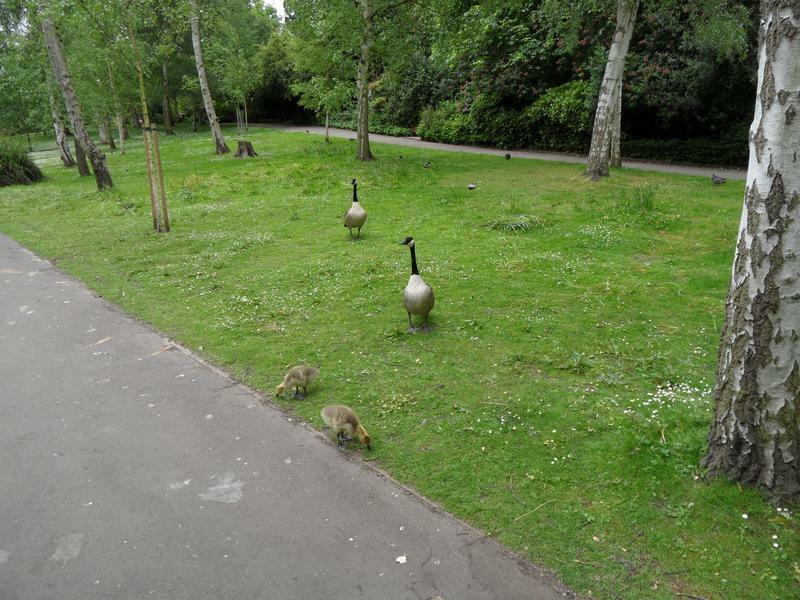 These goslings must be only a few days old. 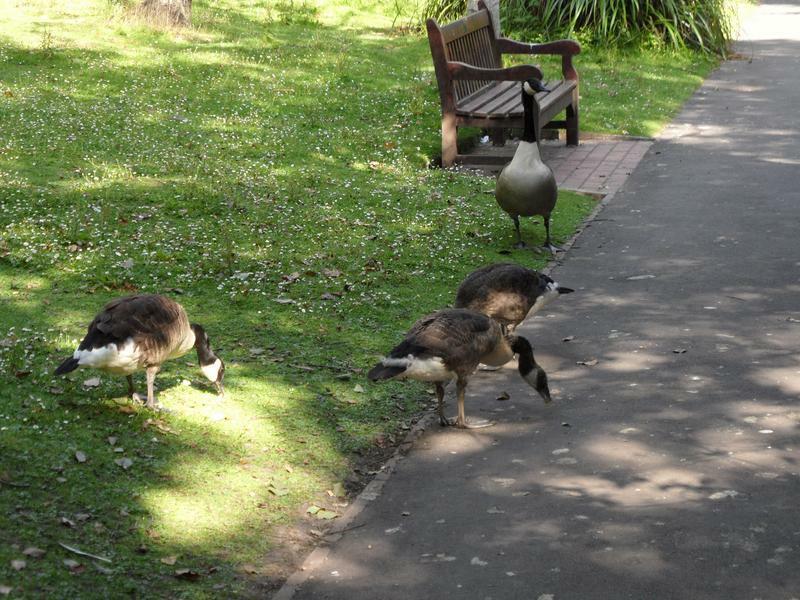 The other side of the path, next to the southerly pond are two more large goslings. 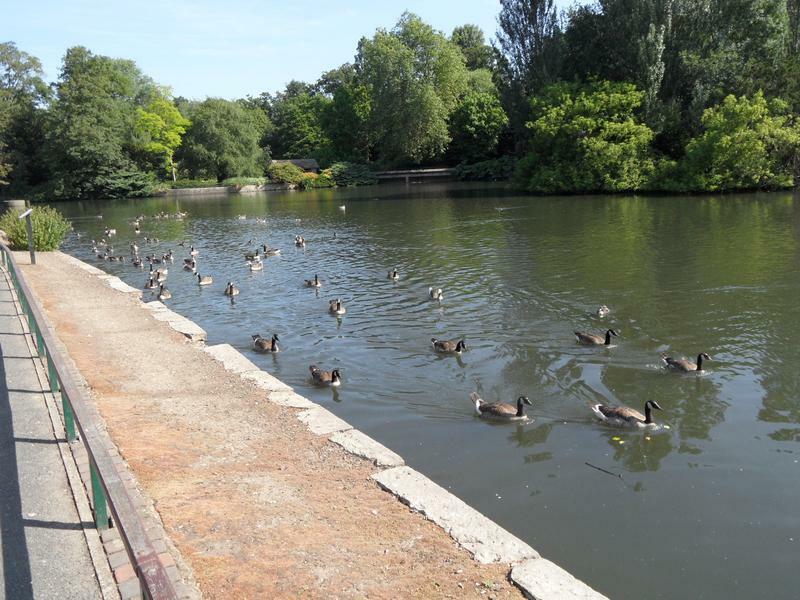 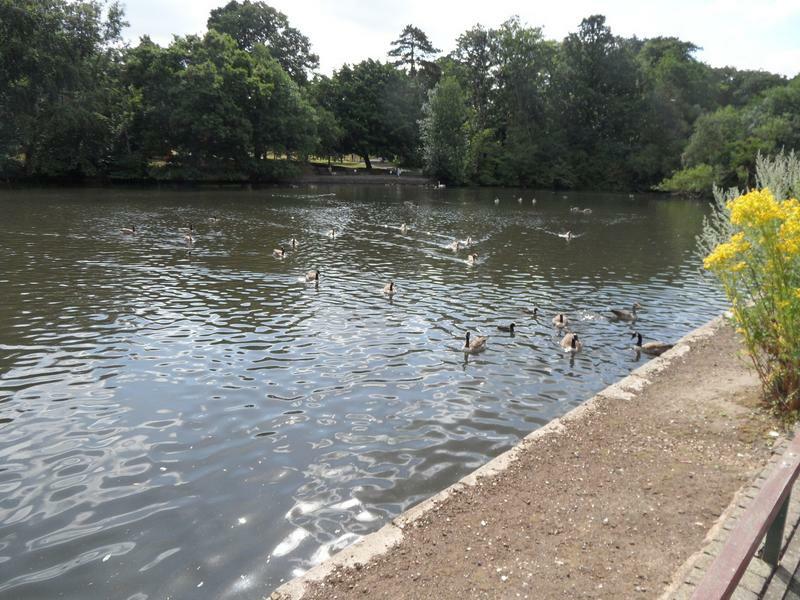 27th June 2013, the two goslings seen last time on grass are now on the northerly pond, the opposite end of the park to the nursery. 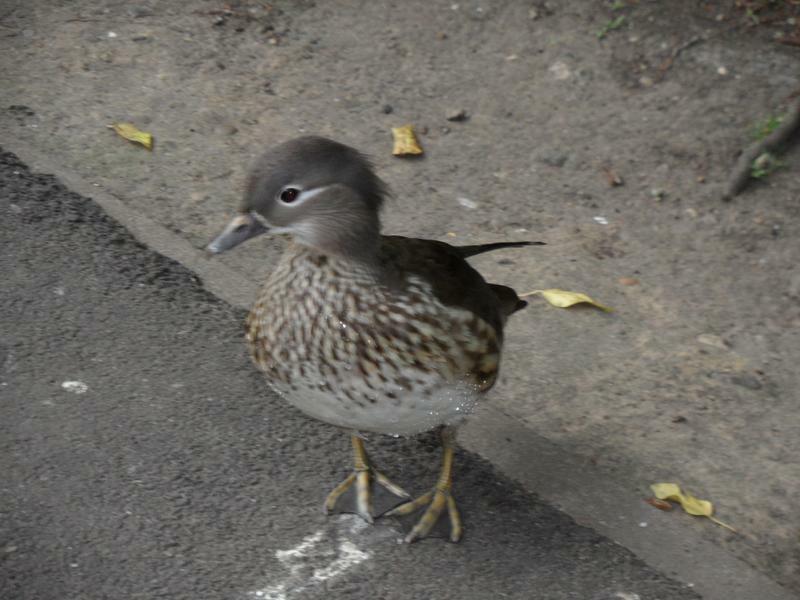 A male Mandarin Duck on the path, having lost almost all his colourful feathers for the summer, which will regrow by October. 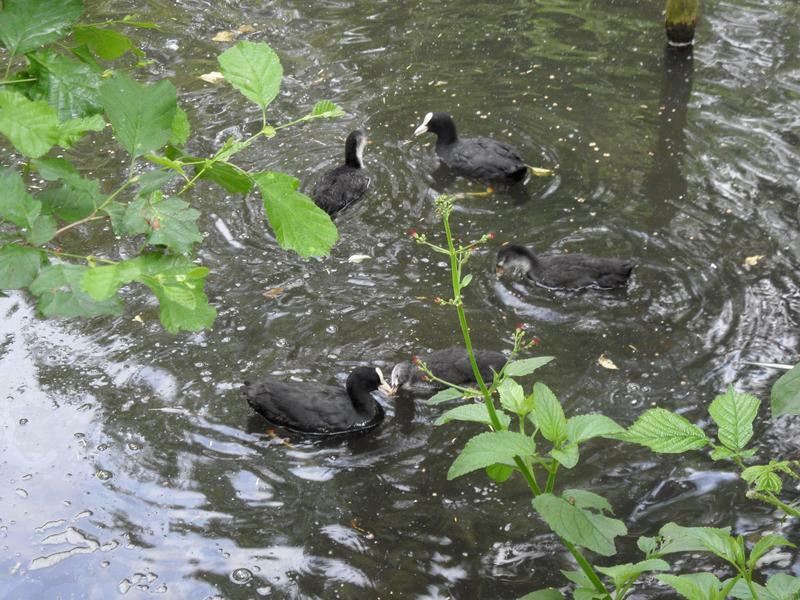 Another Coot family on the top pond. 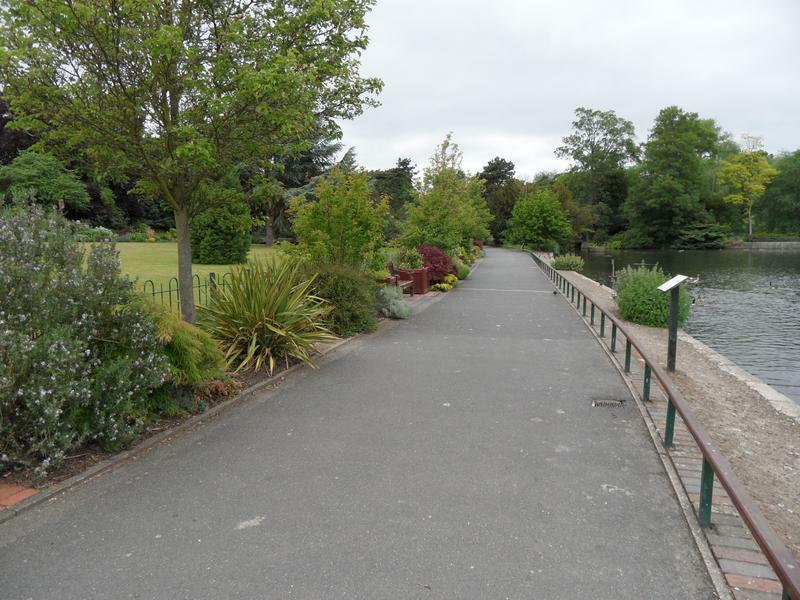 the path, including a squirrel. 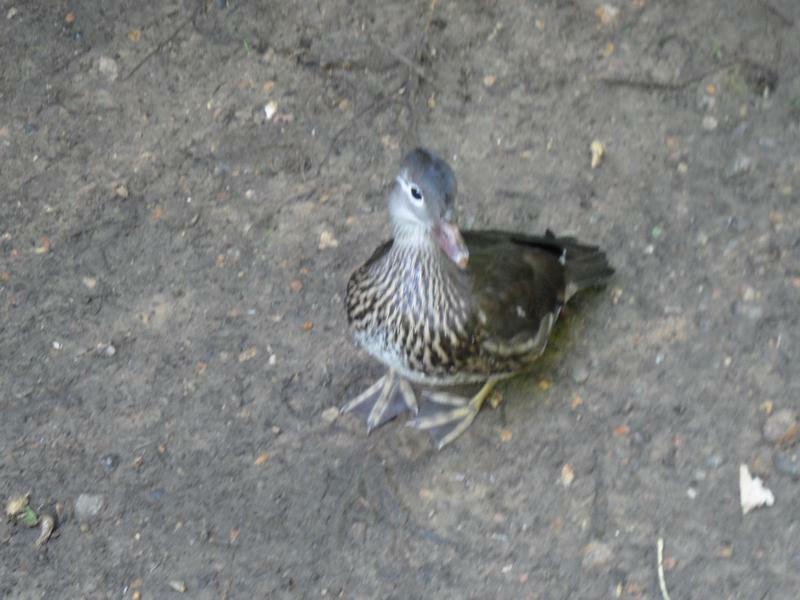 Another Mandarin duck, might be a female or a duckling, there are several similar on this pond (photo later). 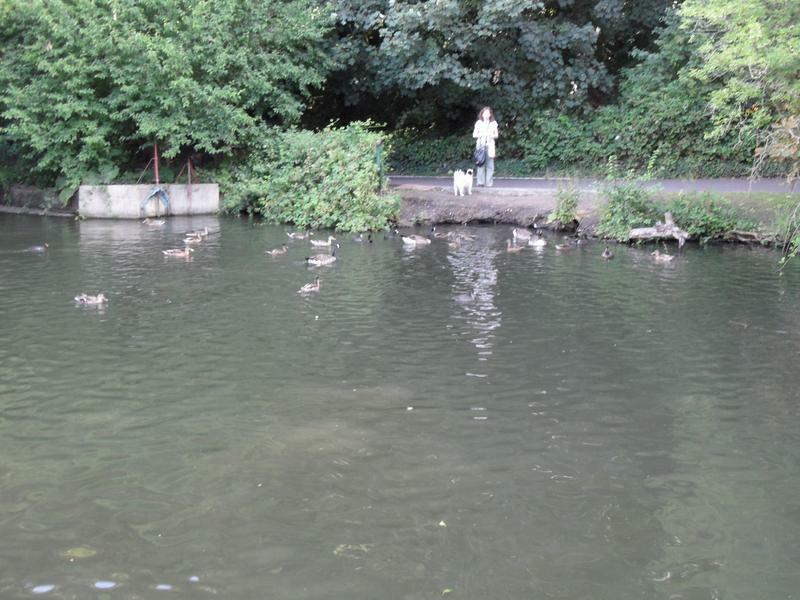 Even on the main lake, everyone is following me including a swan. 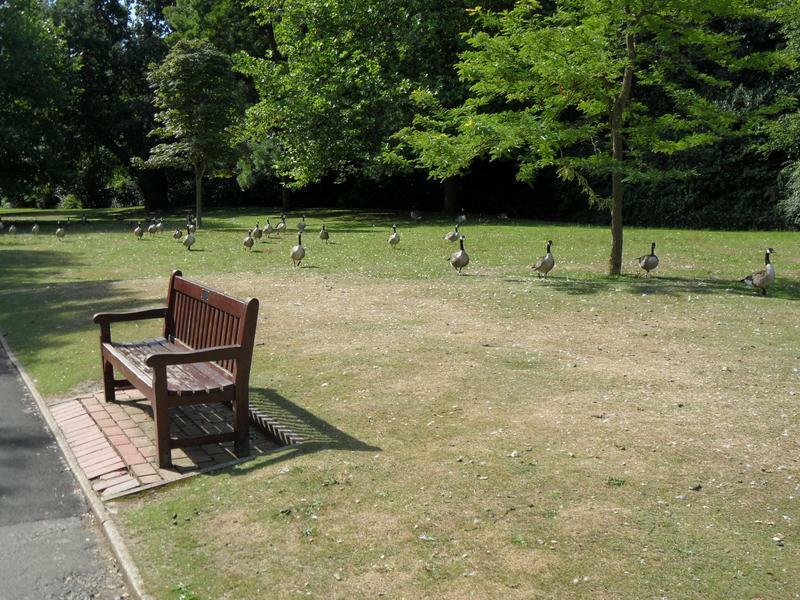 Fewer children around on a school day, mainly push chairs. 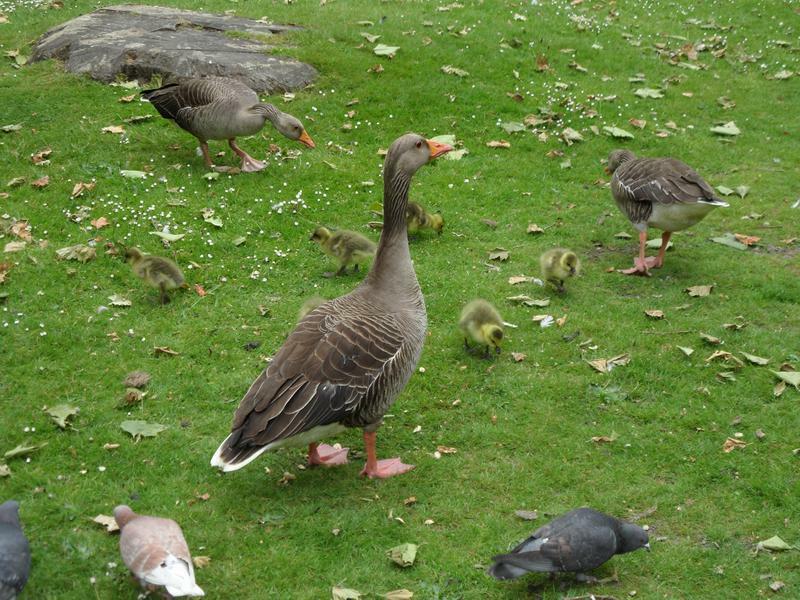 Near the high bridge and the nursery lawn, the goslings are almost fully grown. 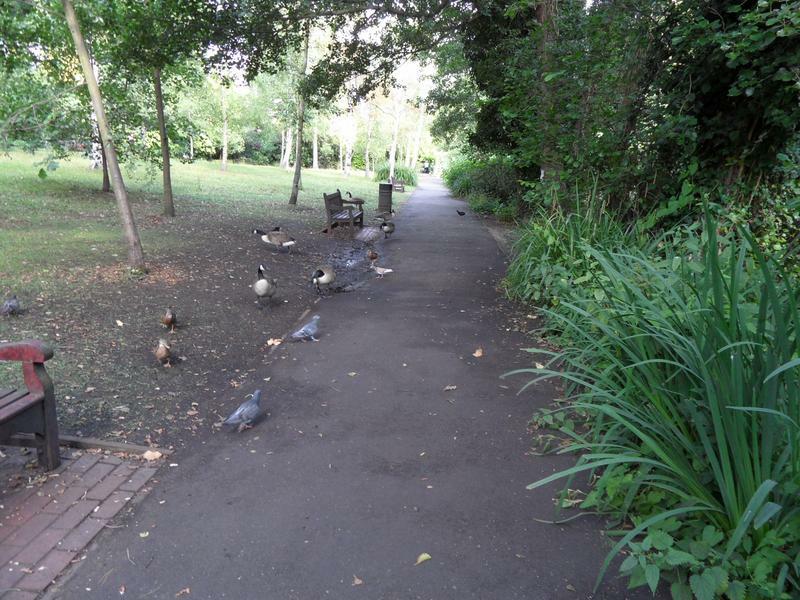 And also quite happy to follow me down the path. 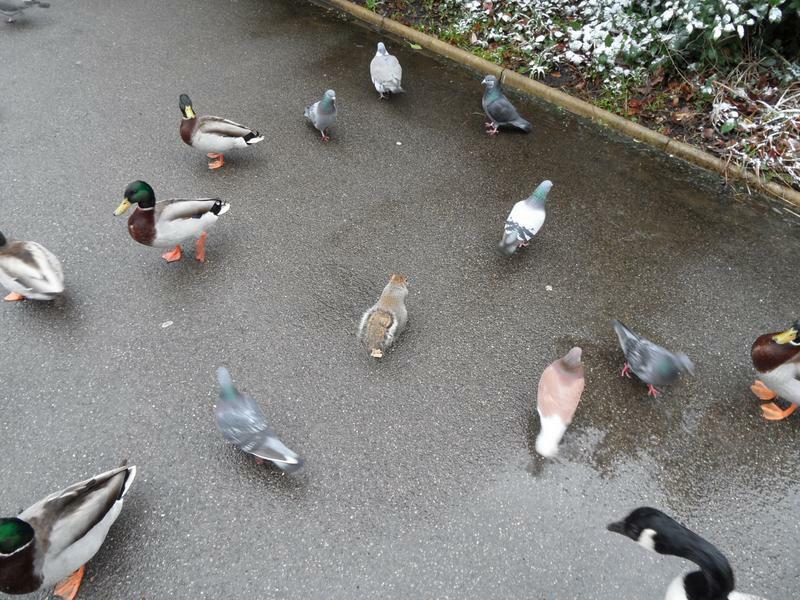 They stay behind a while eating the pellets I scattering, but catch up later. 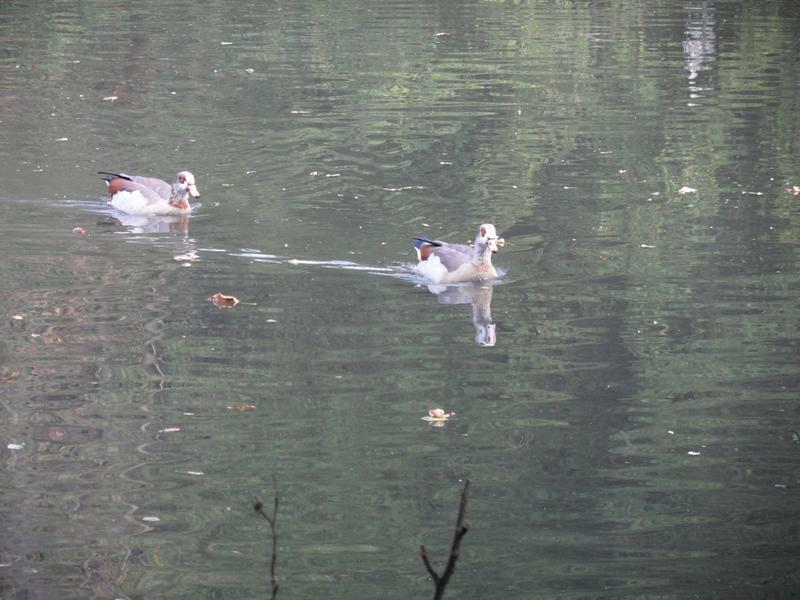 On the most southerly pond which we rarely reach, surprised to find a Mandarin Duck family heading my way. 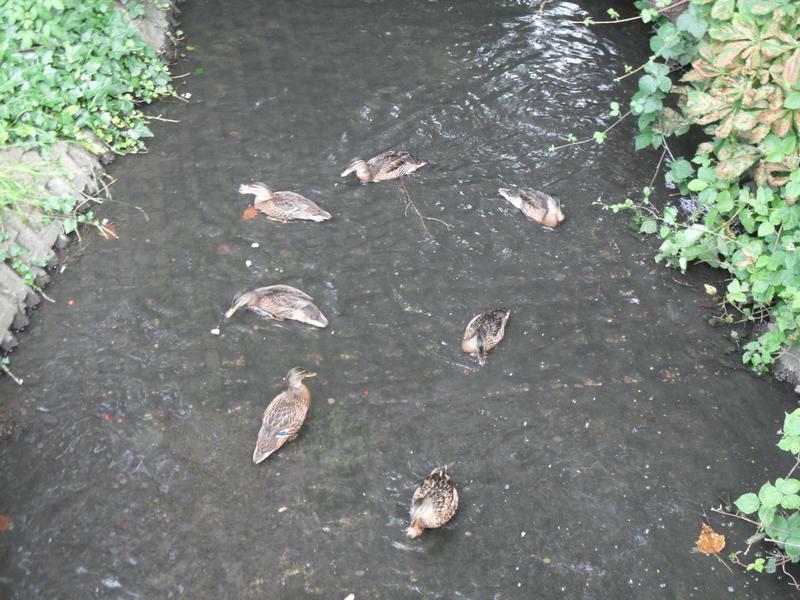 Mandarin ducklings exiting the water. 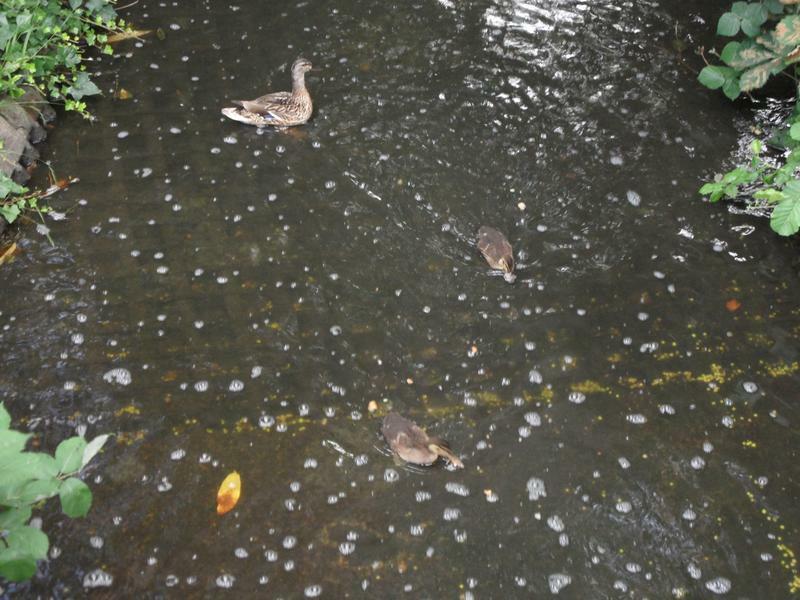 The Mandarin ducklings eating duck pellets, watched by mother, probably four weeks old. 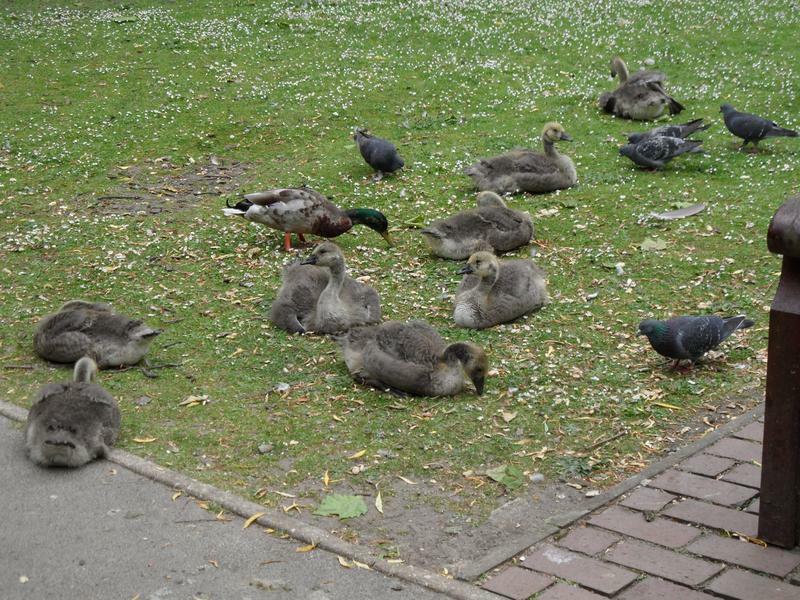 Not the best place to take photos of such ducks, they would look better against grass. 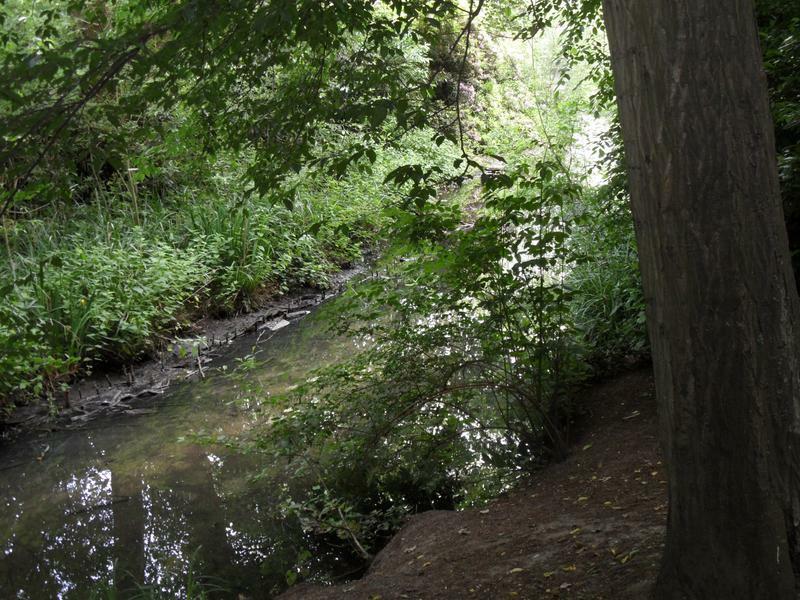 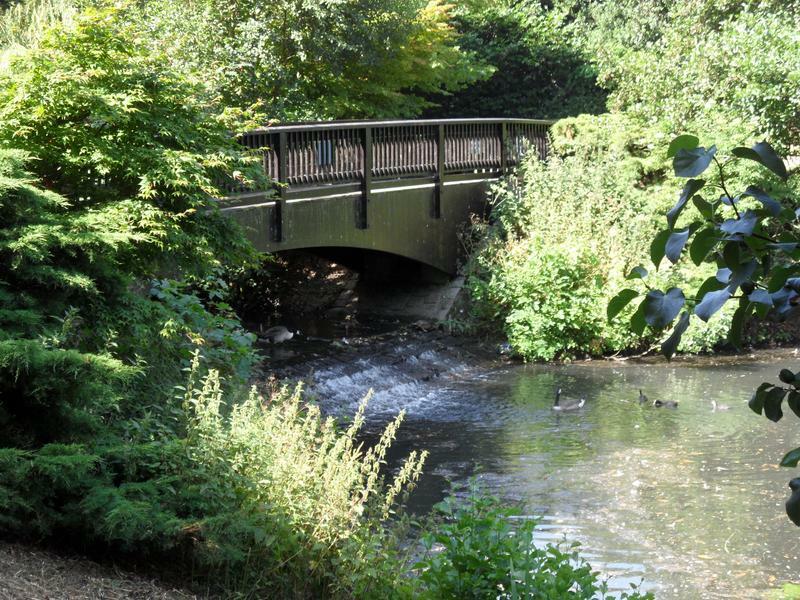 The stream entering the southern end of Kelsey Park. 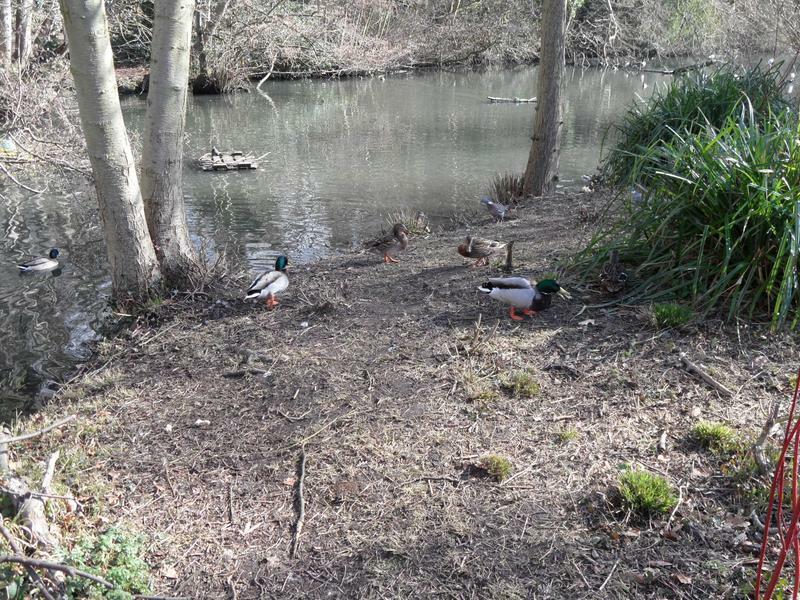 The beach area were the Mandarins just got fed, from the opposite bank, geese looking for left overs. 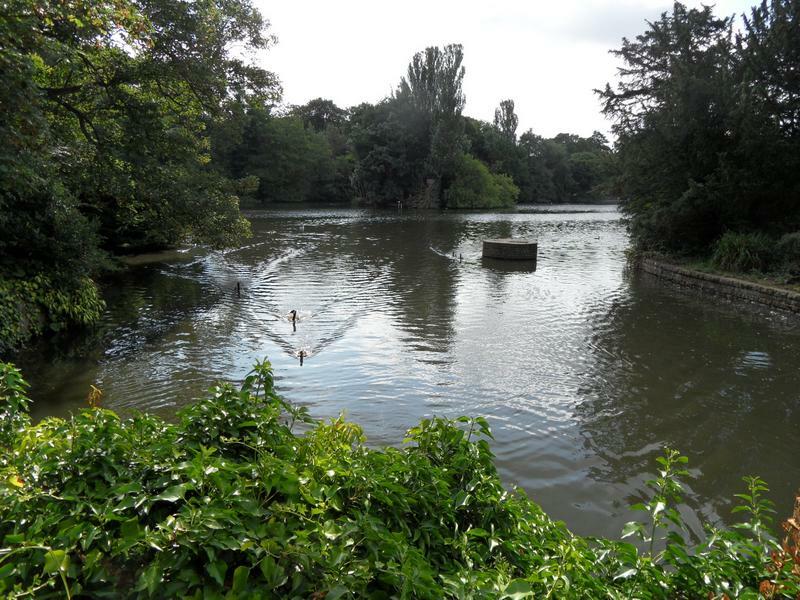 The southerly end of the main lake. 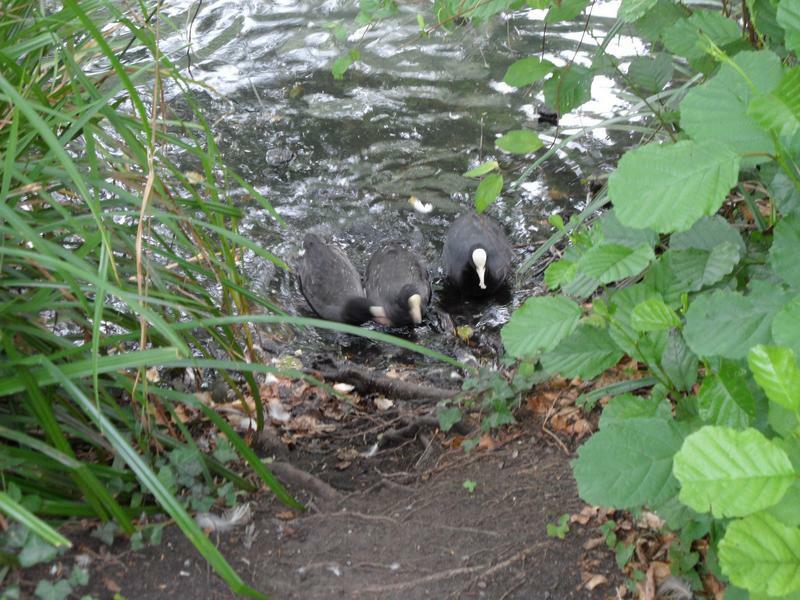 Another Coot family on the main lake. 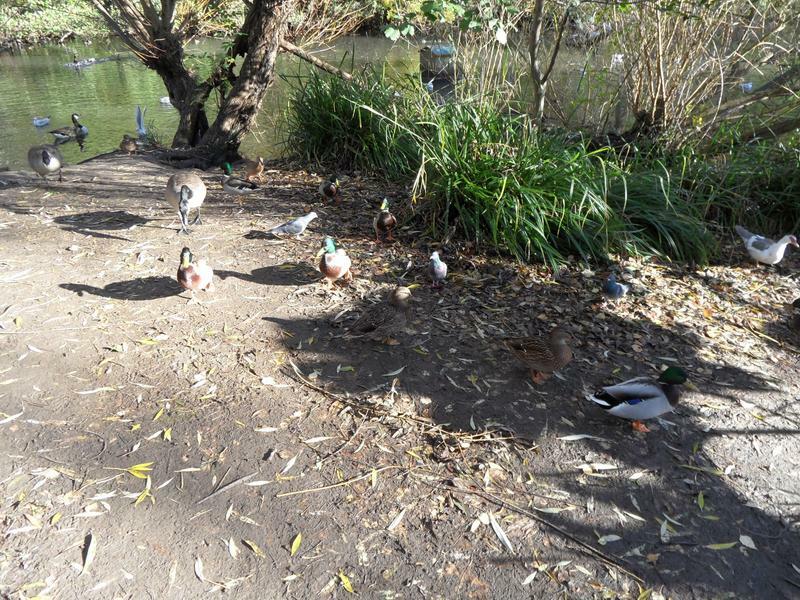 Back at the other end of the park, more Mandarin ducks in the shade of the trees, either a lot of females or another family. 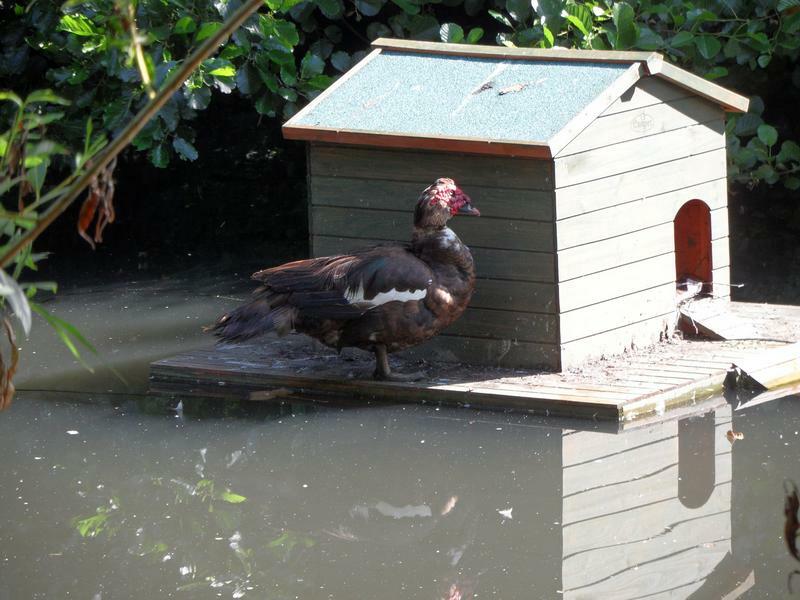 A Muscovy duck I've not seen before, taking shade from the floating duck house. 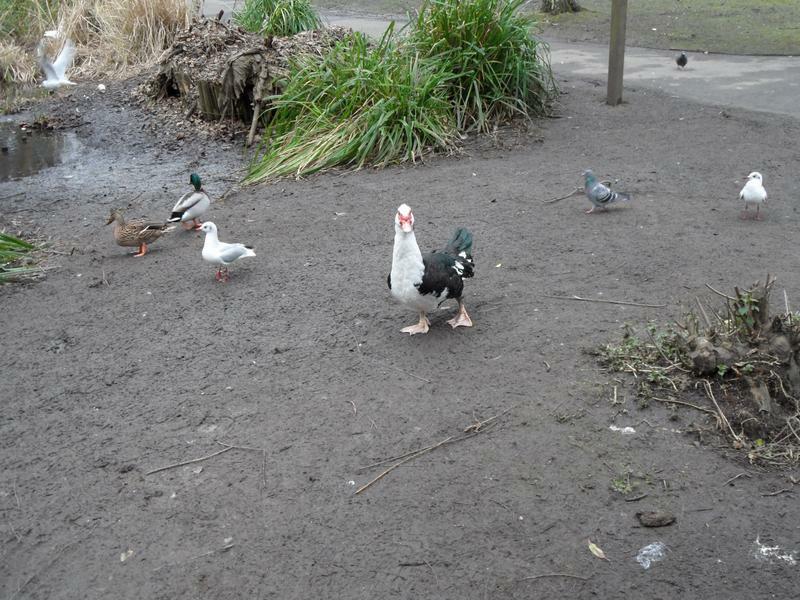 on this beach as well, but the photos were out of focus. 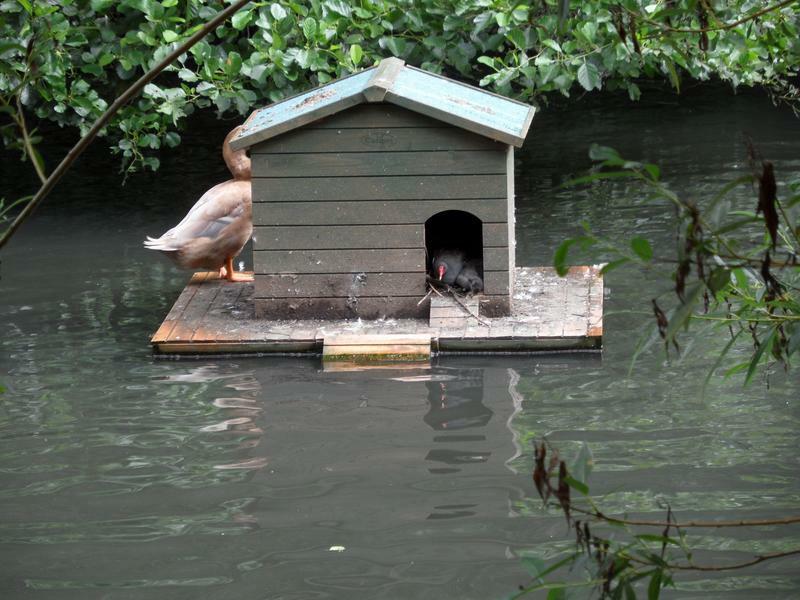 Another new Muscovy duck sitting on the other floating duck house, don't think either are Boris who has different colours. 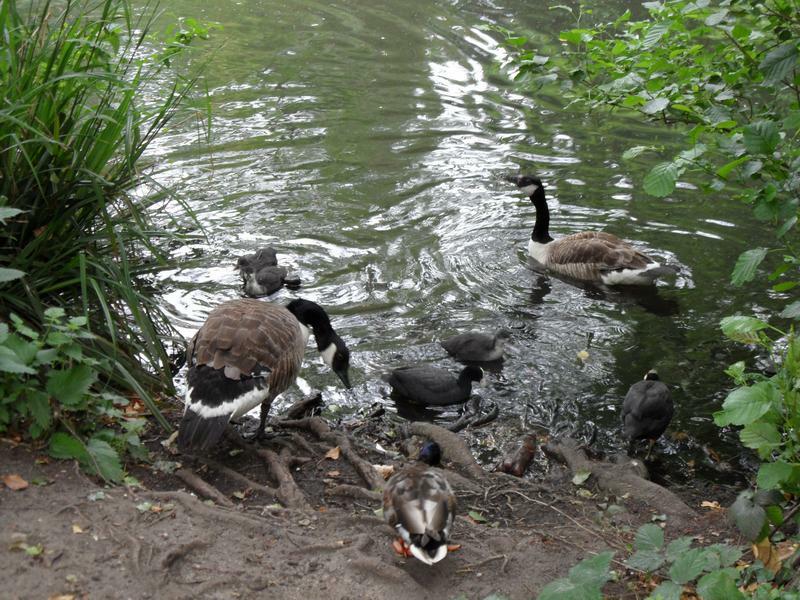 One of the geese families, still together. 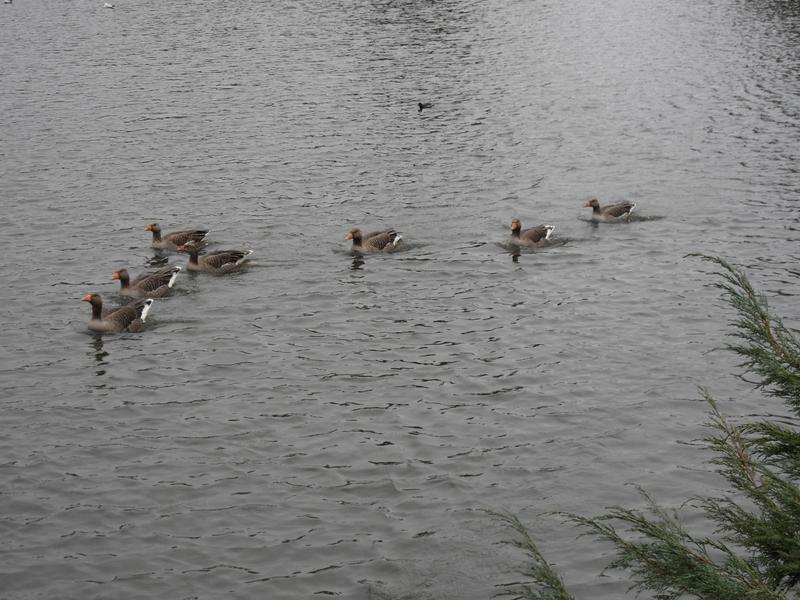 On the main lake, lots of Greylag geese, some of which seemed smaller so were probably families. 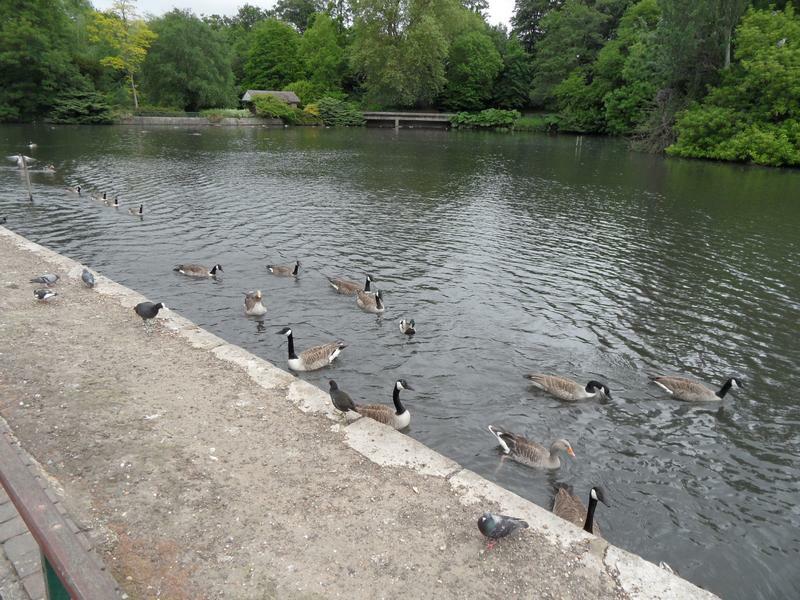 Not many people feeding this early, so they all follow me down the lake. 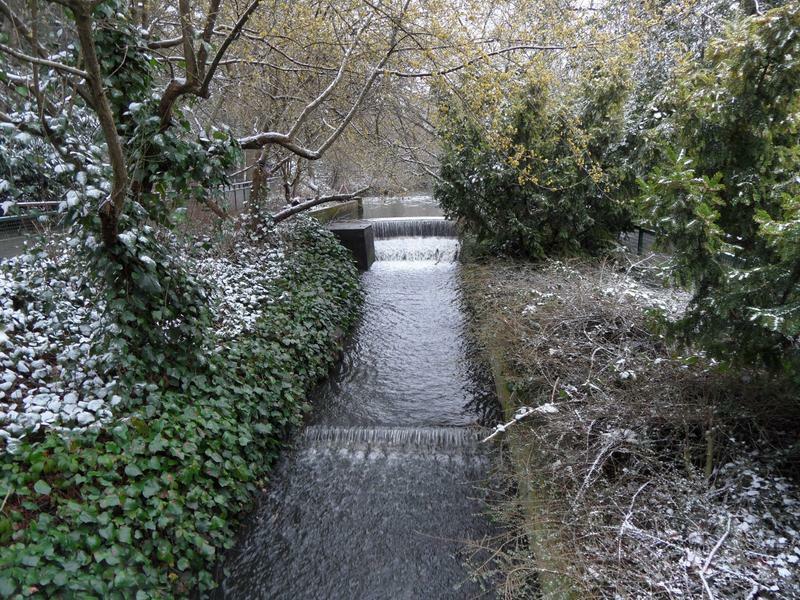 The high bridge at the southern end of the park, over a small weir. 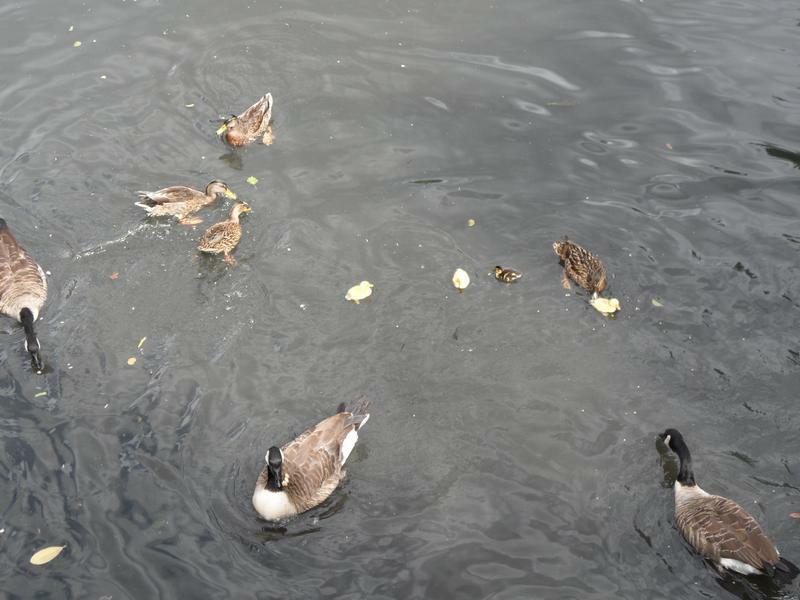 Plenty more hungry birds behind the large island. 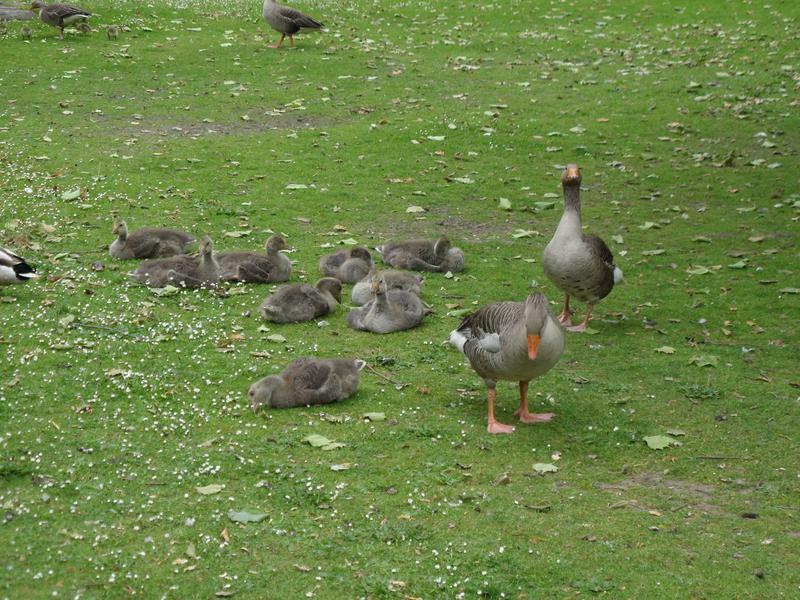 All the goslings are now fully grown, really just fluffy necks and their calls that distinguish them now. 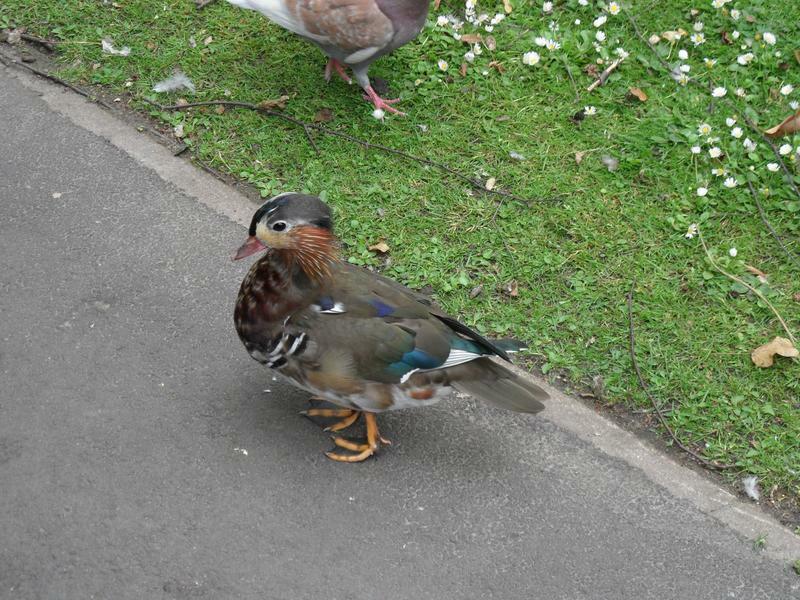 Mandarin duck in the park today. 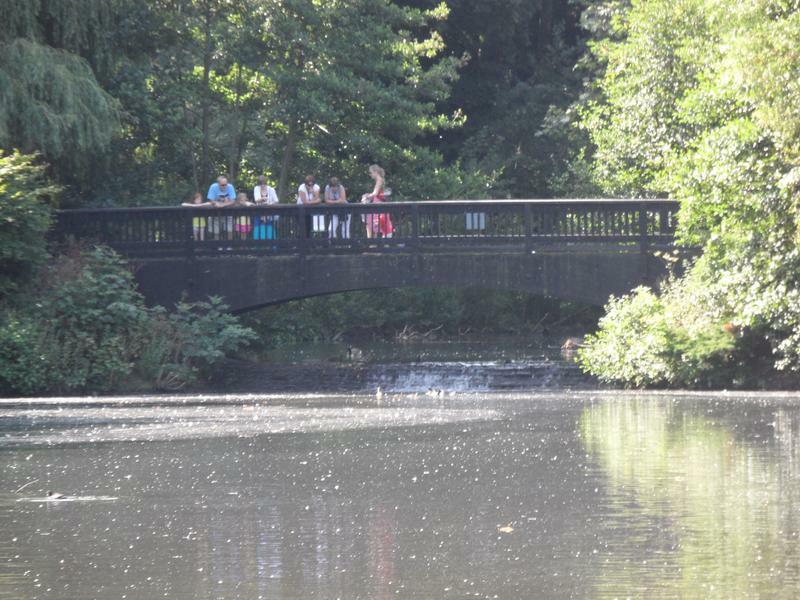 Close shot of the southern bridge. 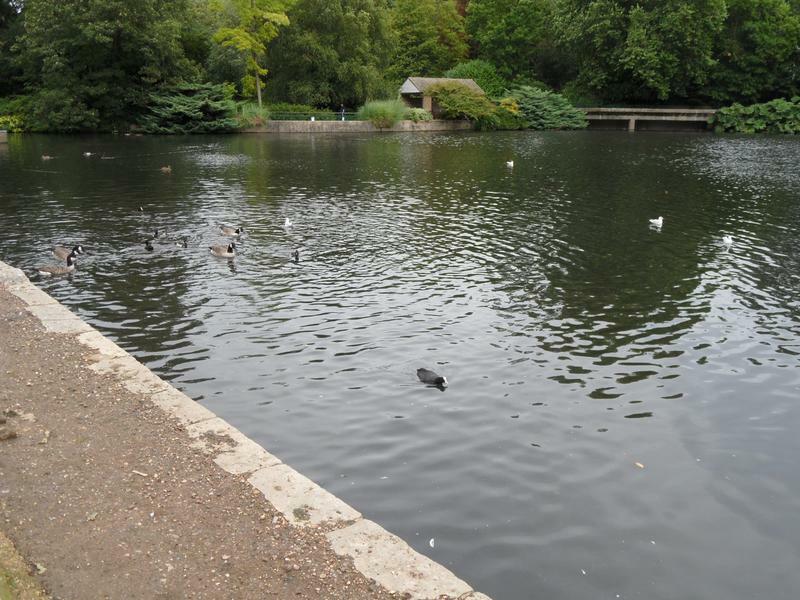 The main lake seems quiet. 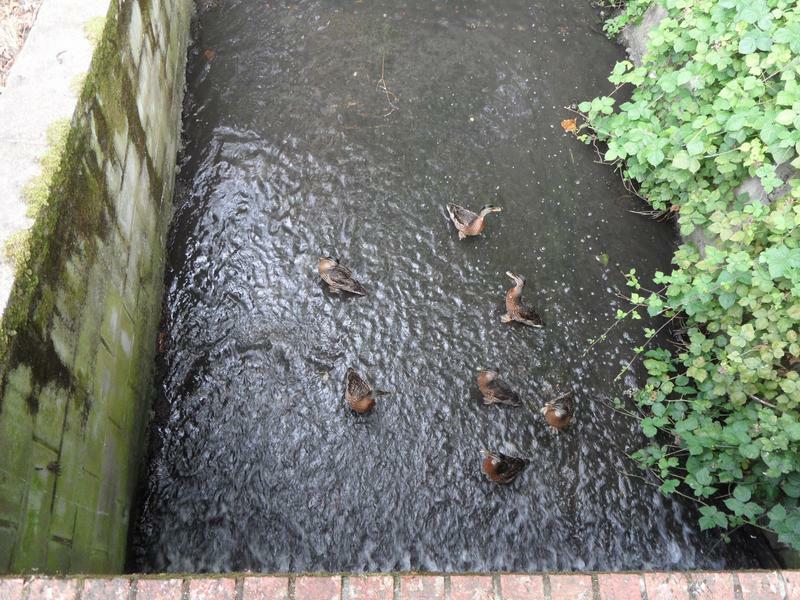 The ducklings follow mother to safety, I'm throwing duck pellets down from the bridge but the stream is moving so fast that few are caught. 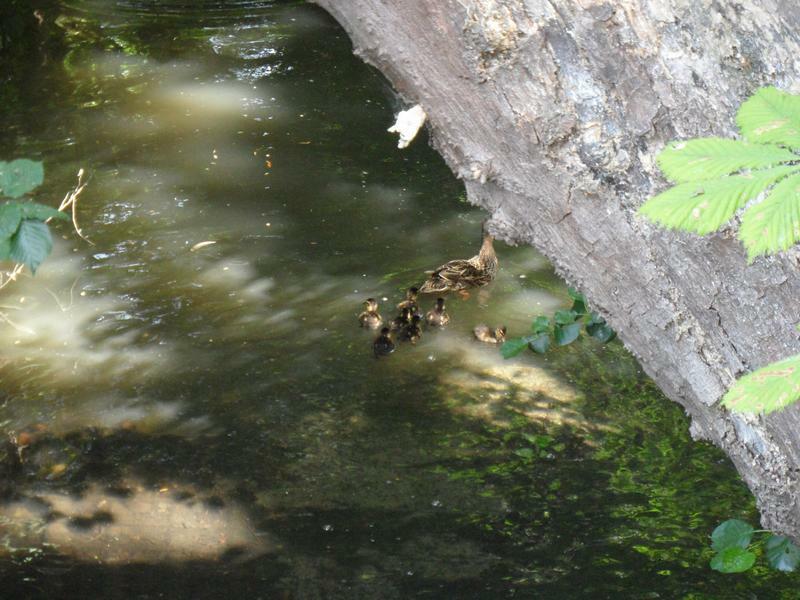 Closer shot of the Mallard family, about one week old. 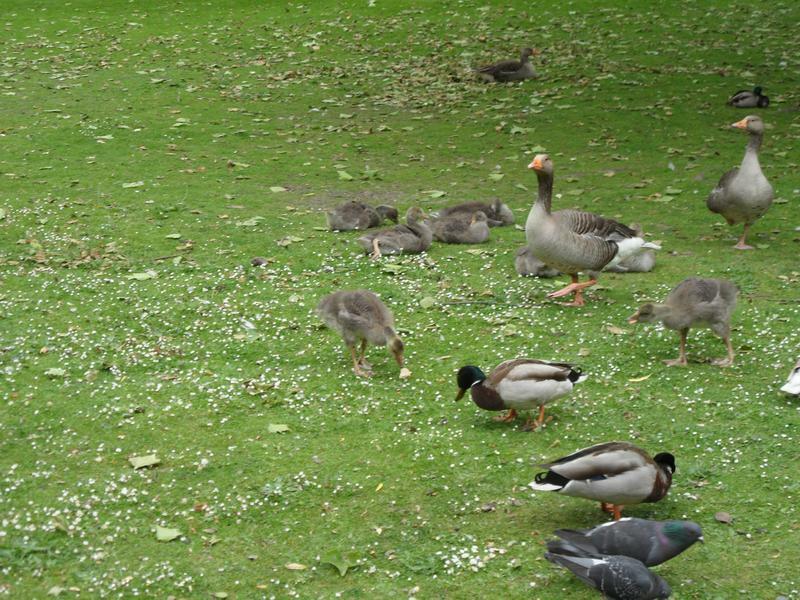 be two families, foreground and almost hidden under the trees. 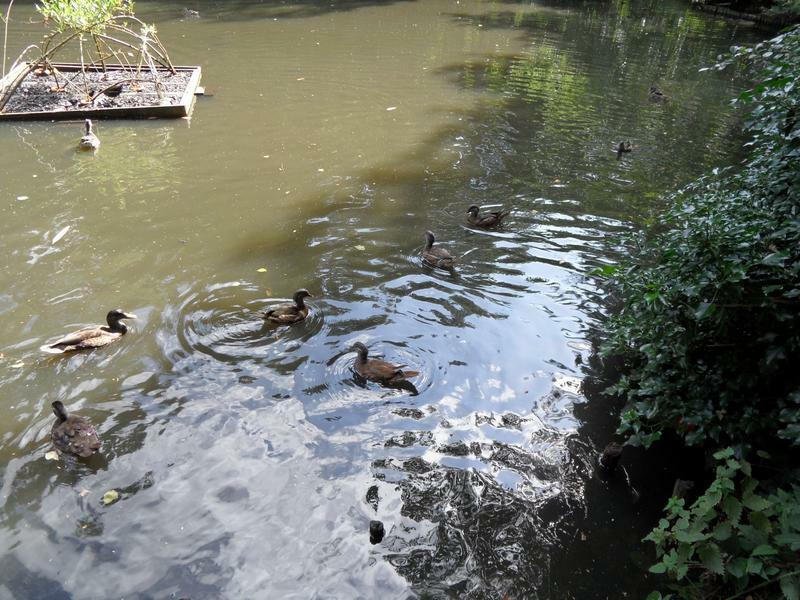 The larger ducklings are getting better at catching food. 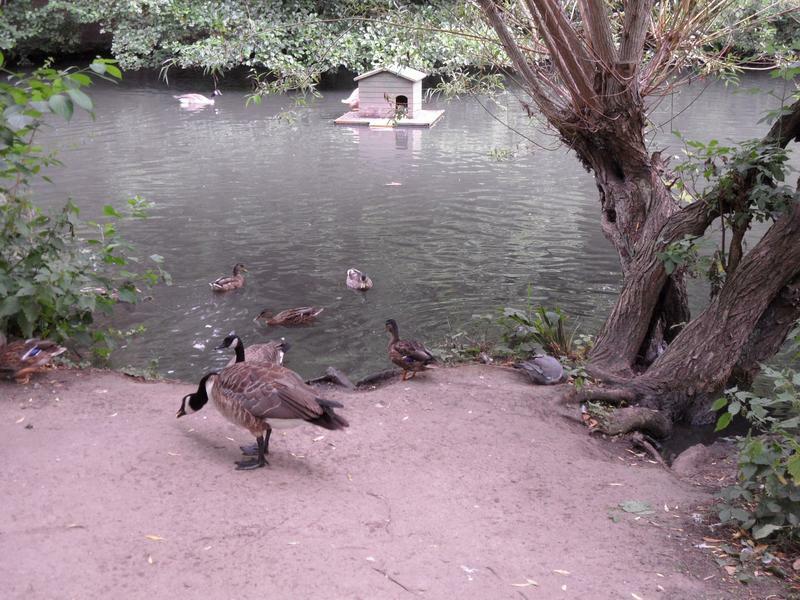 The top pond is relatively quiet, a few geese and mallards. 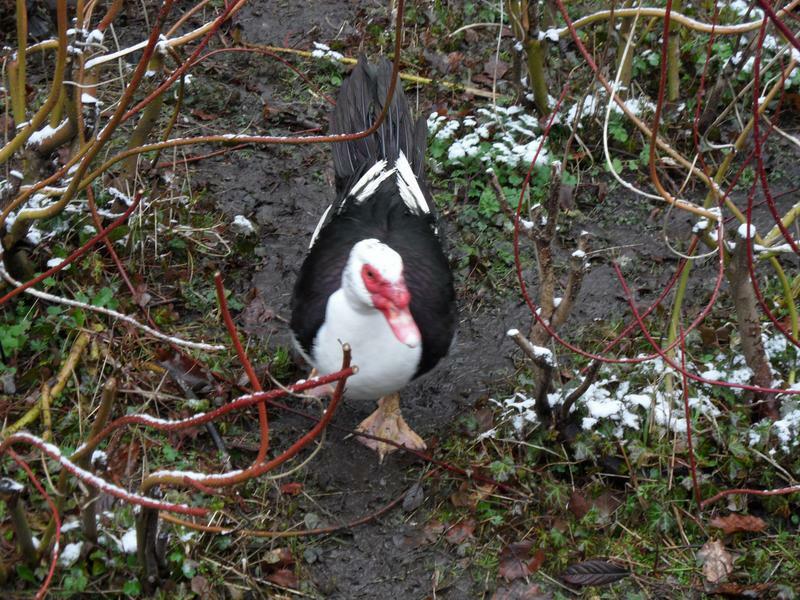 The large Muscovy duck I first saw recently is now looking for food, with the two white Muscovy's in the background. 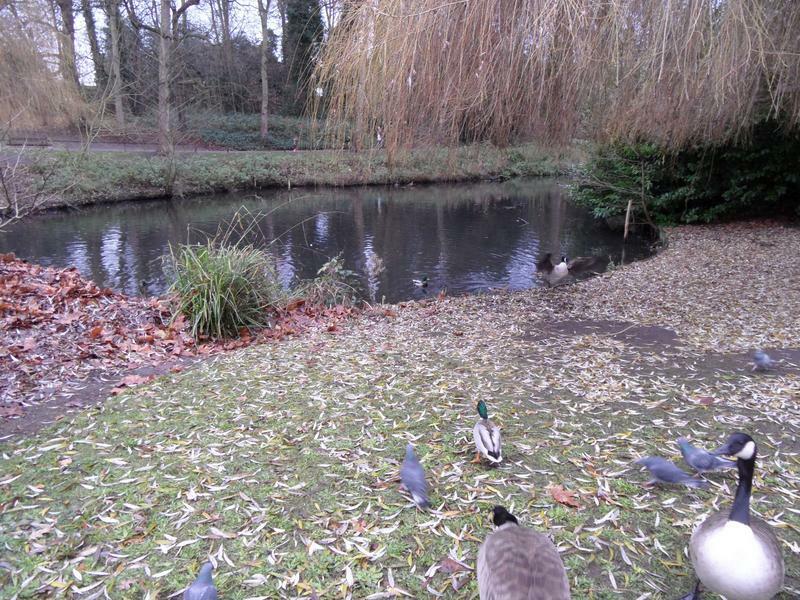 And within a few seconds, many more geese and ducks, and a few pigeons, arrive for breakfast. 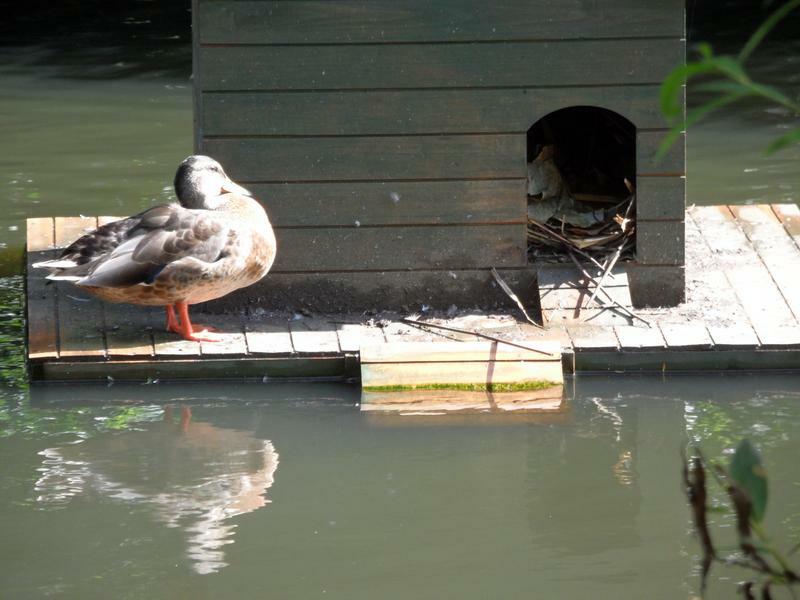 Not sure why this Mallard is waiting outside the nest box, it's usually Moorhens inside. 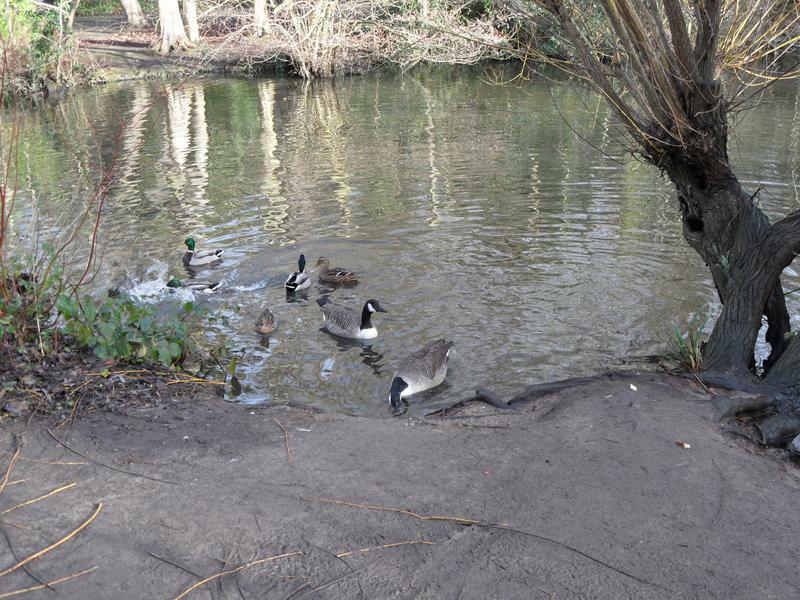 Several geese and ducks are following me down the path. 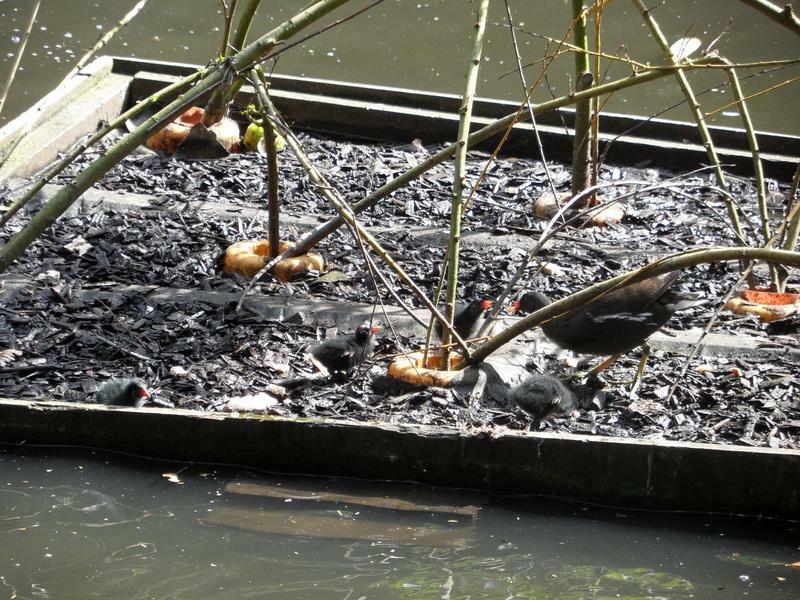 A Moorhen family on one of the floating rafts, mother feeding three chicks. 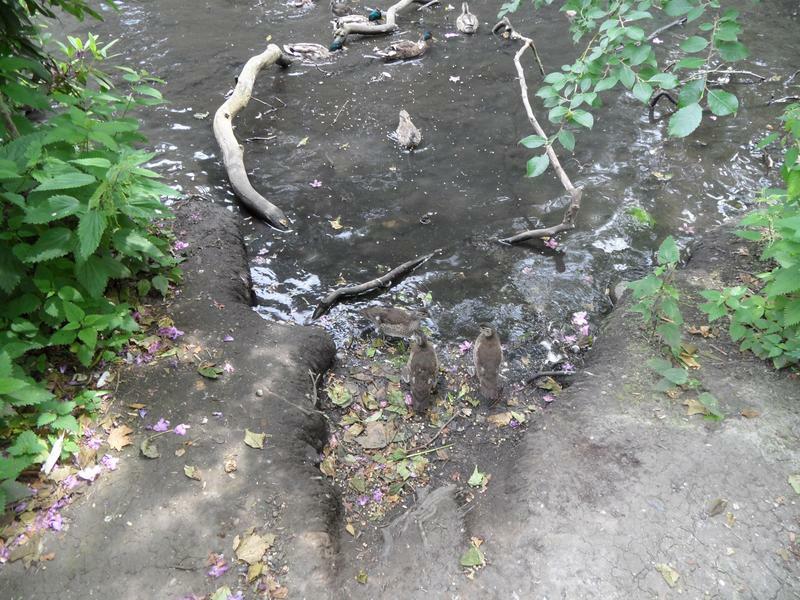 The rafts will look better once some vegetation grows. 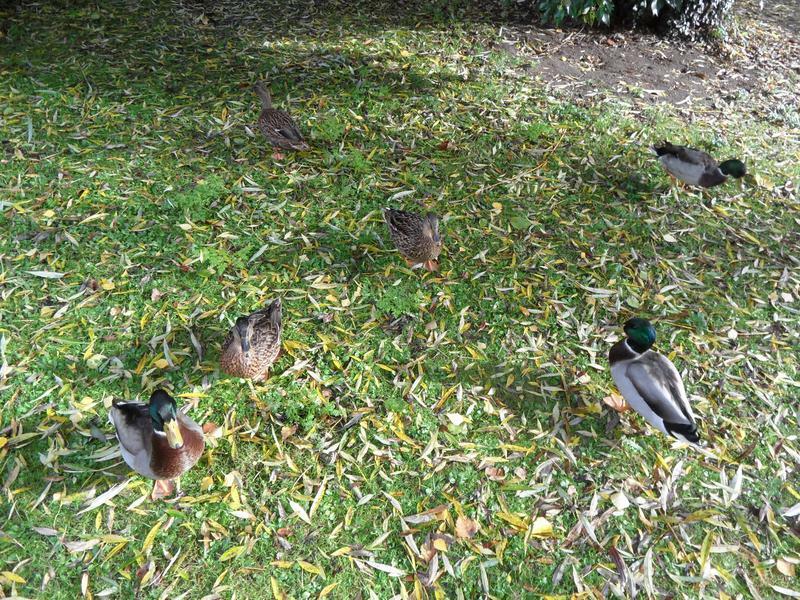 Meanwhile Mallards and Mandarin have breakfast. 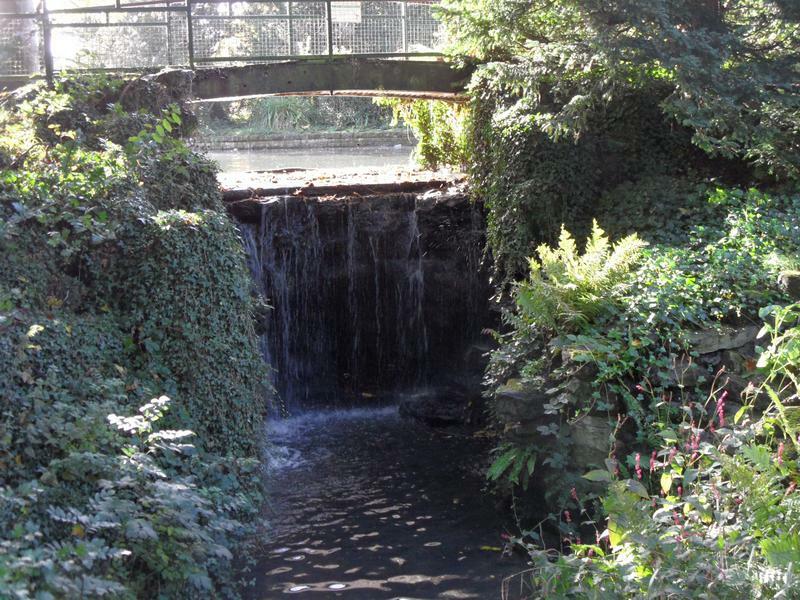 The waterfall between the main lake and the lower lakes. 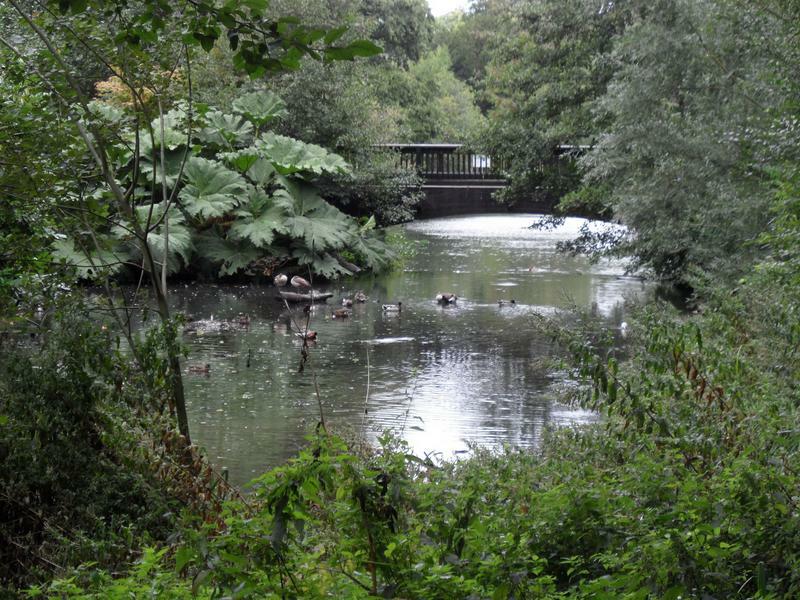 The main lake from the bridge over the waterfall, ducks heading my way already. 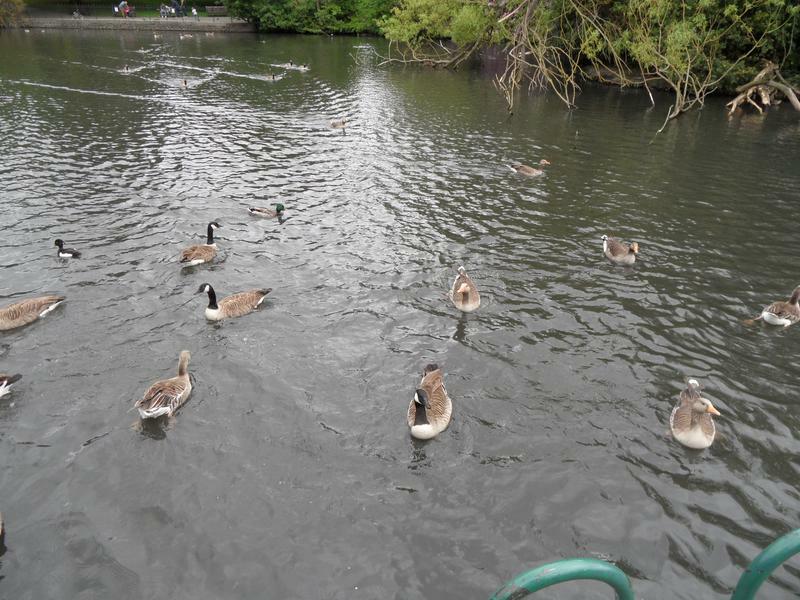 Further up the main lake, lots of hungry Greylag and Canada Geese, Mallards and Coots. 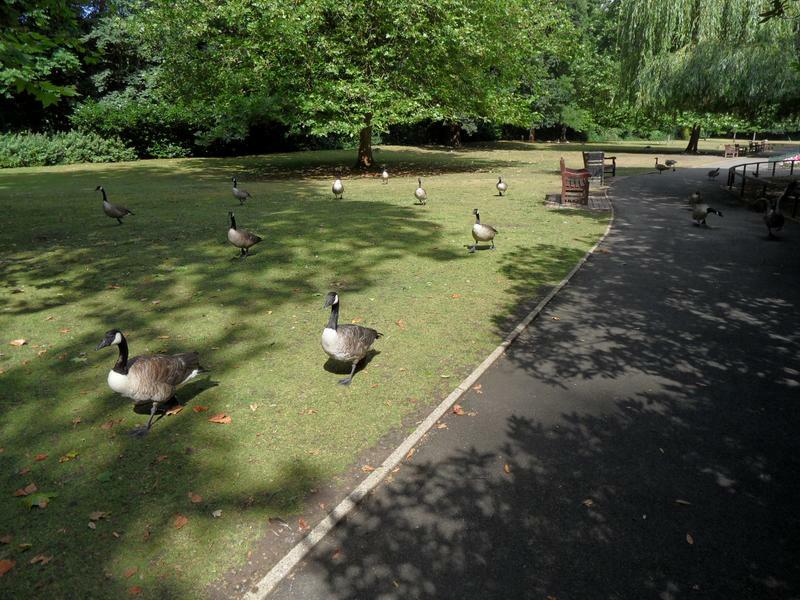 Yet more geese heading my way. 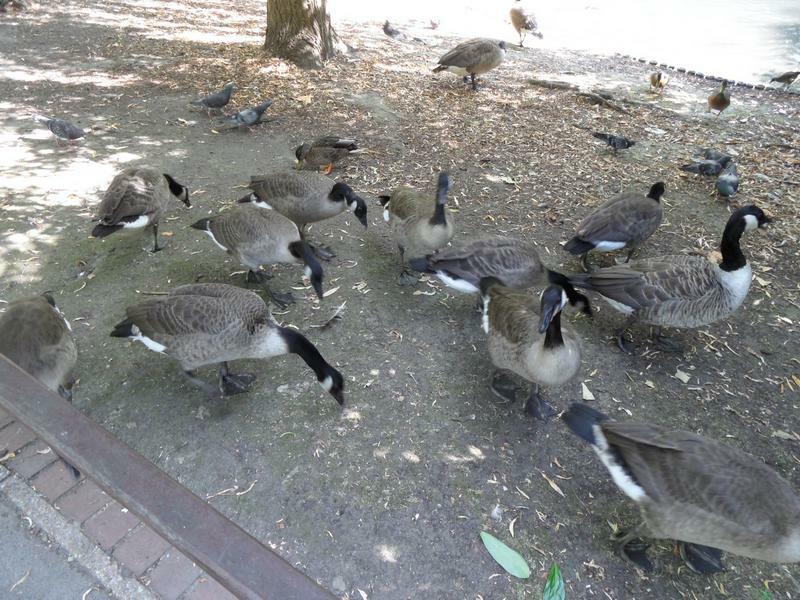 It's about 10am, before it gets too hot, so not people have been feeding them yet. 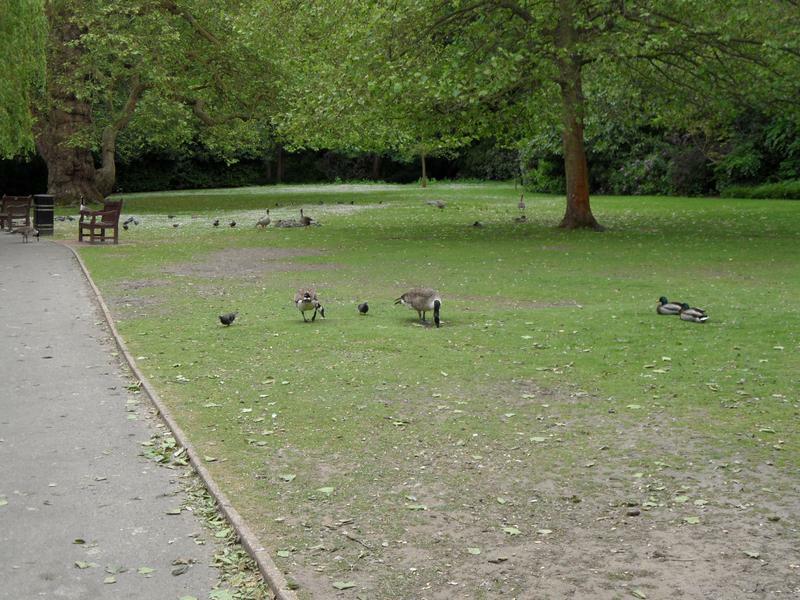 But some people are out early. 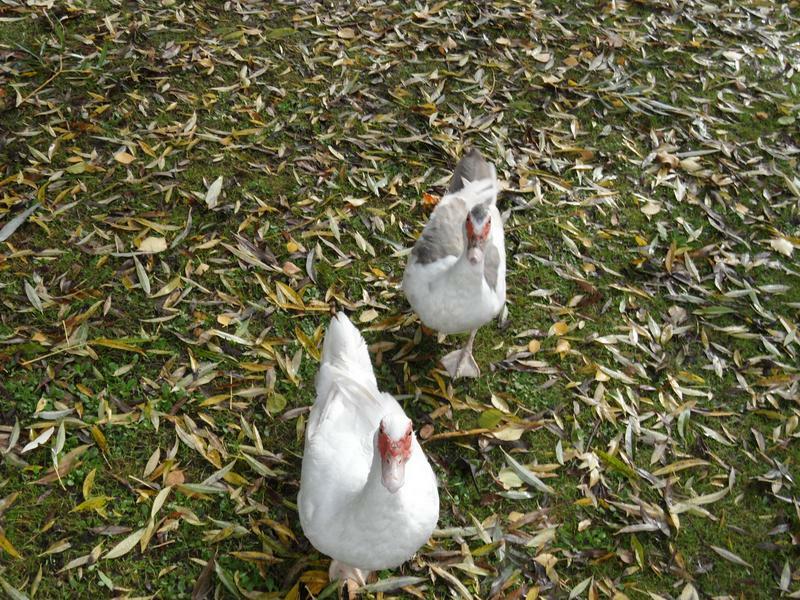 Same story on the lawns, geese following me looking for more food. 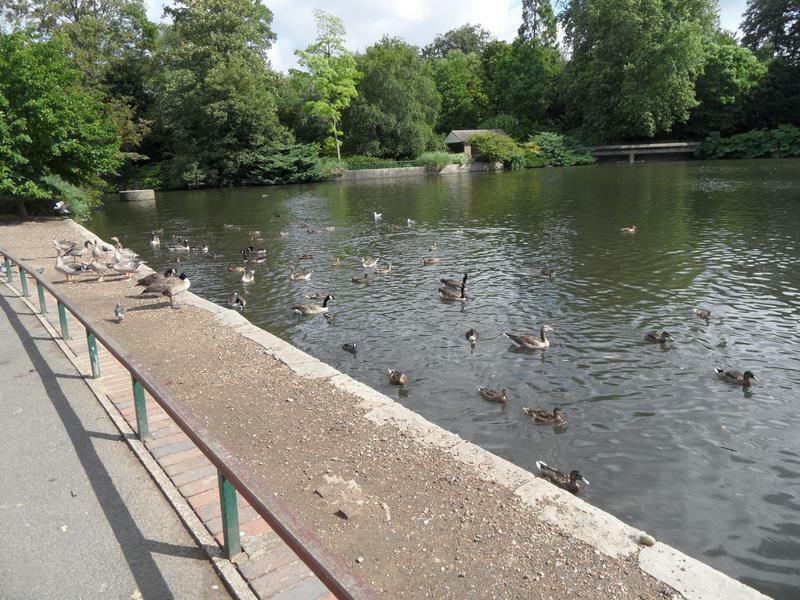 The other end of the main lake, relatively quiet. 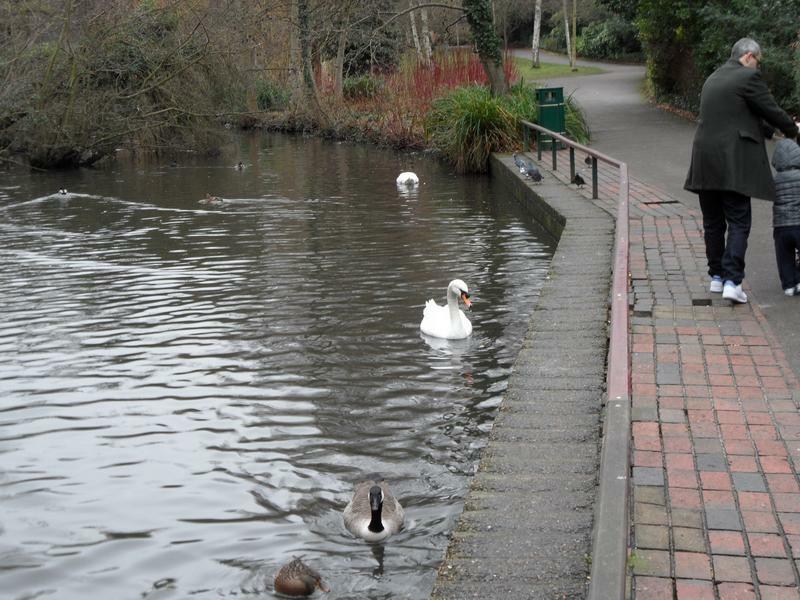 One swan near the children's playground. 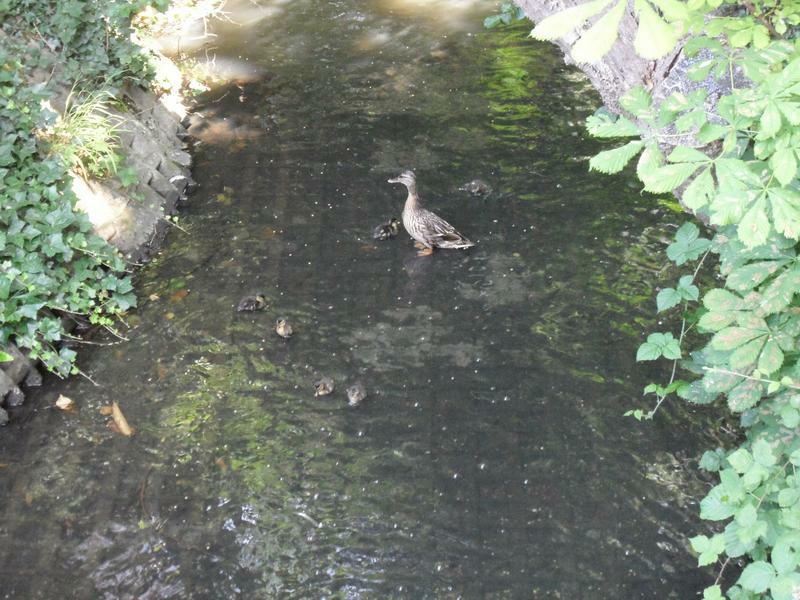 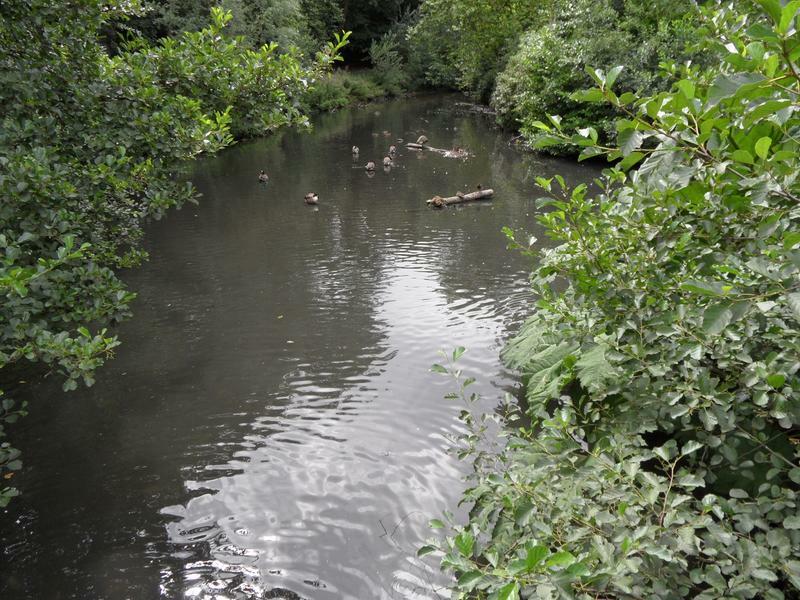 11th August 2013, the ducklings living in the stream are getting much larger. 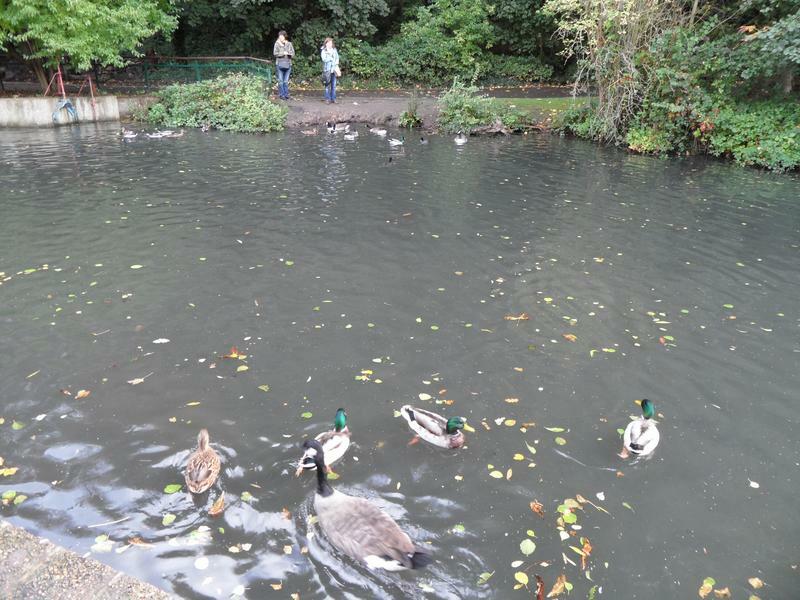 Still difficult to get good photos due to poor light. 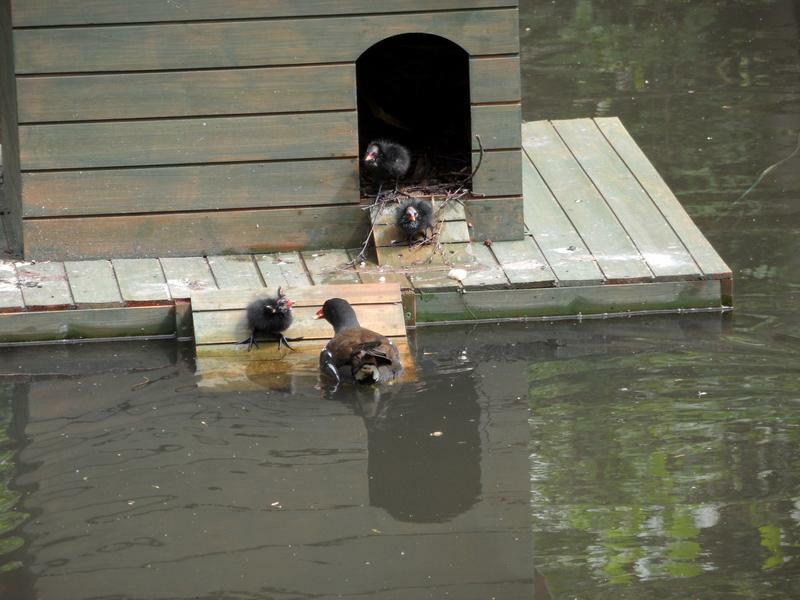 One of the Muscovy ducks is sitting on the duck nest box, but it's occupied by a Moorhen family. 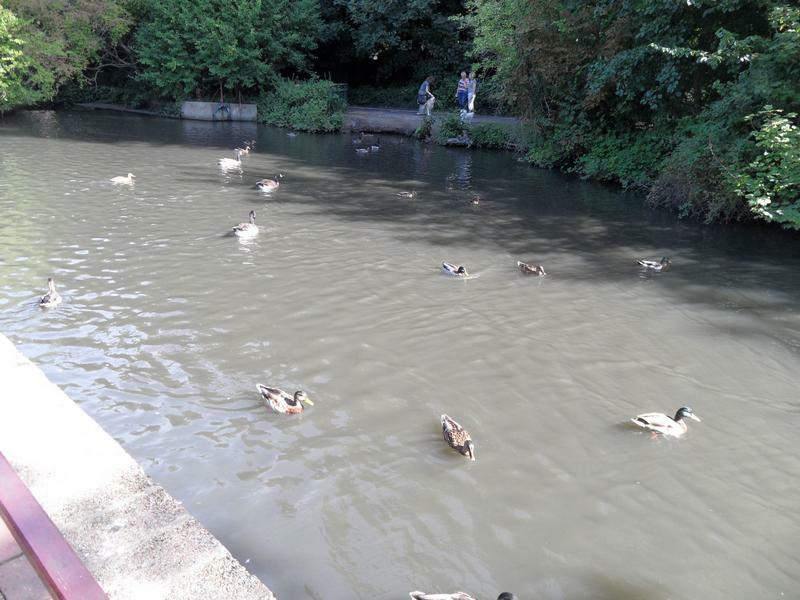 Not as many ducks looking for food this week. 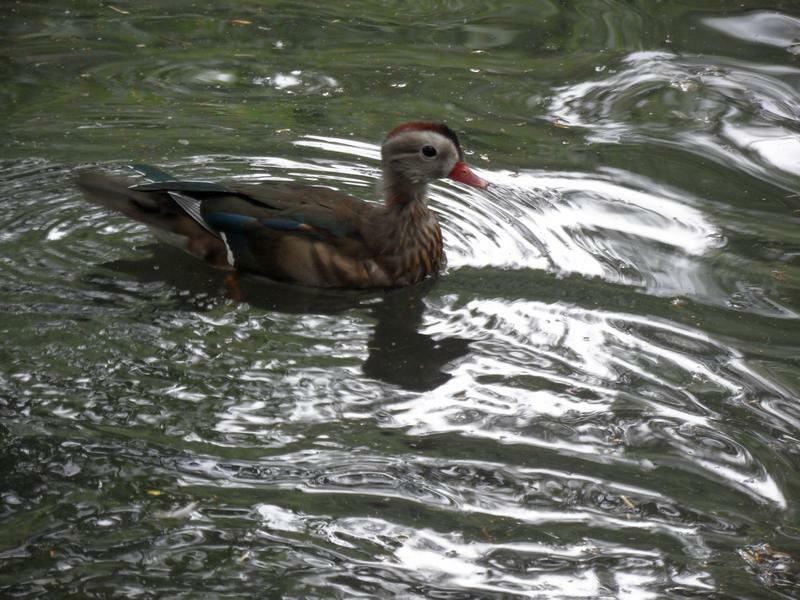 A Mandarin male in August, when all the orange, red, blue and brown coloured feathers have gone for the summer, but will regrow by October. 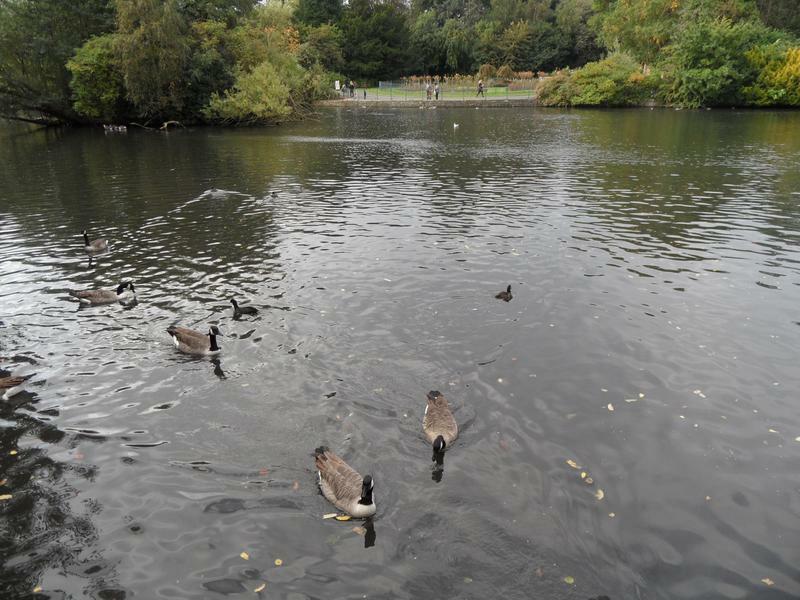 The main lake, mostly geese. 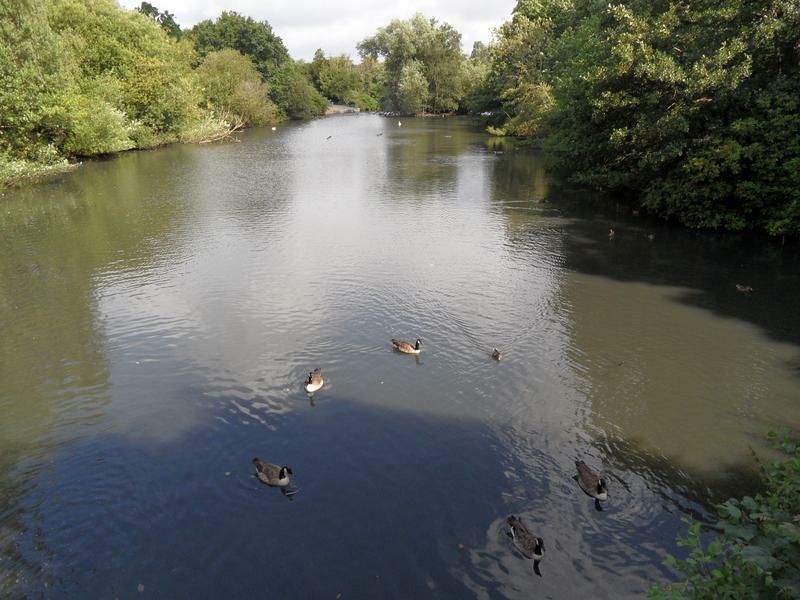 The top lake from the bridge, a few Mallards in the distance. 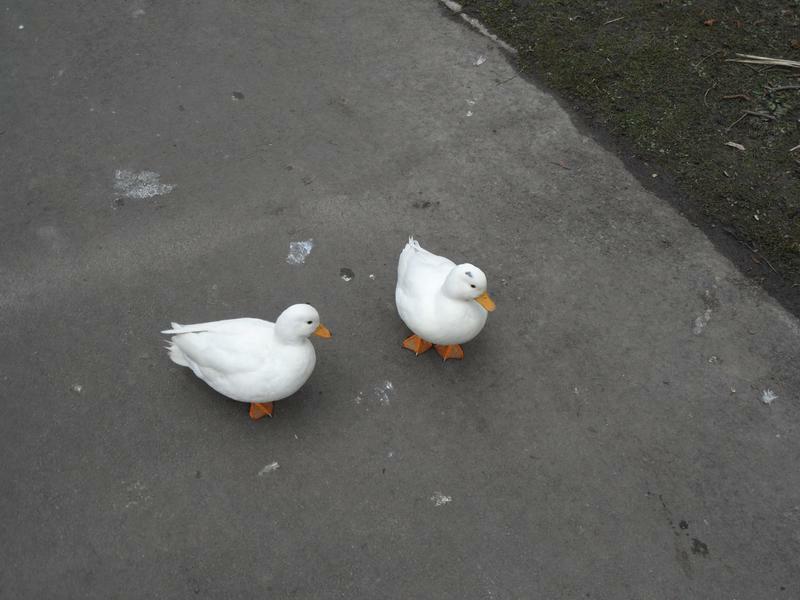 which will become white ducks when fully grown. 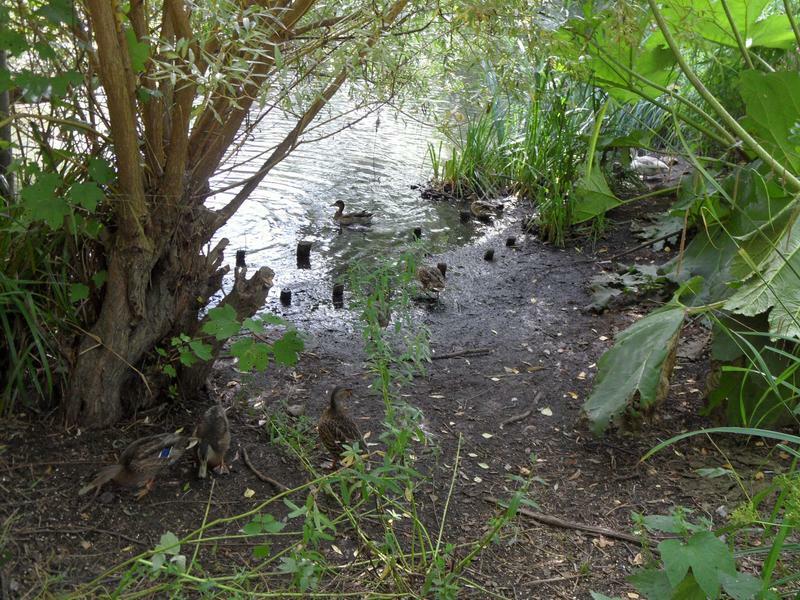 Very unusual to see new ducklings in August, normally June or July at the latest. 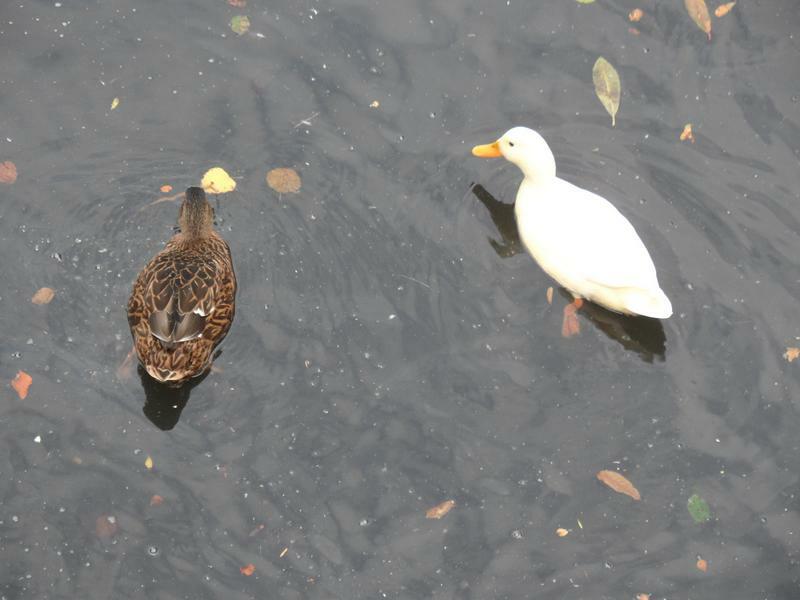 White Mallards happen due to interbreeding with other duck species. 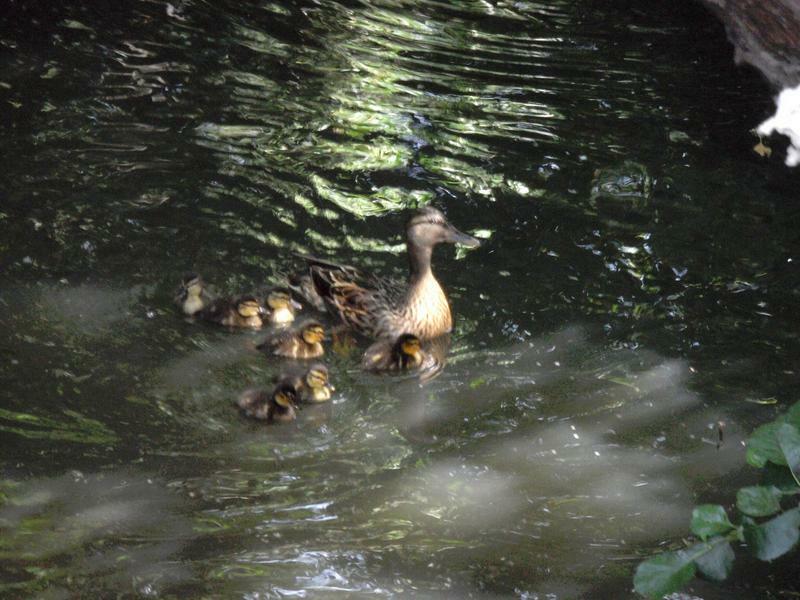 The yellow and brown ducklings stay close to their Mallard mother, probably one one week old. 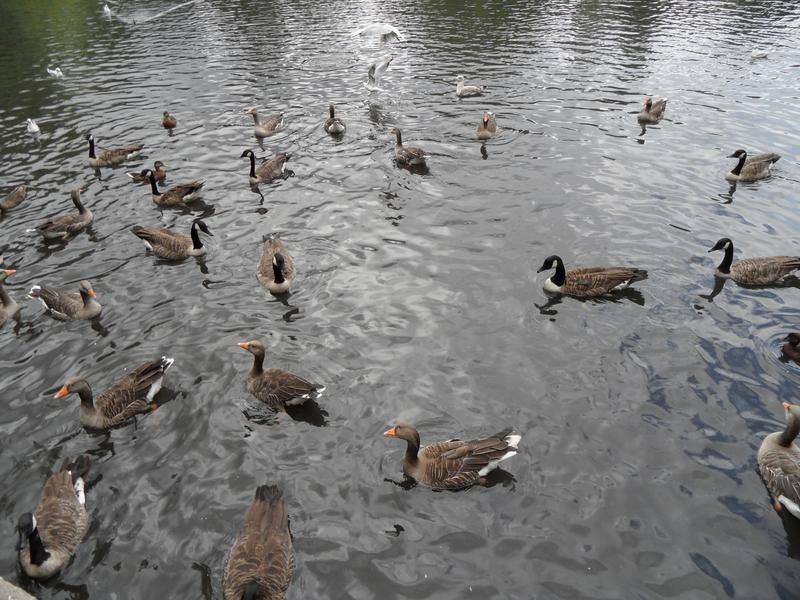 Lots of Greylag and Canada Geese on the main lake. 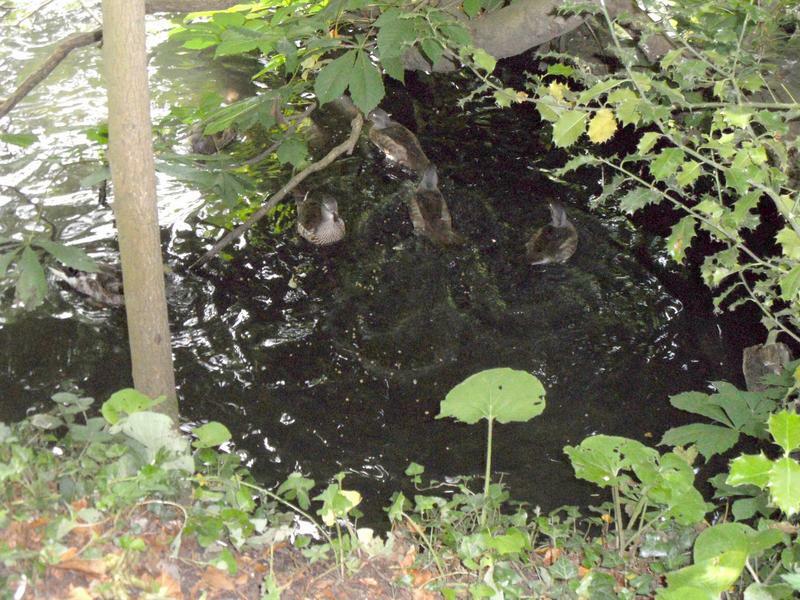 from this pond and are now fully grown six weeks after I first photographed them in mid July when they were at least a week old. 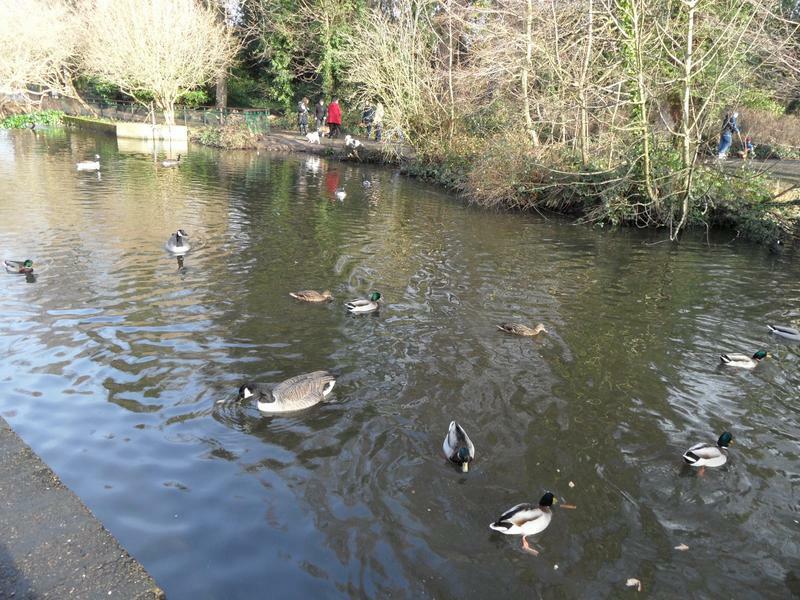 More Mallards on the next pond down the park, few geese here. 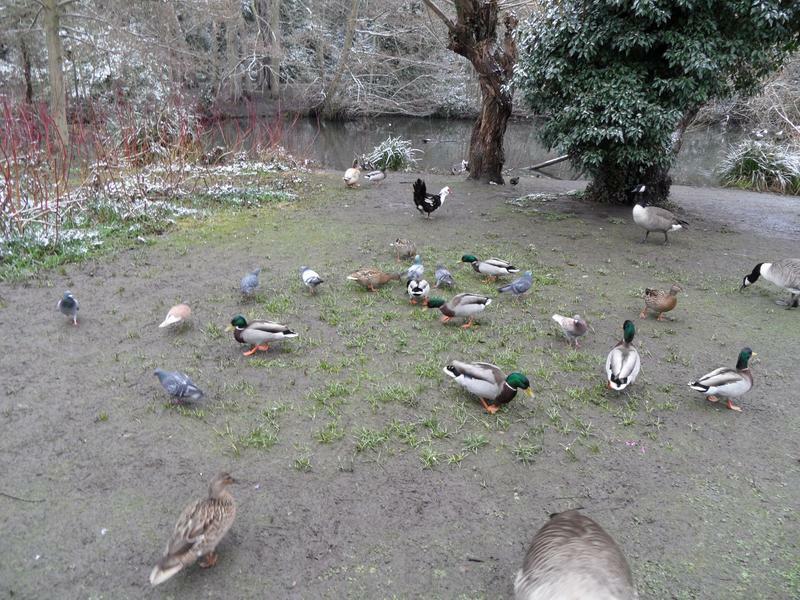 One of the Muscovy Ducks hiding in the background, several Mallard eating bird seed. 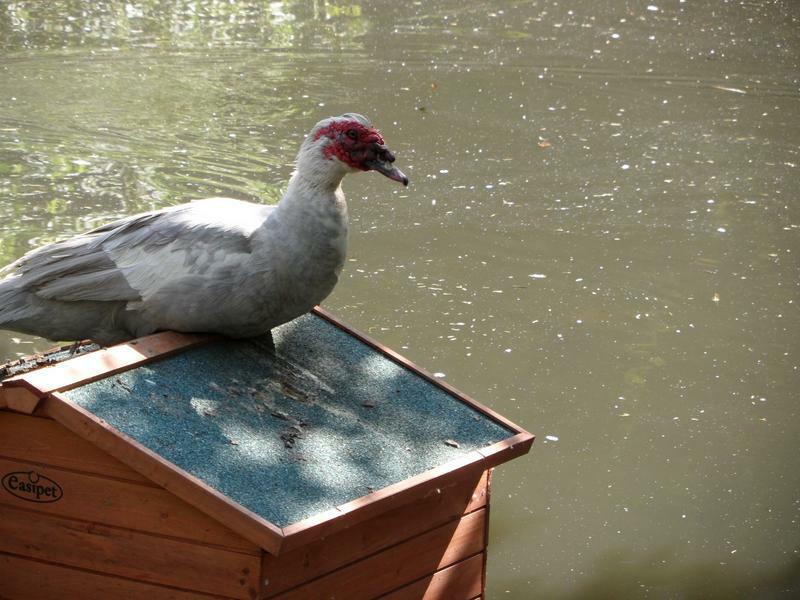 Another Muscovy Duck sitting on the floating nesting box, lots of Coots here. 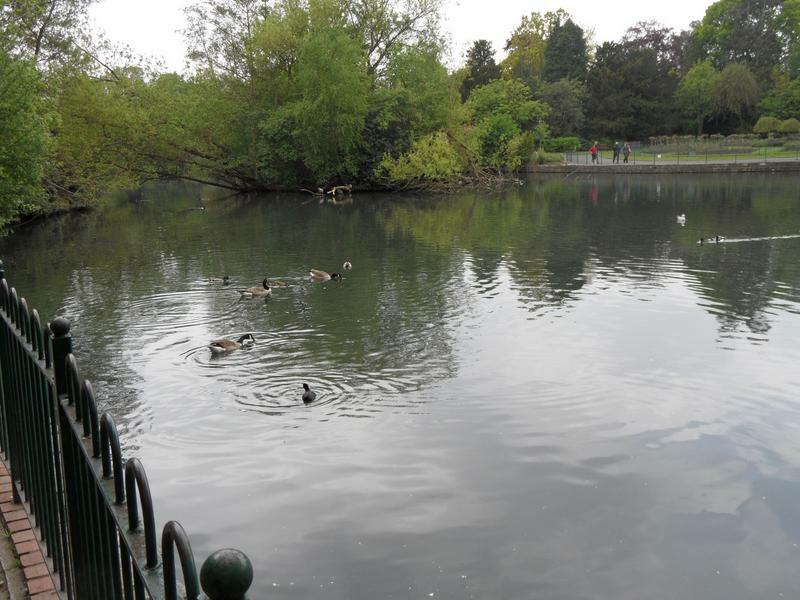 The main lake is strangely quiet. 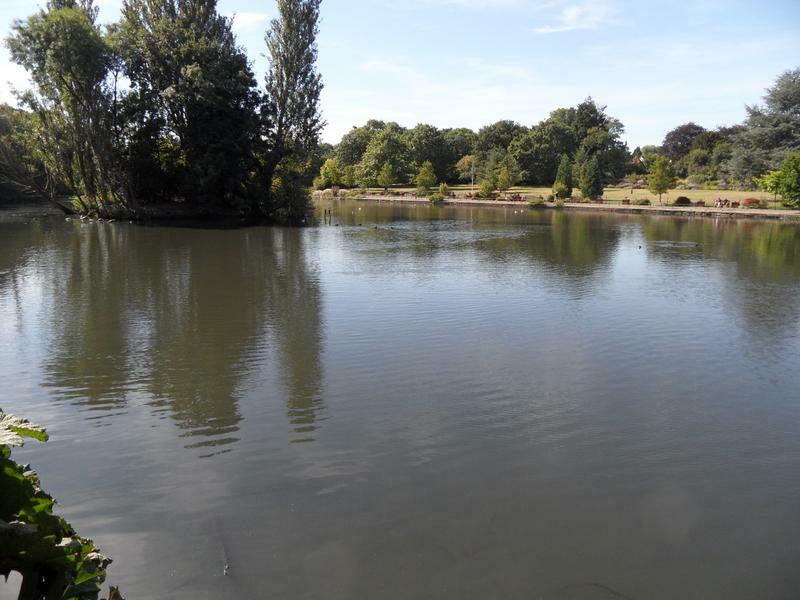 Even quiet up at the other end of the lake. 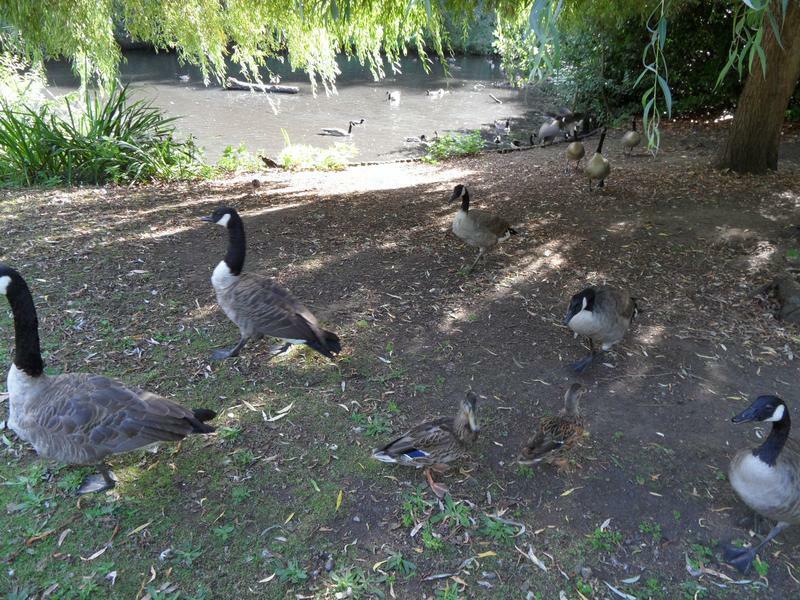 Finally found all the Canada Geese, seems to be a day for living on the grass, all heading my way for food. 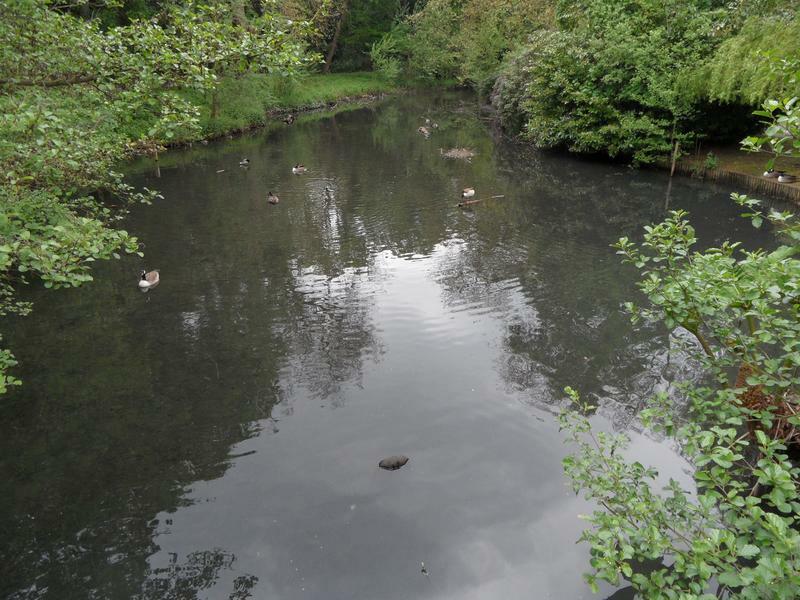 The bottom pond where I saw the yellow Mallard ducklings last time, but no sign of them this week, so many places to hide in these lakes. 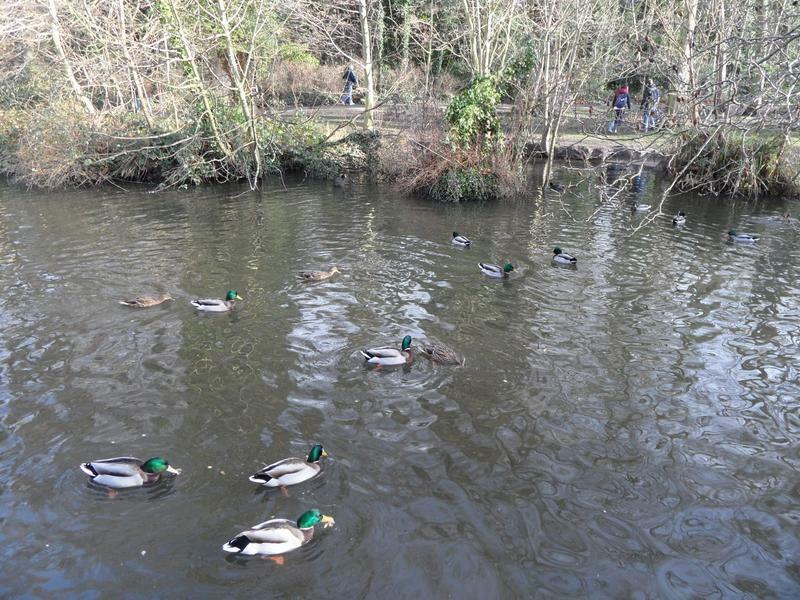 Plenty of Mallards on the lowest pond. 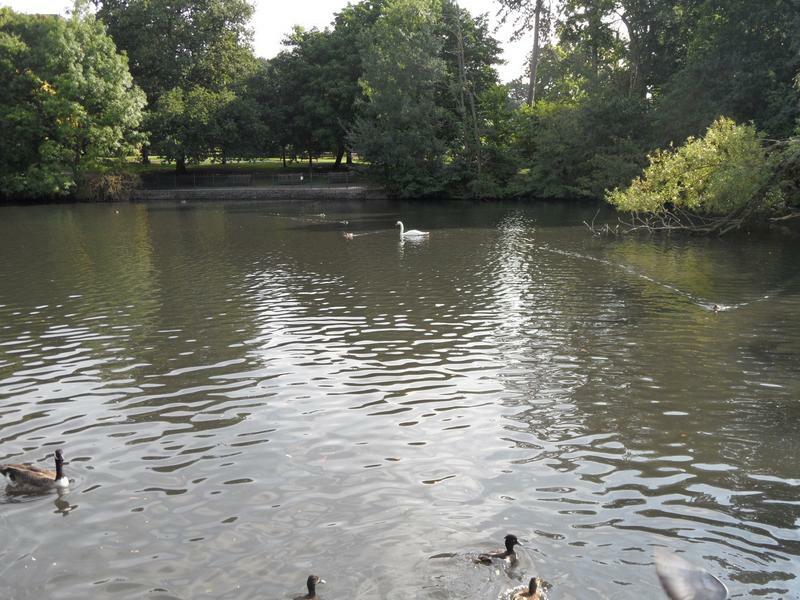 Even Heron island seems empty, one swan in the distance. 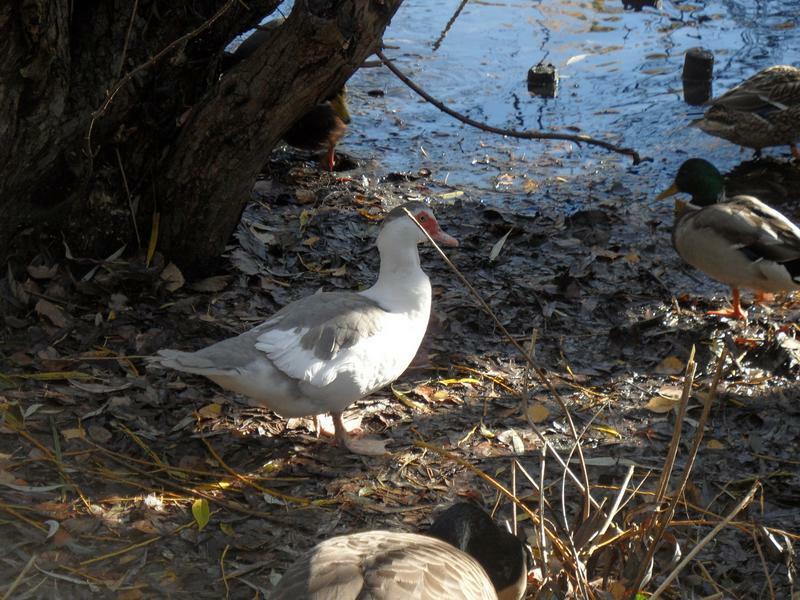 The other side of Heron Island. 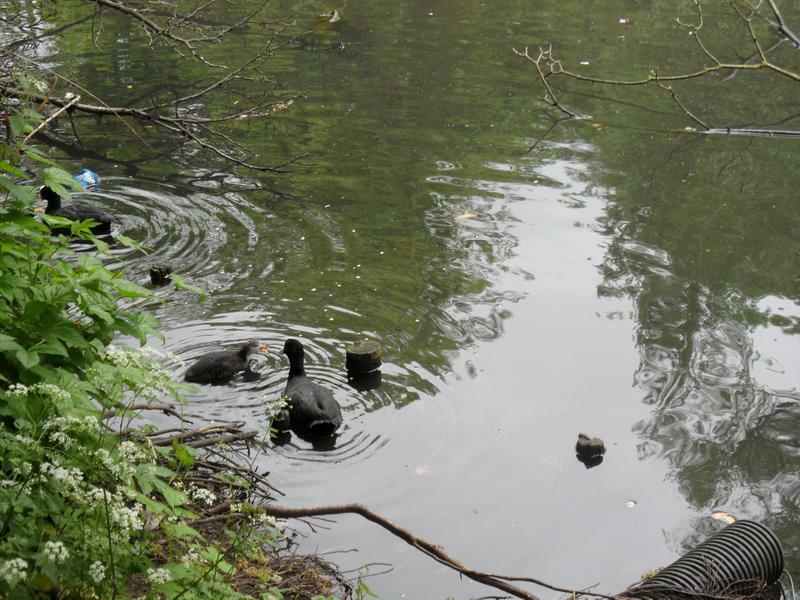 Full circle around the park, back at the top pond. 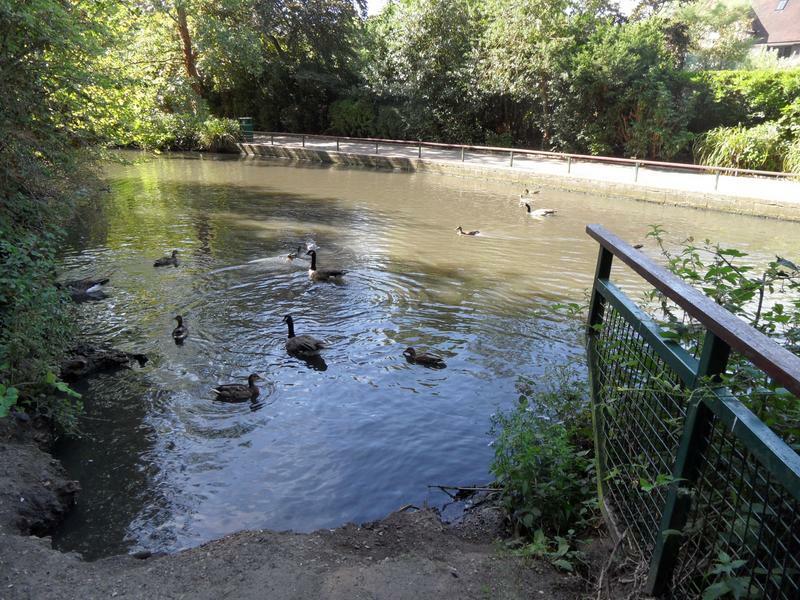 10th September 2013, the top pond is busy as usual with hungry ducks and geese, but lower sun is washing out the photos, again. 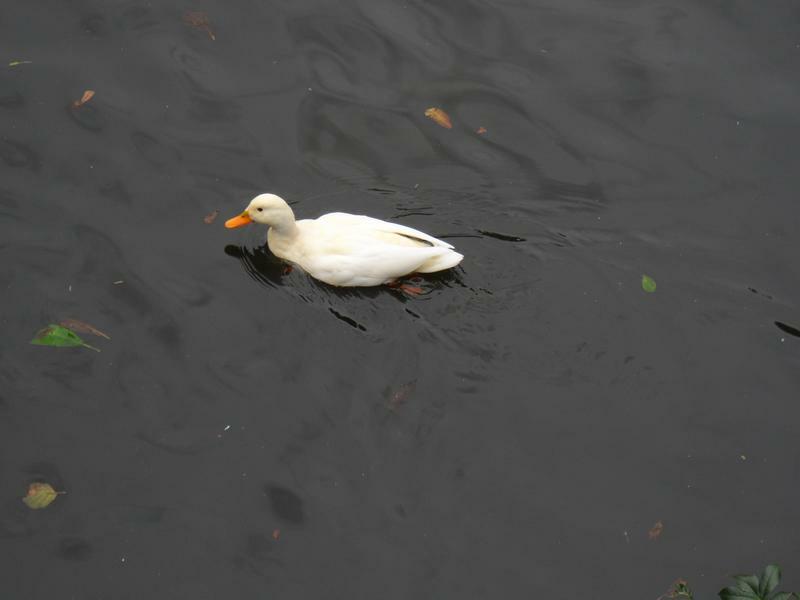 A white Mallard, possibly one of those born in August. 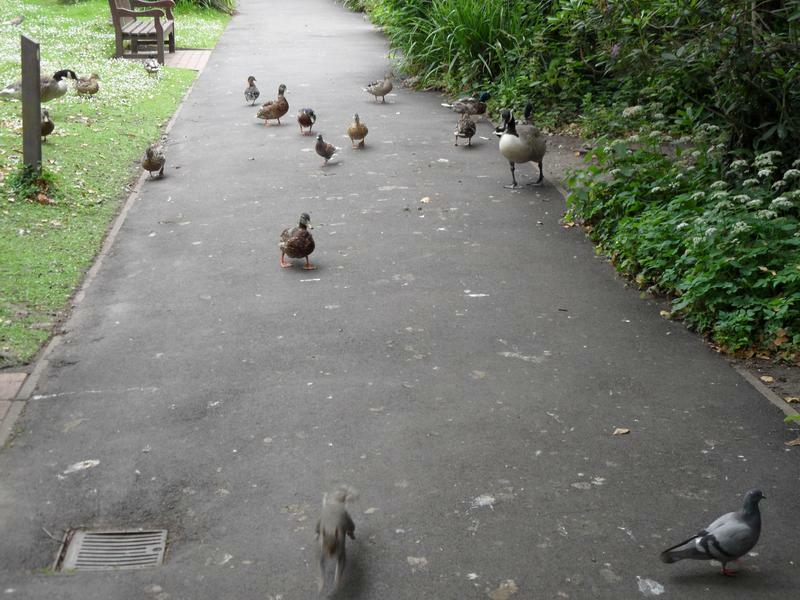 Everyone is hungry today, and following me down the path. 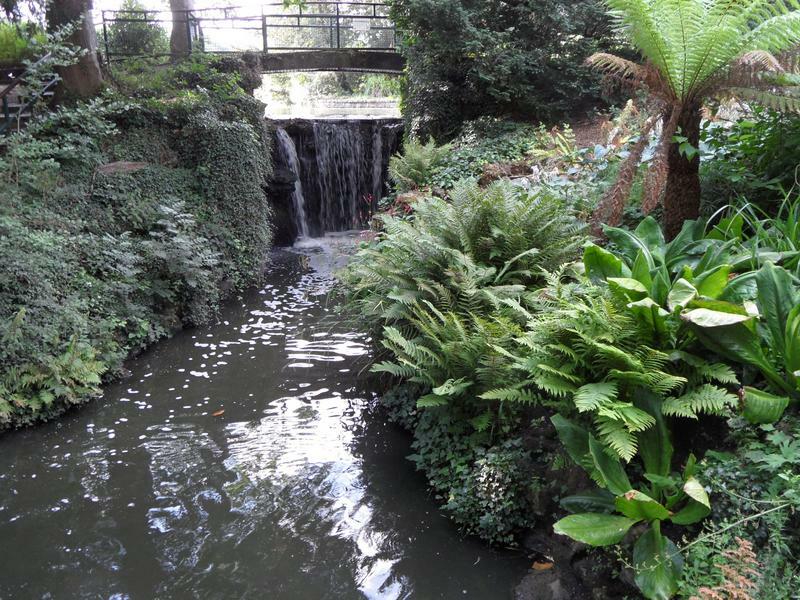 View across the small pond below the waterfall. 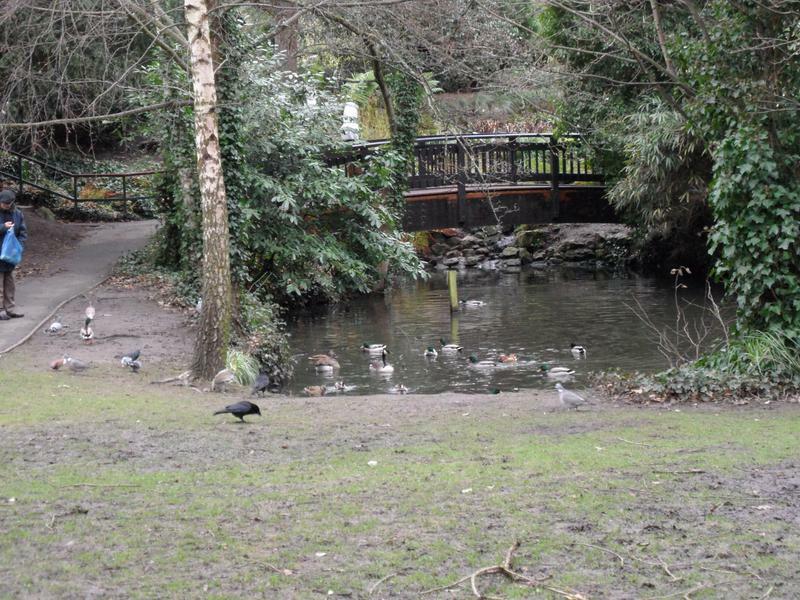 Tufted ducks in the foreground, and one of the swans. 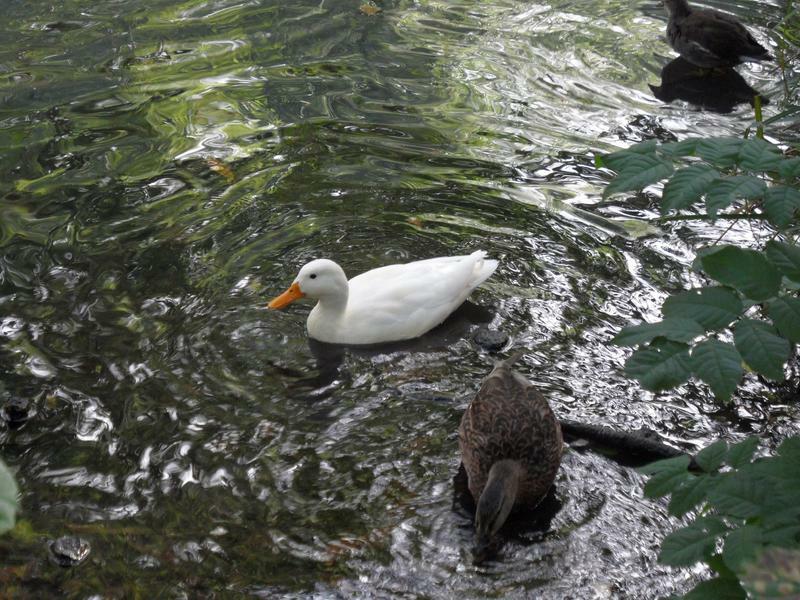 Another white Mallard at the other end of the park. 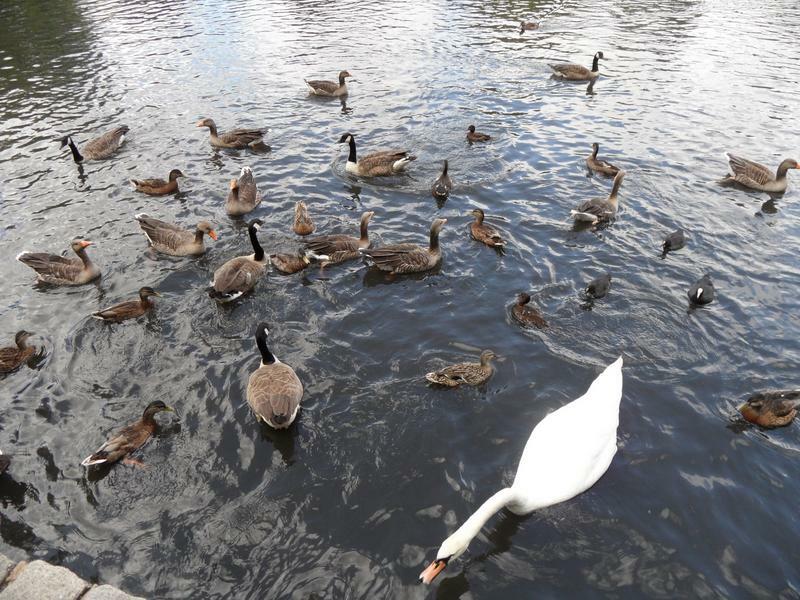 The swan has come for food. 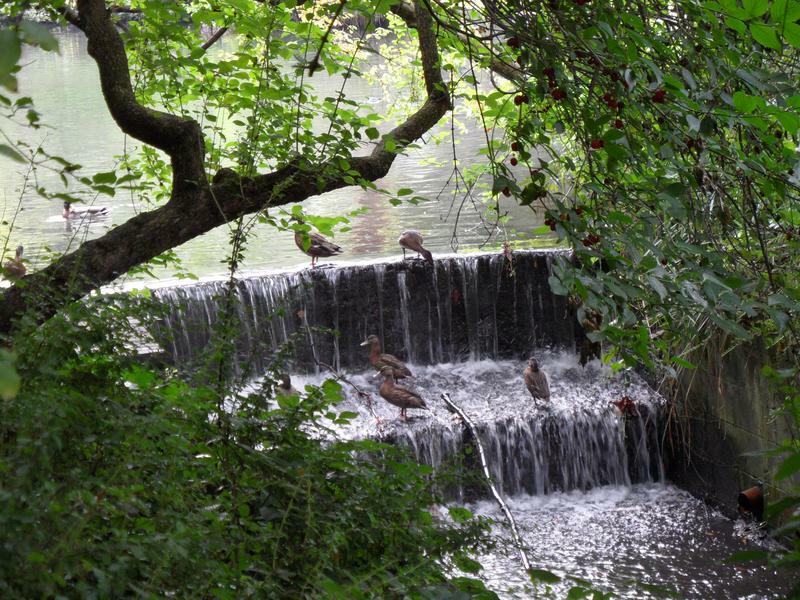 Don't often see Mallards sitting on this waterfall. 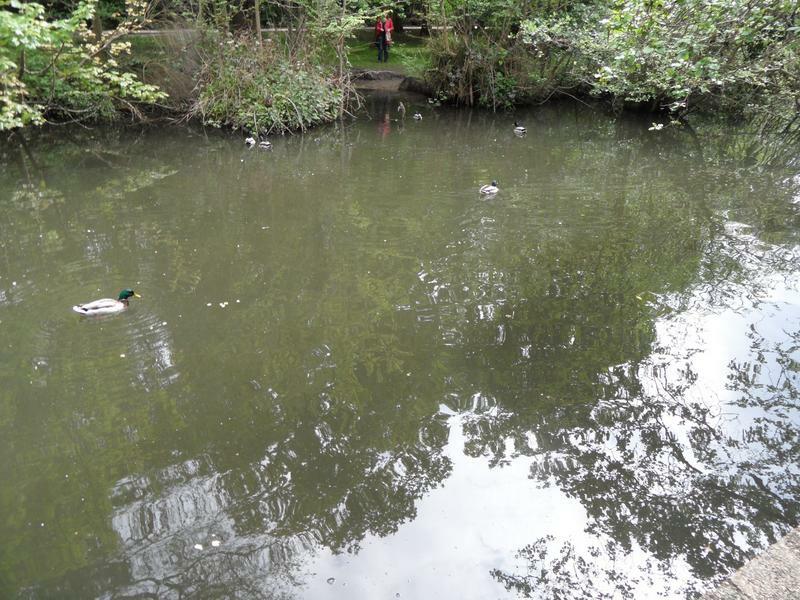 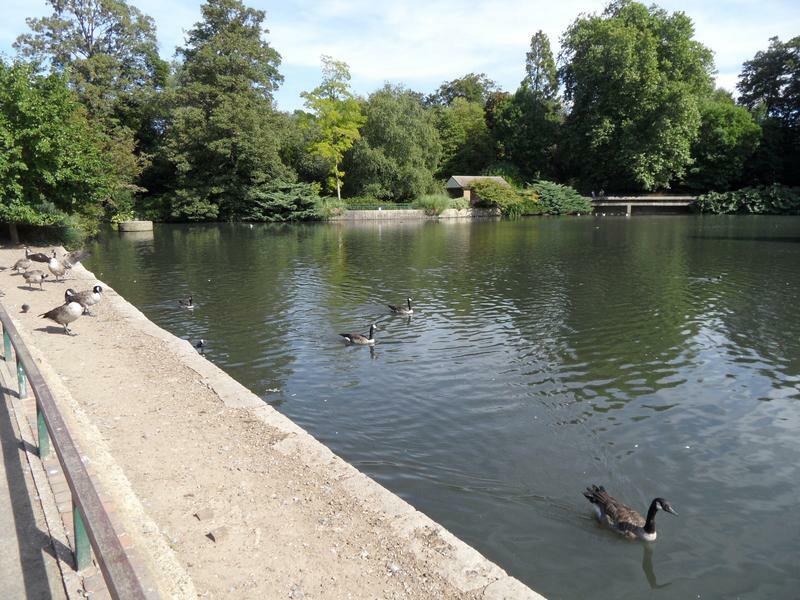 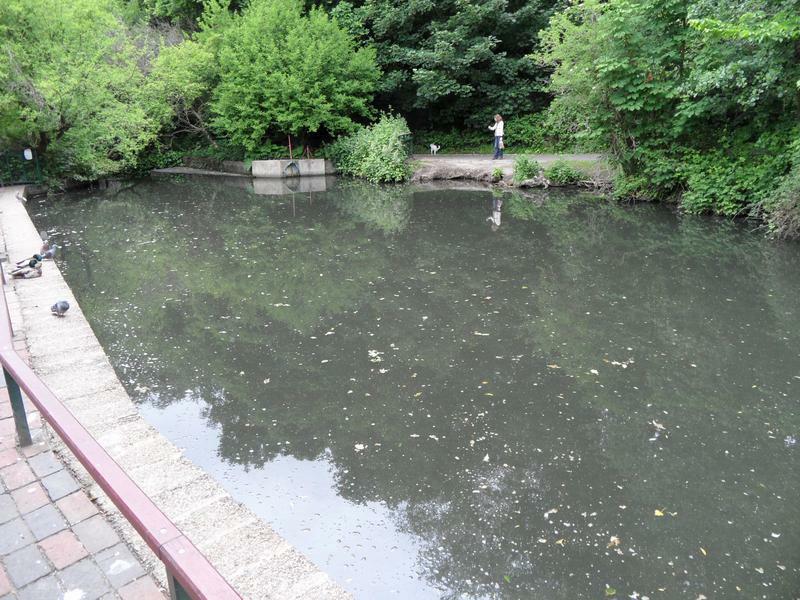 15th September 2013, the top pond is a little quieter than normal. 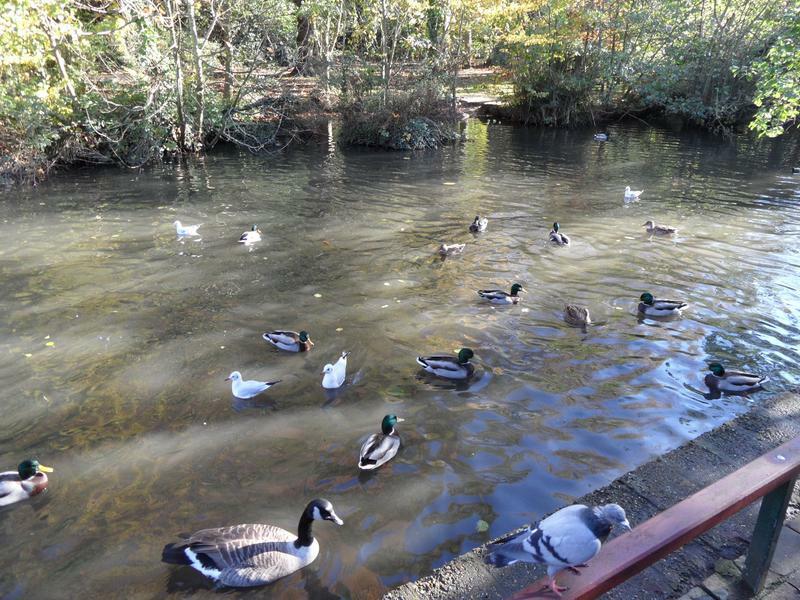 Several Coots and Mallards on this small beach area. 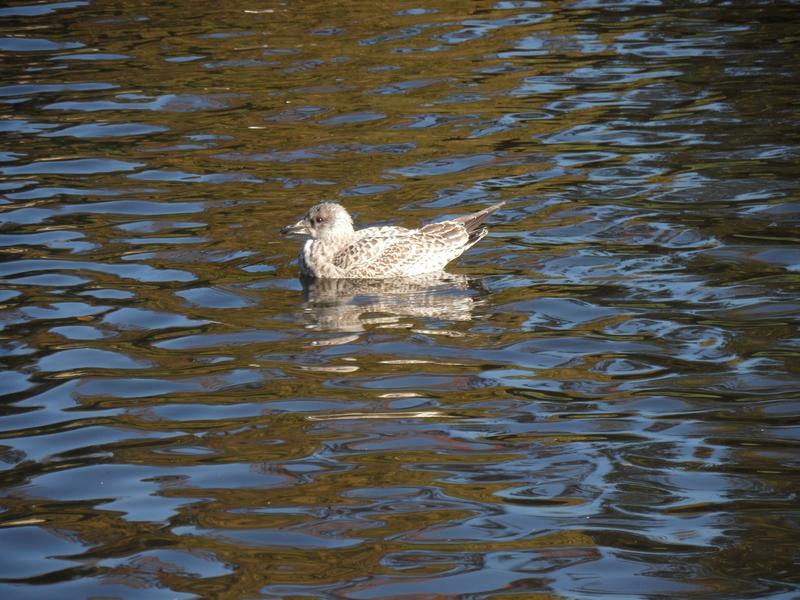 Not too many sea birds on the main lake yet. 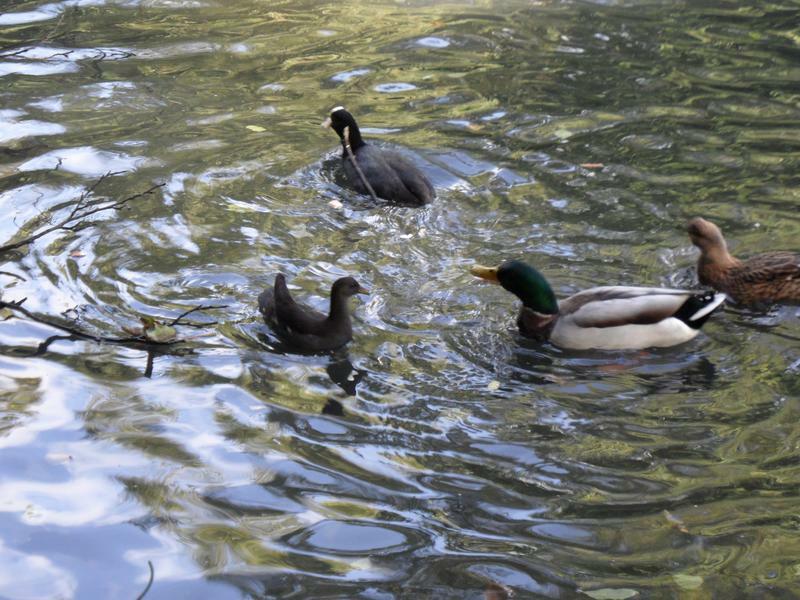 Several Mallards on the bottom pond. 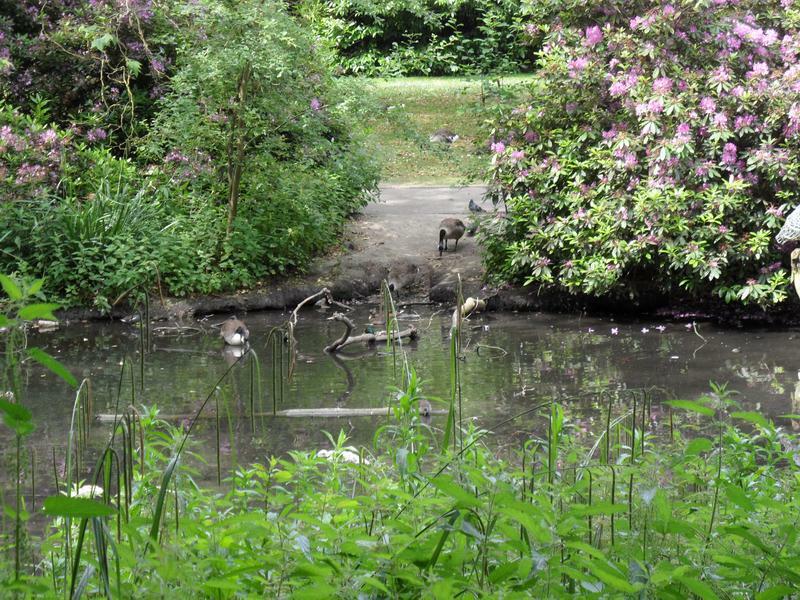 Wider view of the bottom pond, with two unusual birds sitting on a log in the middle. 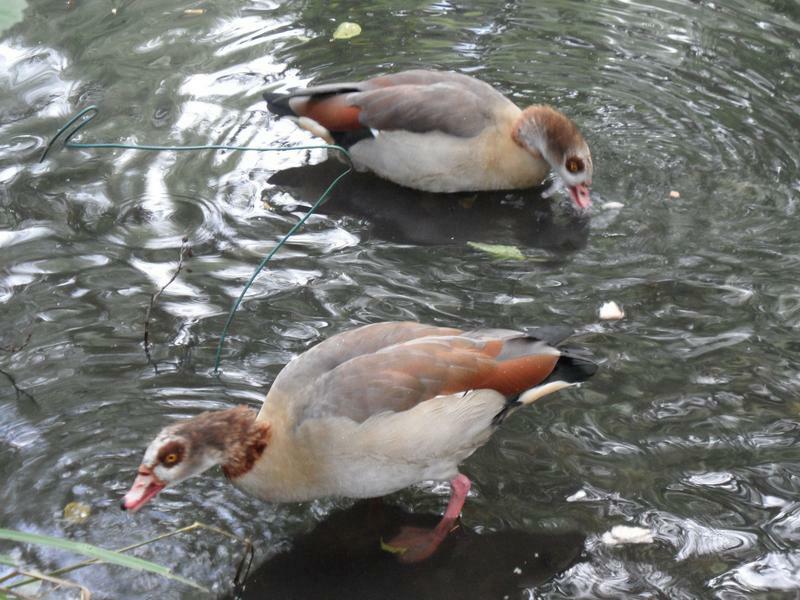 Two Egyptian Geese, slight larger than Mallards but smaller than Canada Geese. 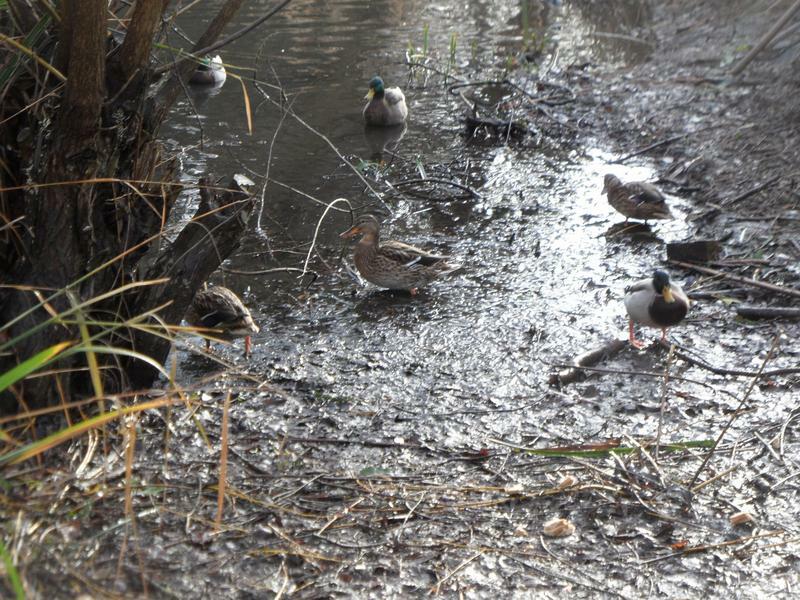 One of the while Mallards. 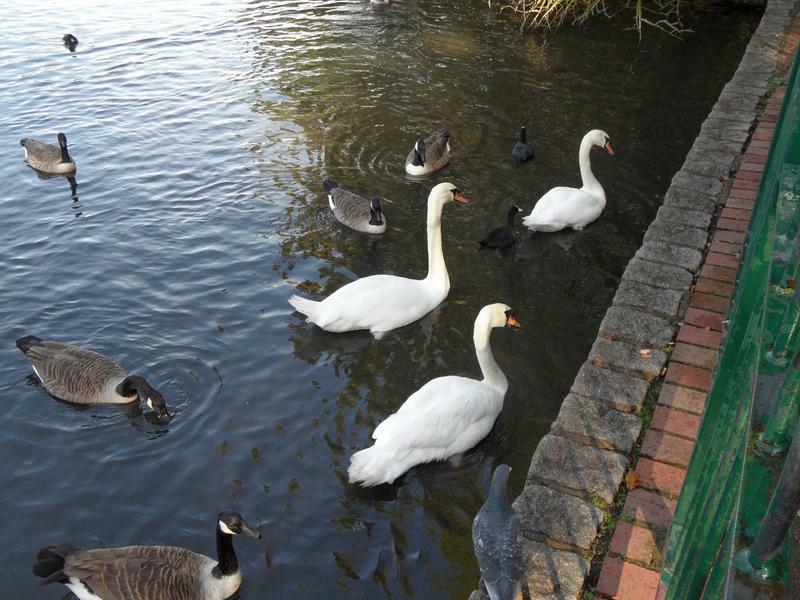 Don't often see the swans together. 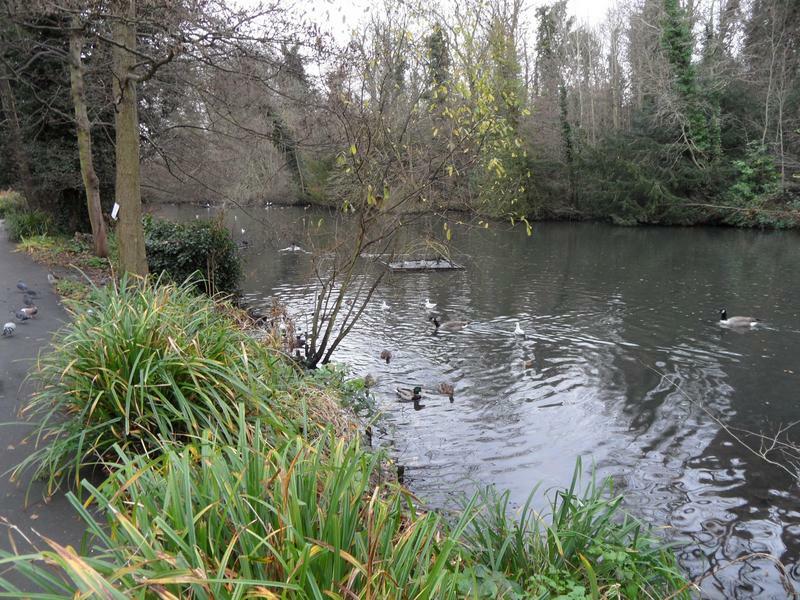 quiet, although there are birds scattered under most of the trees. 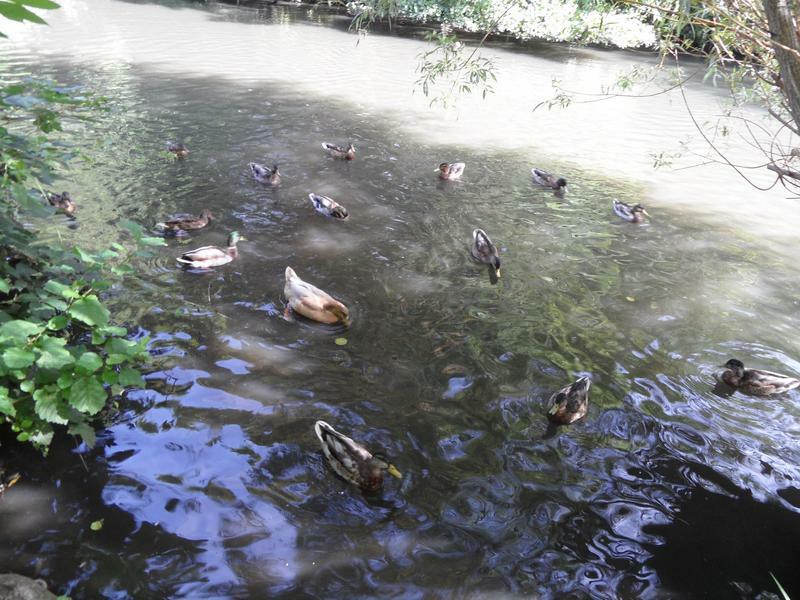 The smaller Muskovy Ducks, don't think they managed to breed this year. 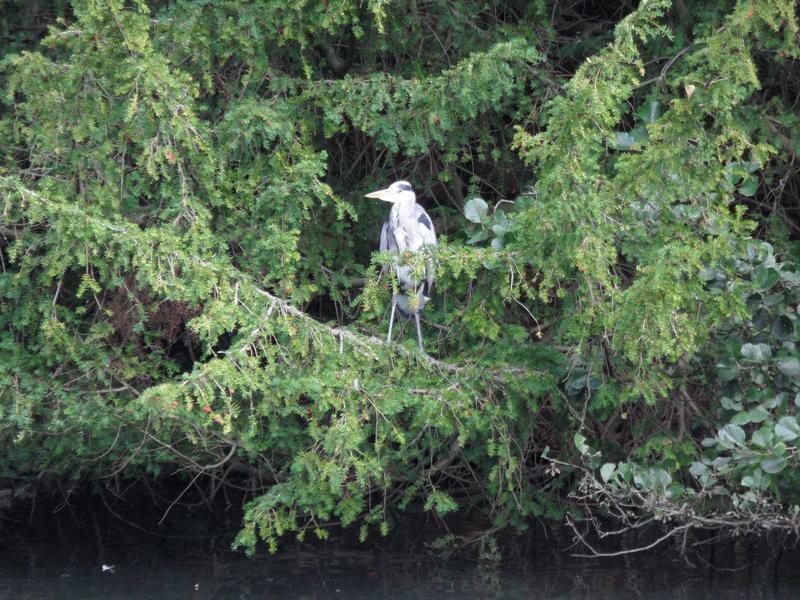 One of the herons looking for breakfast, the water is so clear we could both see fish swimming around. 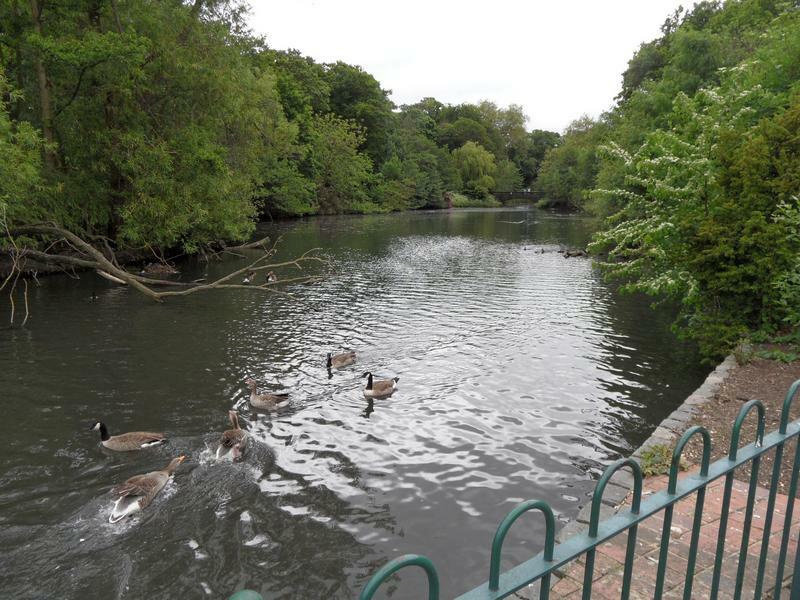 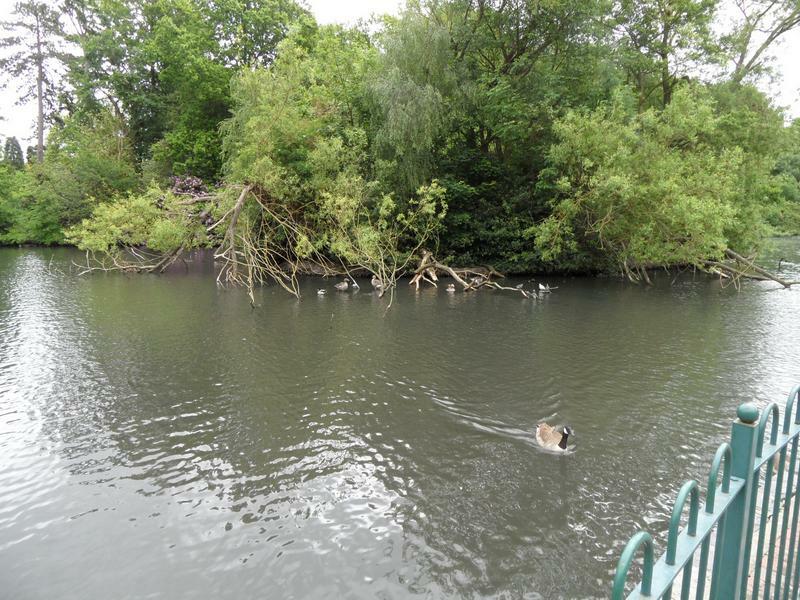 The Egyptian Geese have moved up the park onto a different lake. 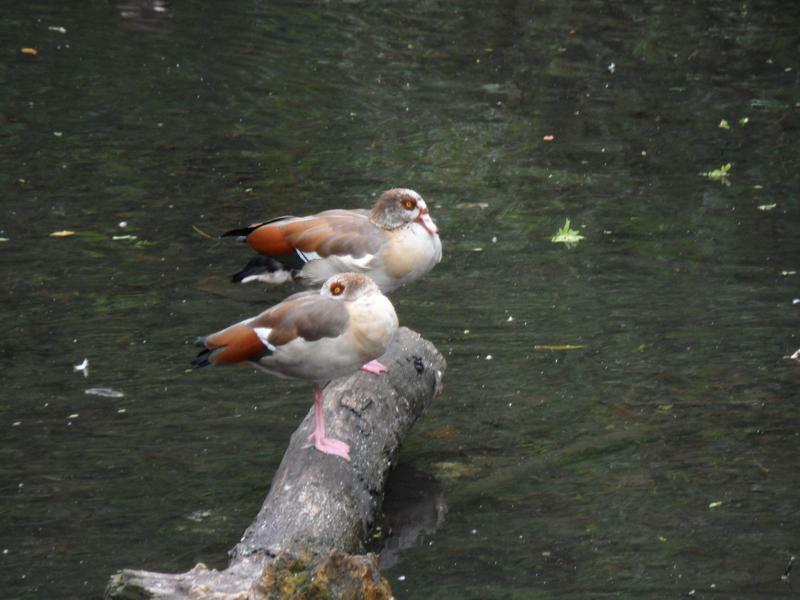 An unlike last time when they did not move, the Egyptian Geese come to the bank for some food and a good photo. 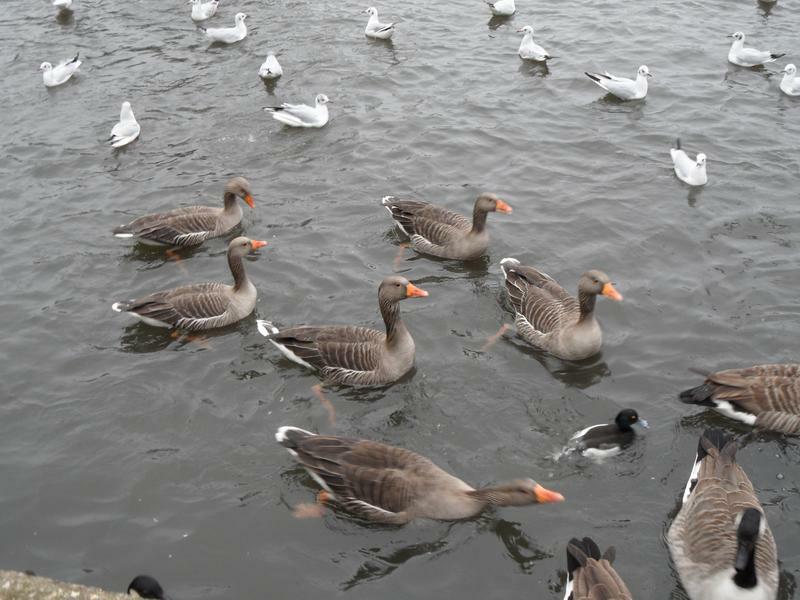 One of the swans with a pair of Greylag Geese. 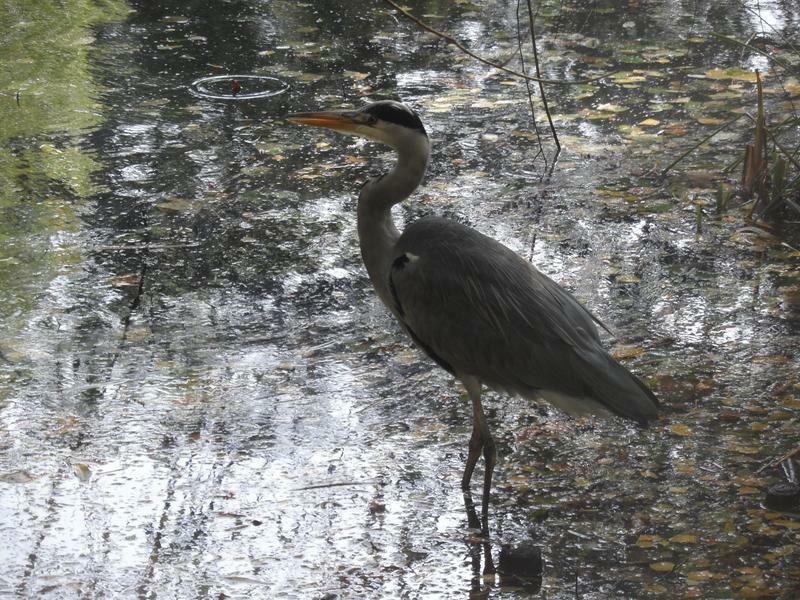 Another heron paddling around the shallow bottom pond. 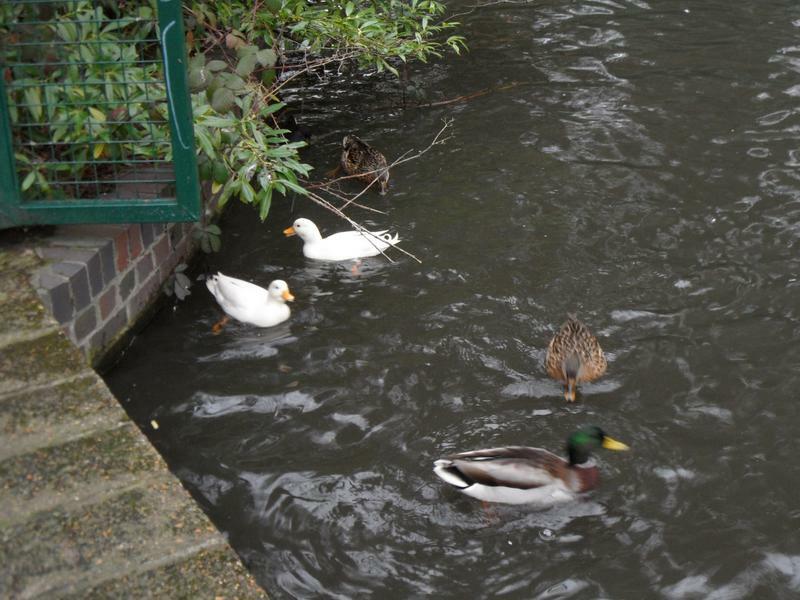 Always glad to see the white Mallards, too large for the herons now. 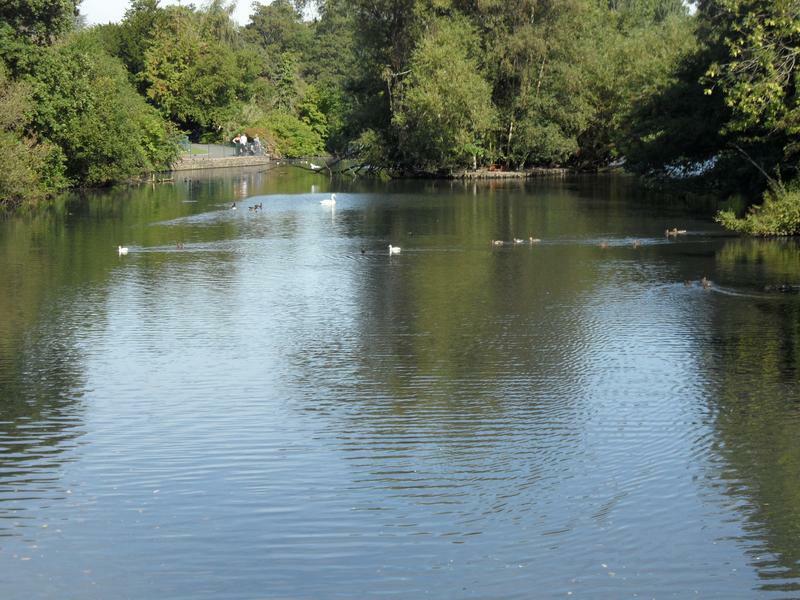 View across the main lake. 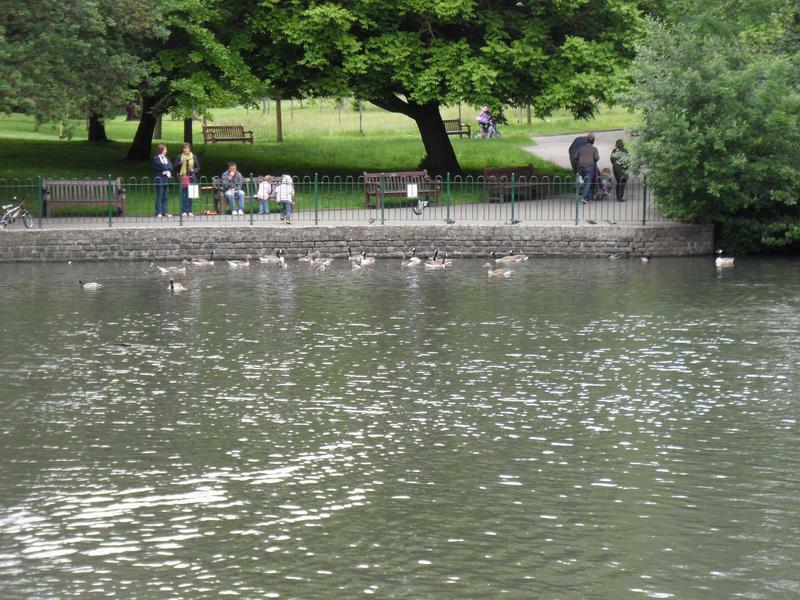 a lot of people enjoying the dry day. 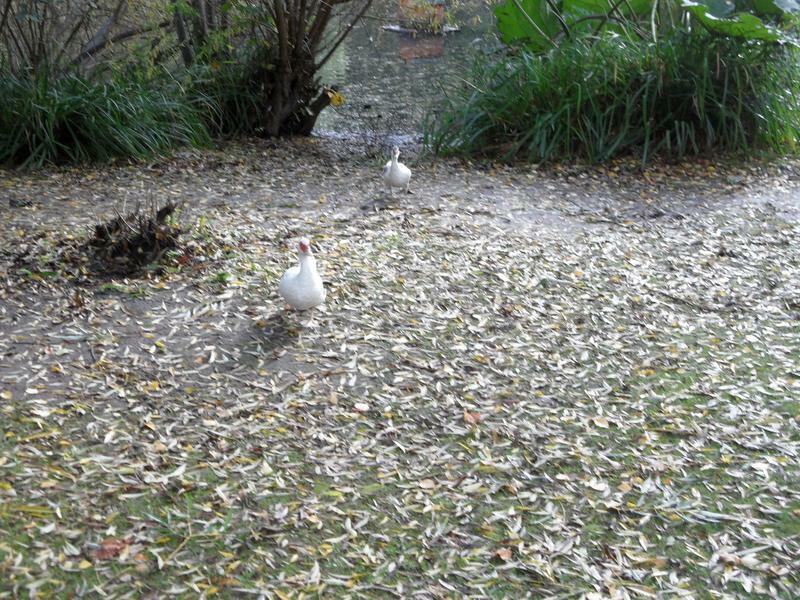 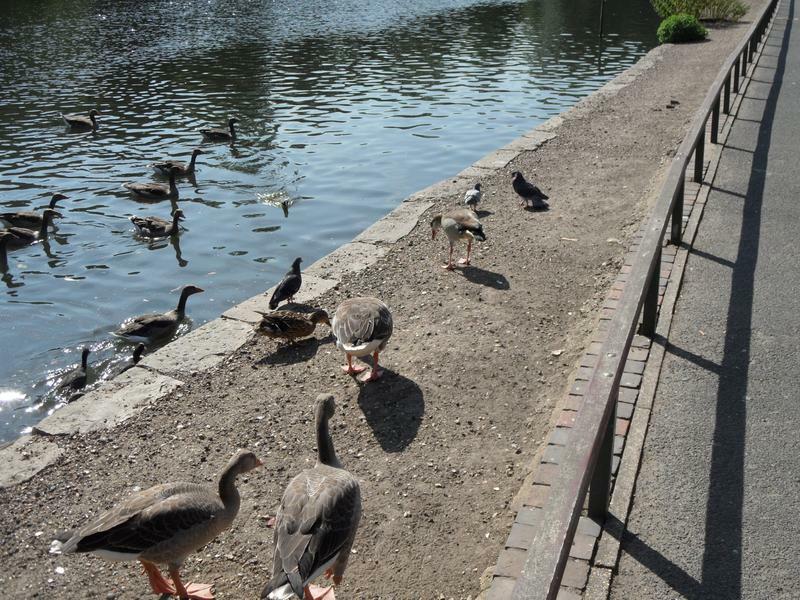 But the two Muscovy ducks are clearly hungry and come running out the lake when they see me. 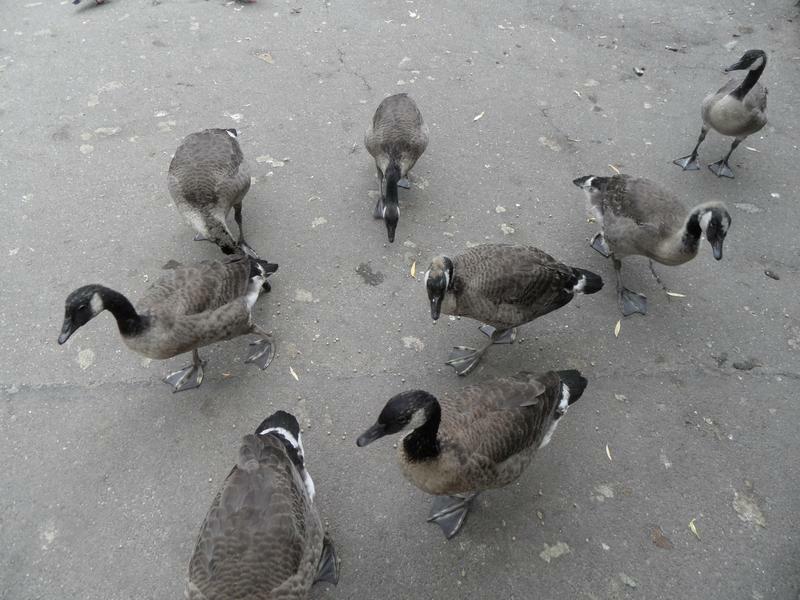 And wait patiently for food at my feet. 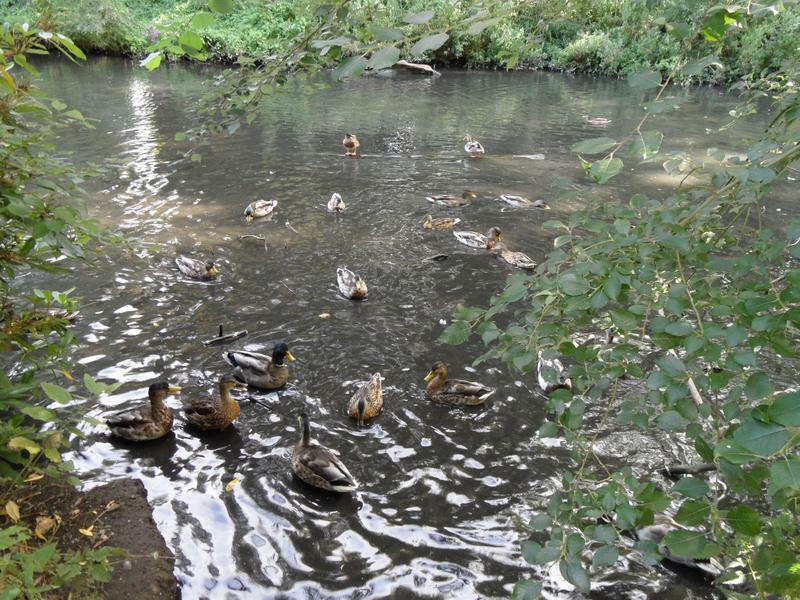 As do several Mallards that can not wait for me to reach the water. 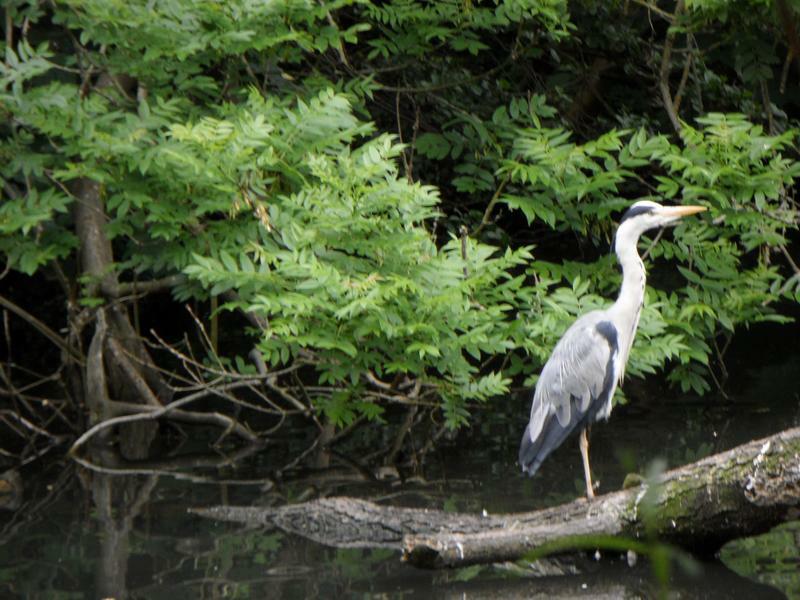 The herons rarely move, just stand there waiting for a fish to come within eating distance. 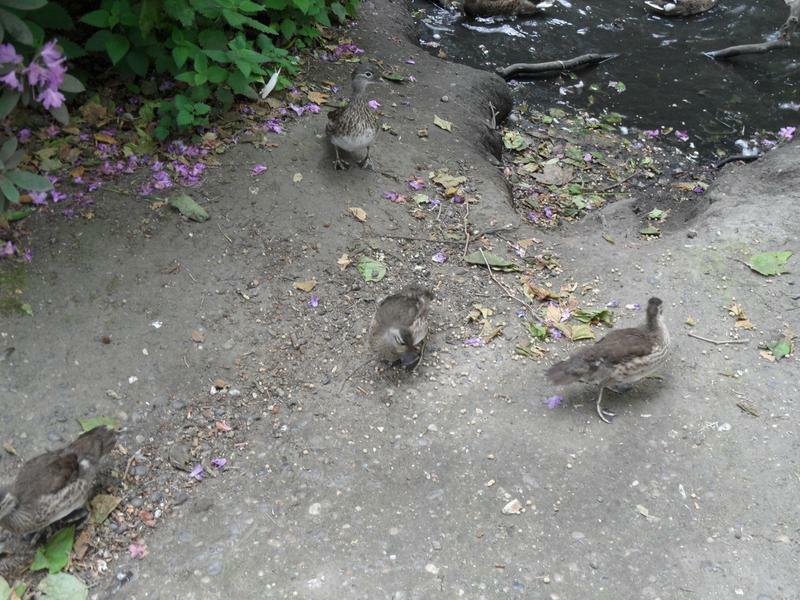 Mallards, young Moorhen and Coot. 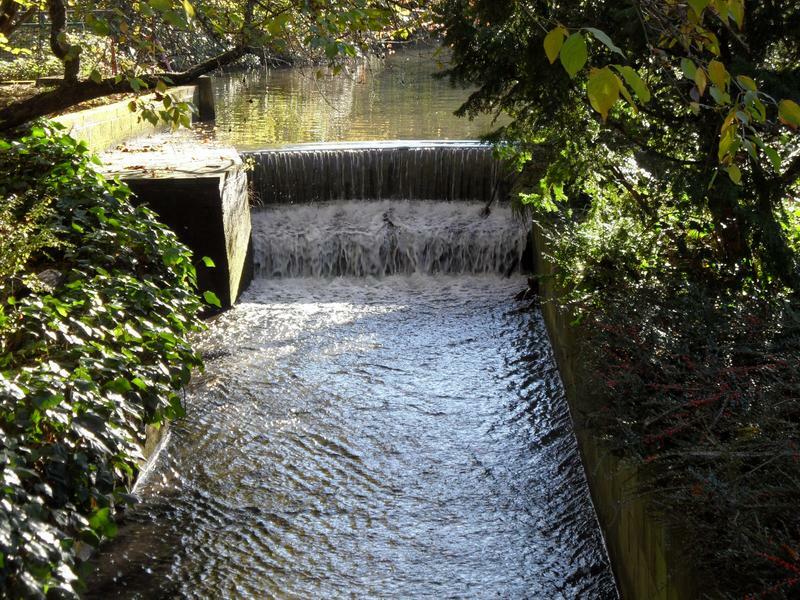 Quite a strong flow over the waterfall due to a lot of rain. 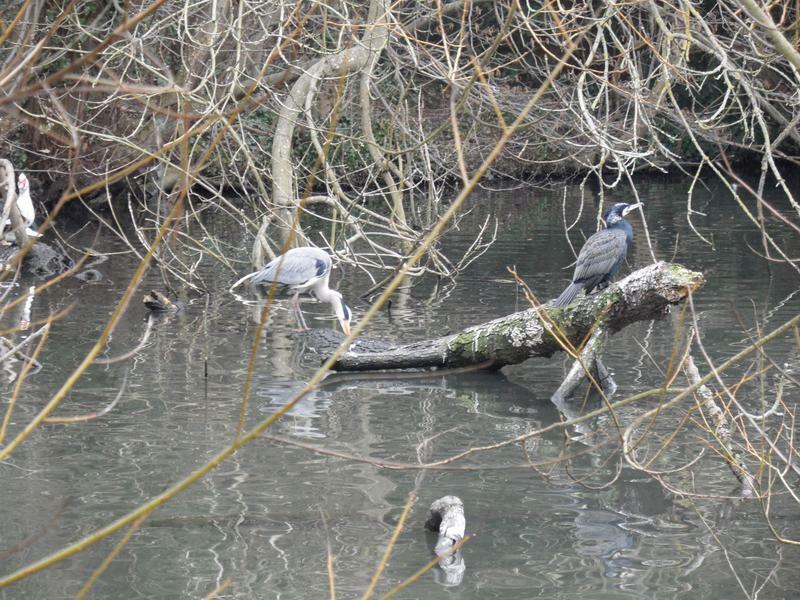 Several more Herons on Heron Island. 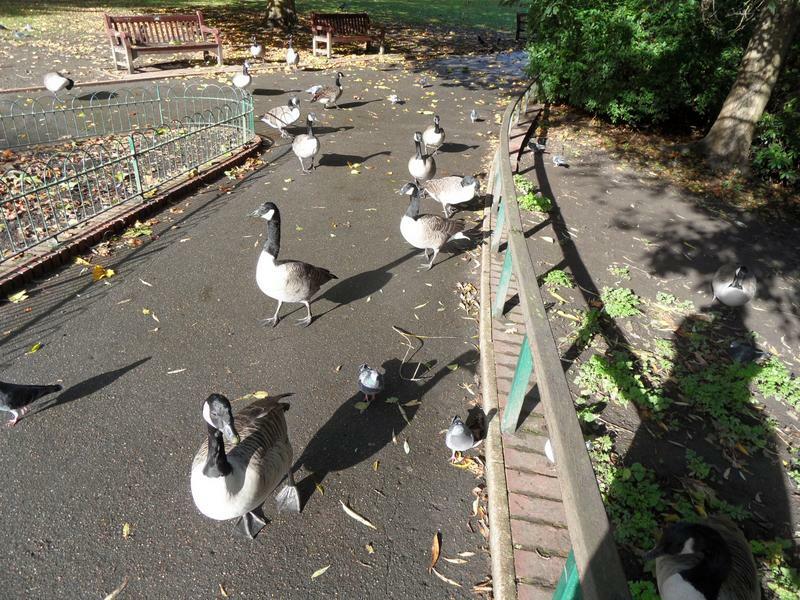 The geese are hungry today, also following me down the path. 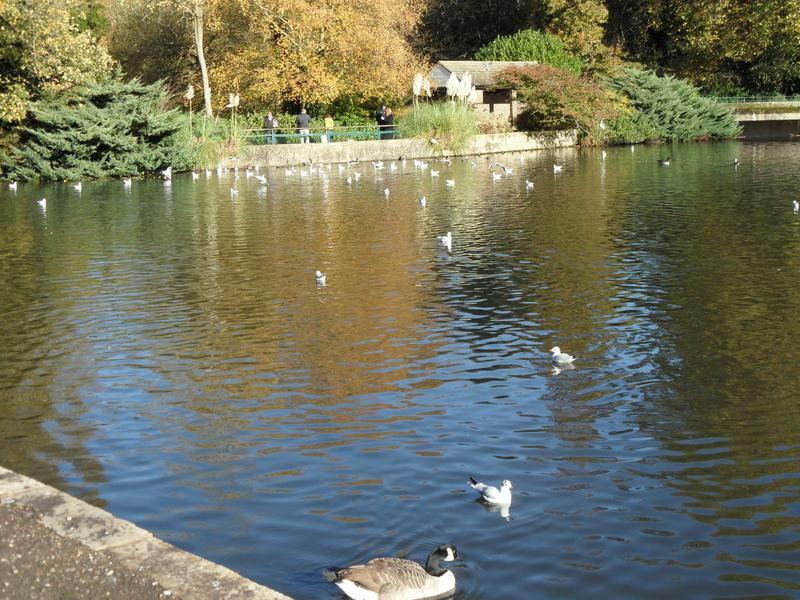 The seabirds have started returning for the winter. 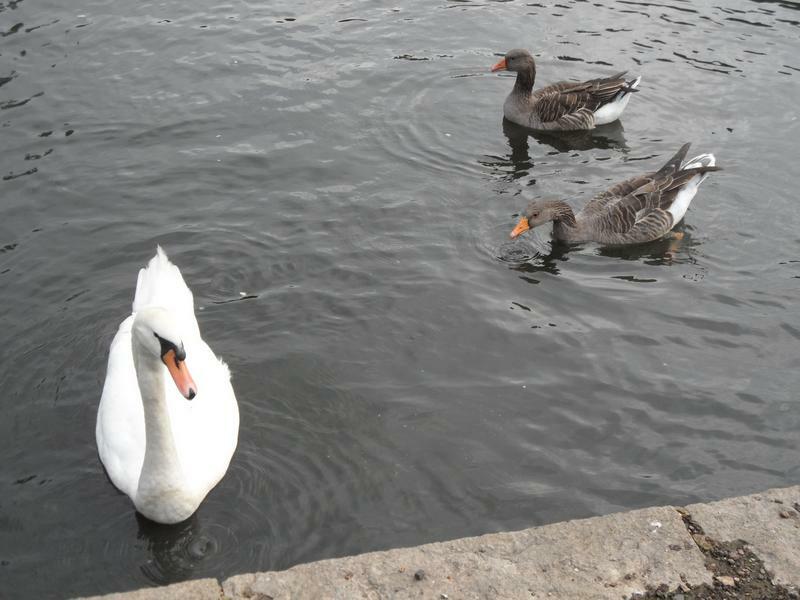 Unusual to see three swans together. 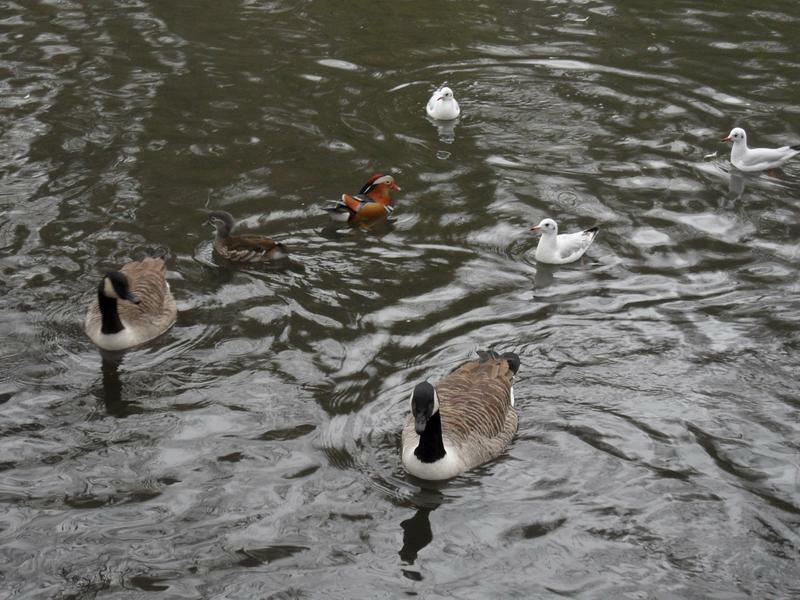 10th November 2013, all the usual suspects on the top pond, and noisy sea gulls. 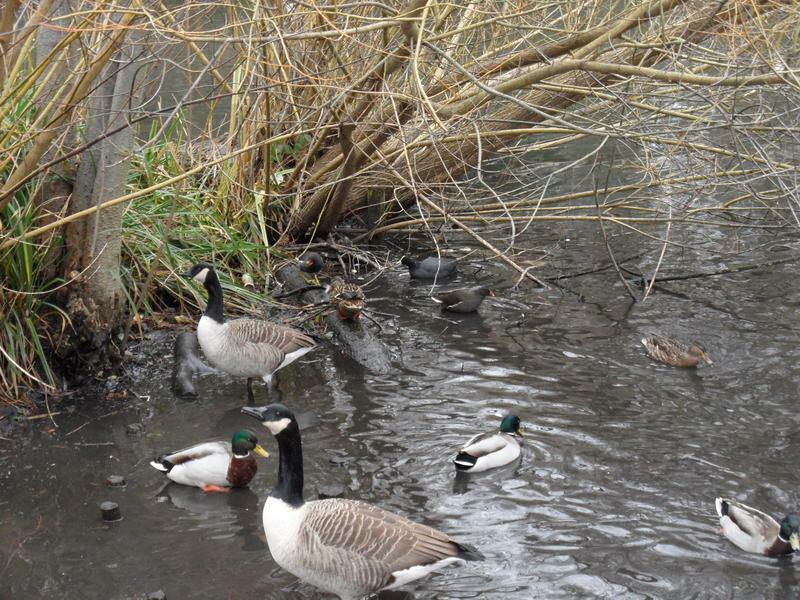 Various Mallards and Geese heading toward me looking for food. 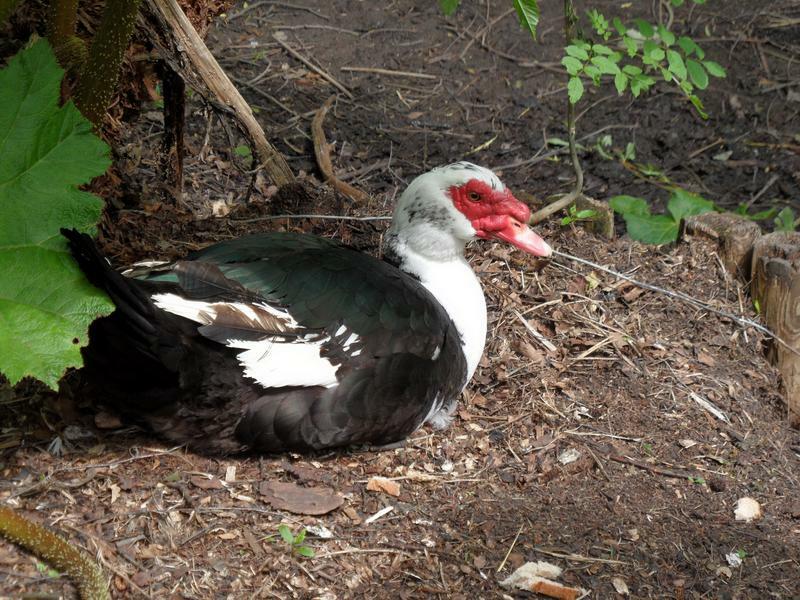 One of the smaller Muscovy ducks, not seen Boris for a while, he's larger. 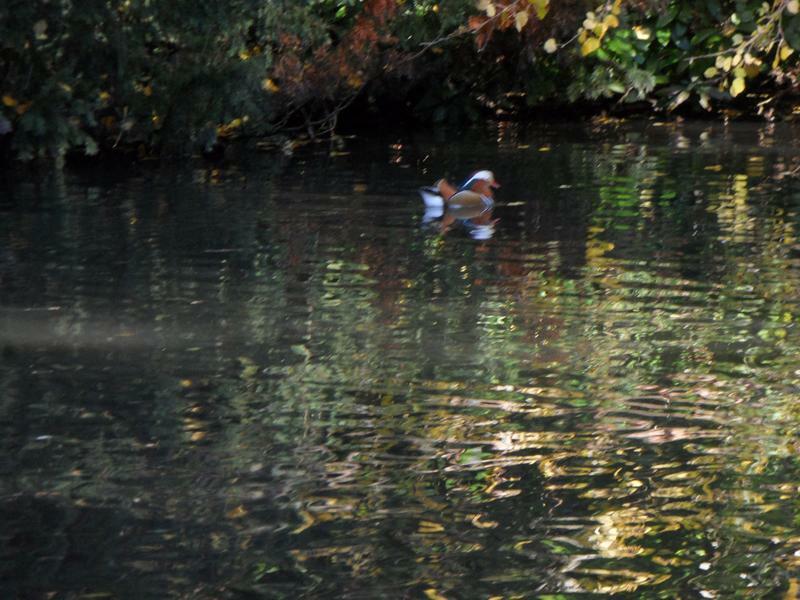 Not very clear photo of one of the Mandarin ducks on the far side of the lake. 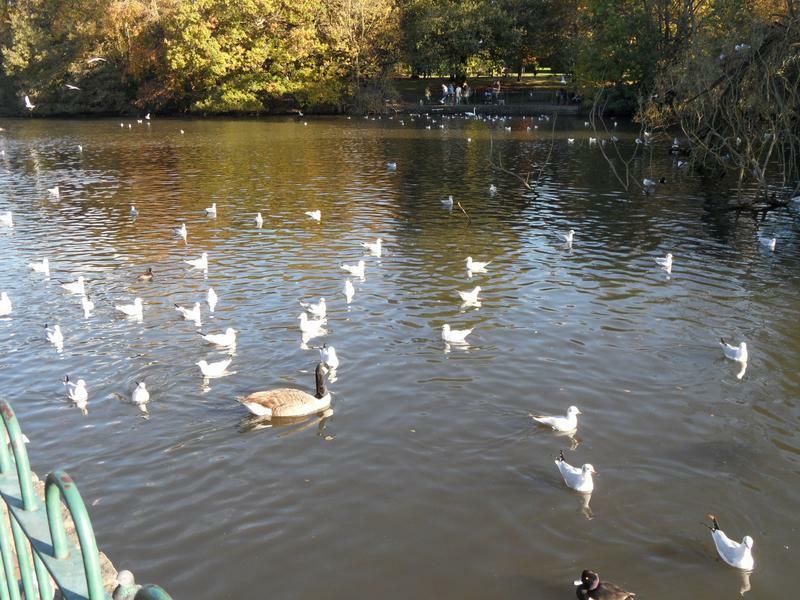 Too many sea gulls on the main lake. 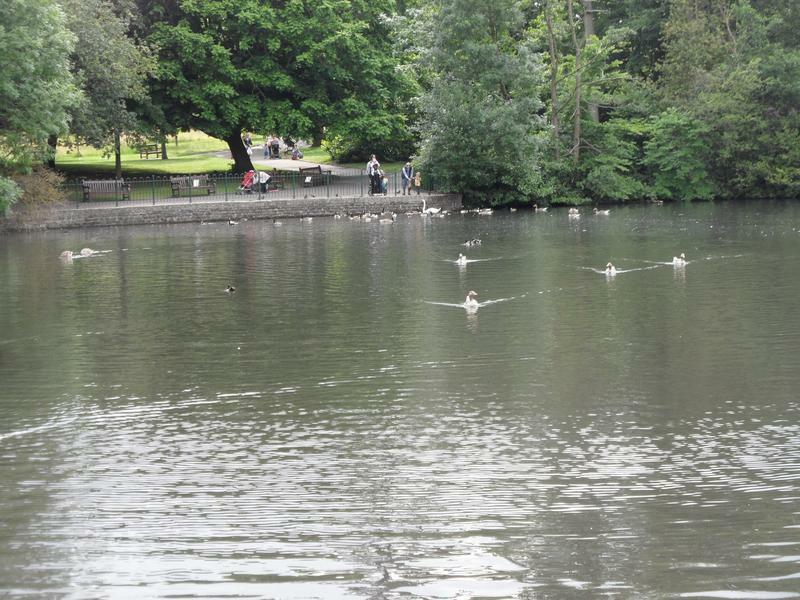 Many more seagulls, and a tufted duck in the foreground. 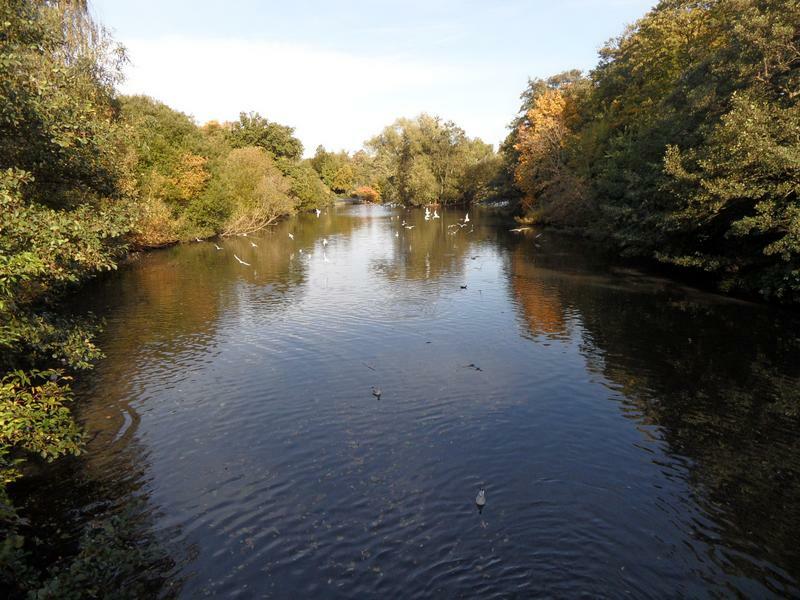 Still a strong river flowing through the park, after all the Autumn rain. 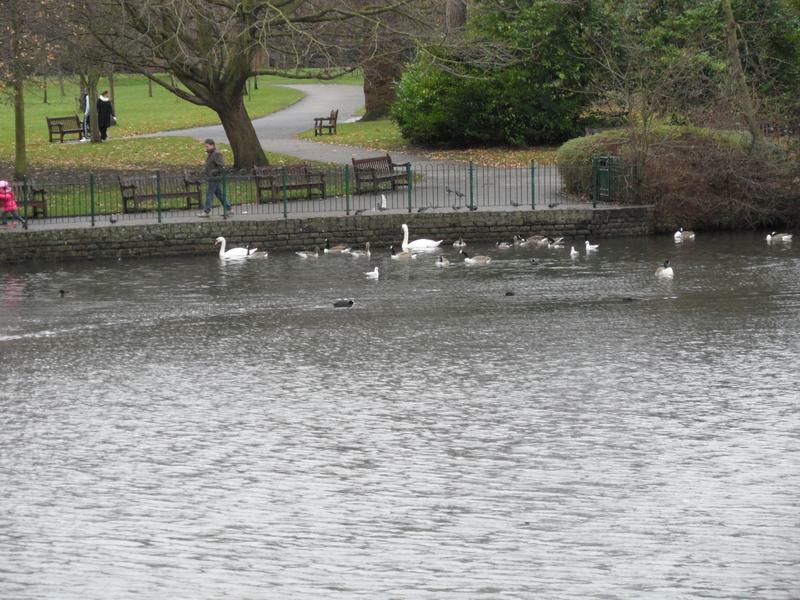 15th December 2013, not that many birds on the northern lake. 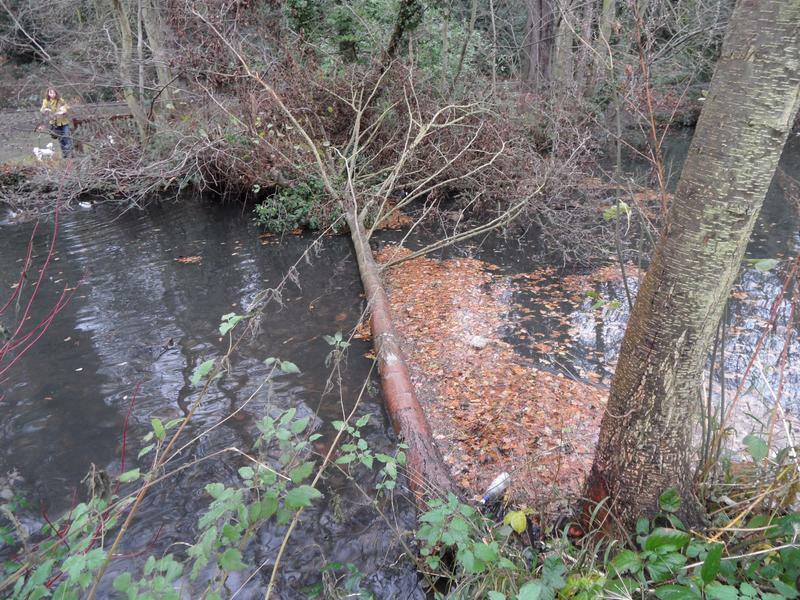 A tree has come down during a storm, not stopping water but blocking leaves. 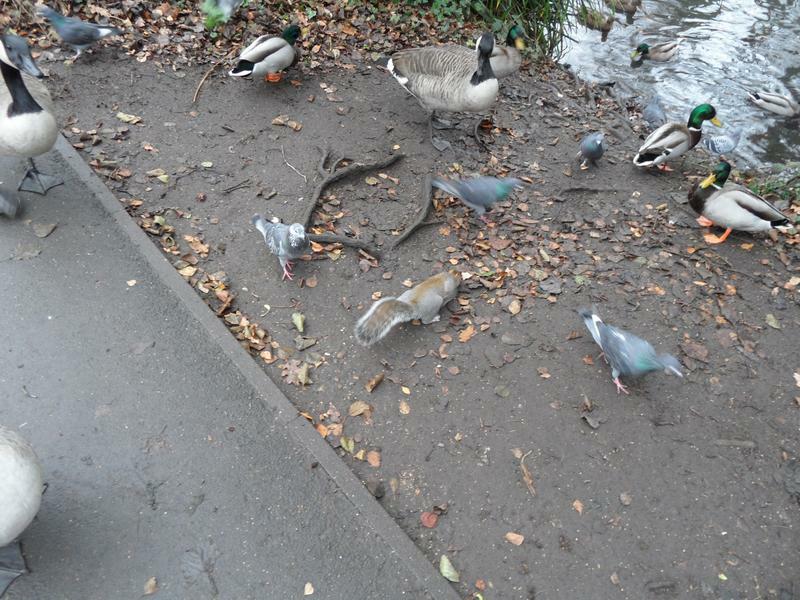 This squirrel was very hungry and kept climbing my leg looking for peanuts. 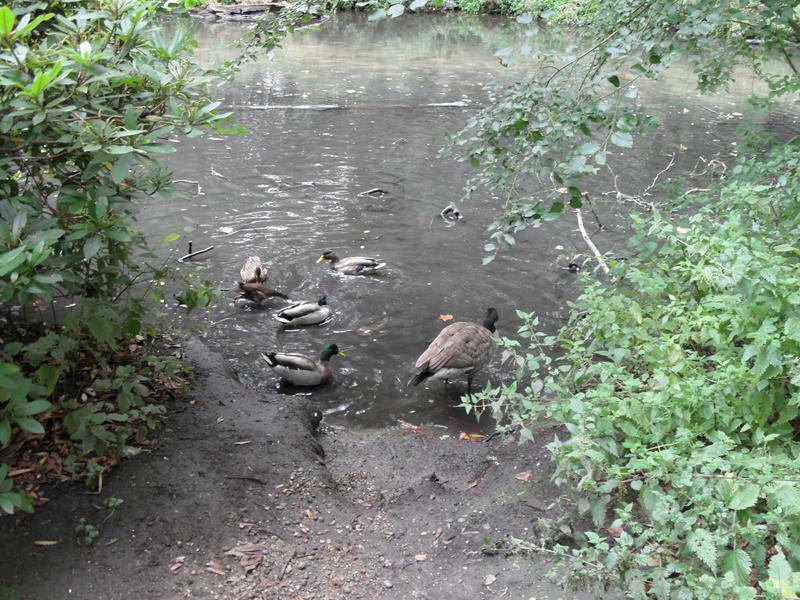 Various mallards and geese on the upper pond. 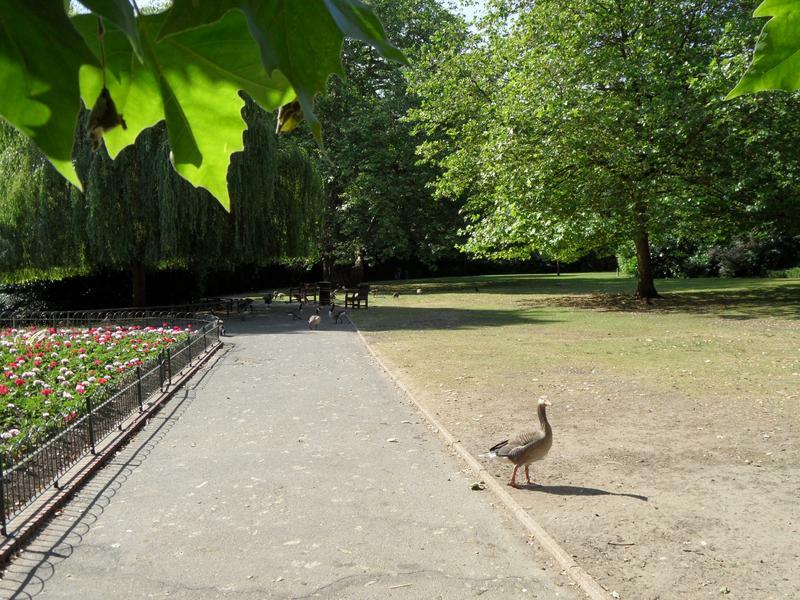 The park is quite quiet for a Sunday. 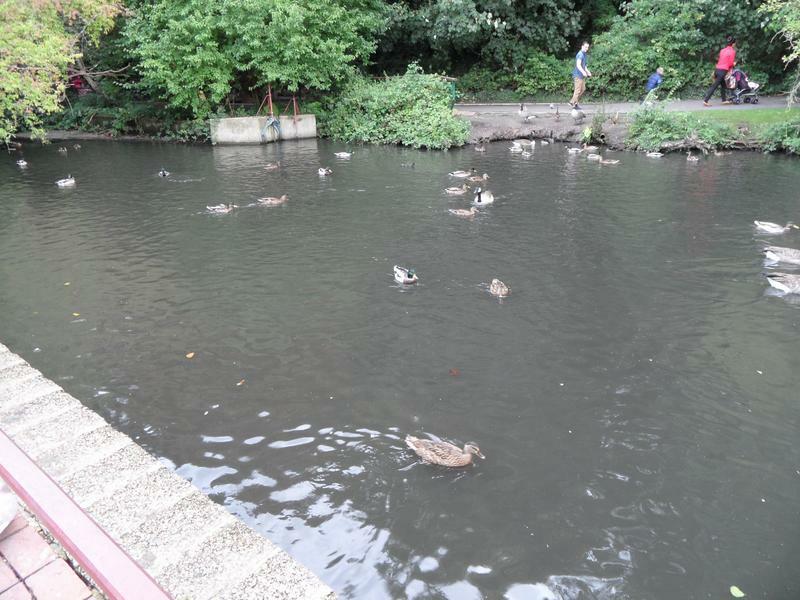 The southern bridge where birds wait to be fed. 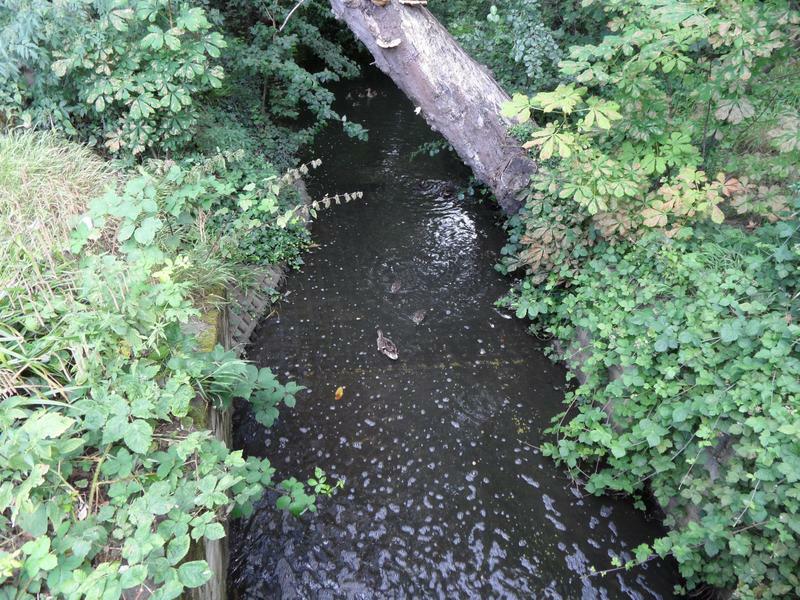 Just beyond the southern bridge, another squirrel was climbing my leg near here, unless the first one had followed me a quarter of a mile. 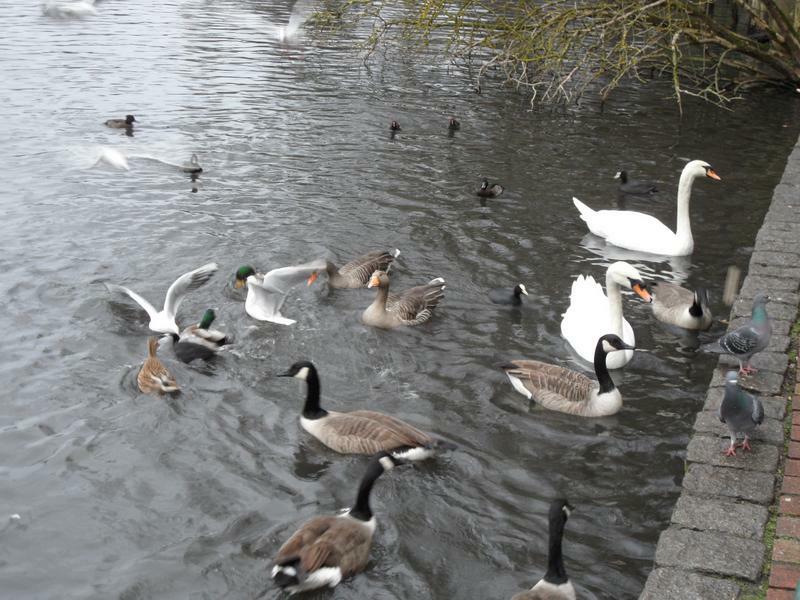 Swans, Canada and Greylag Geese, Coots and a couple of Mallards. 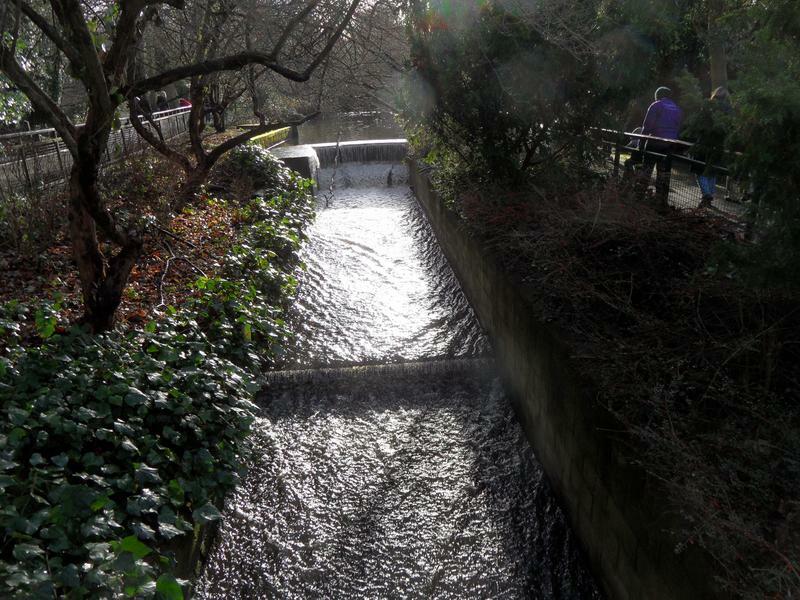 5th January 2014, after three weeks of very heavy rain, the river flow is very strong. 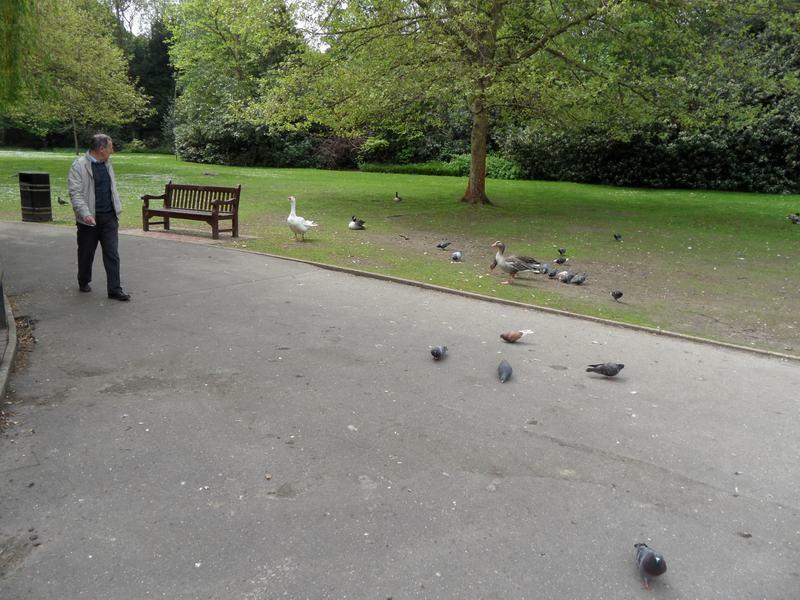 Not that hungry today, first dry morning for a few days so lots of people in the park feeding the birds. 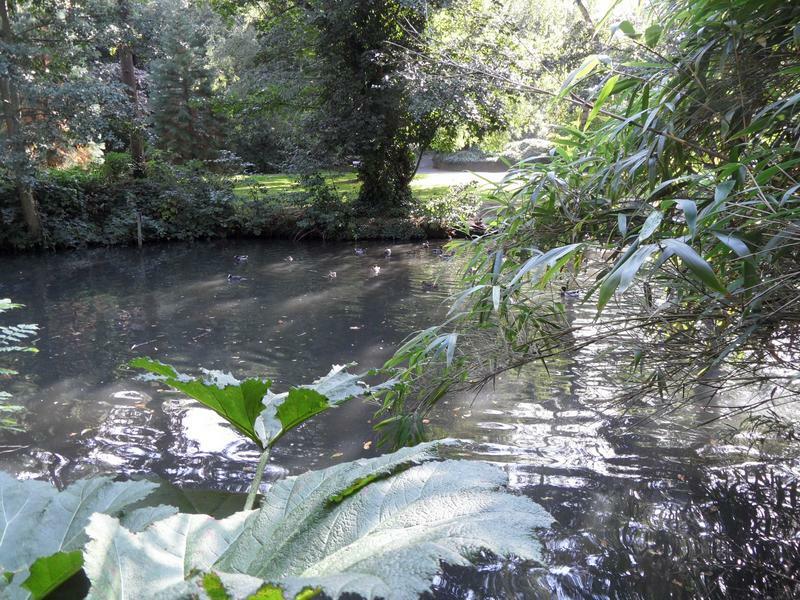 In the summer the path down the far side of the lake is hidden by trees. 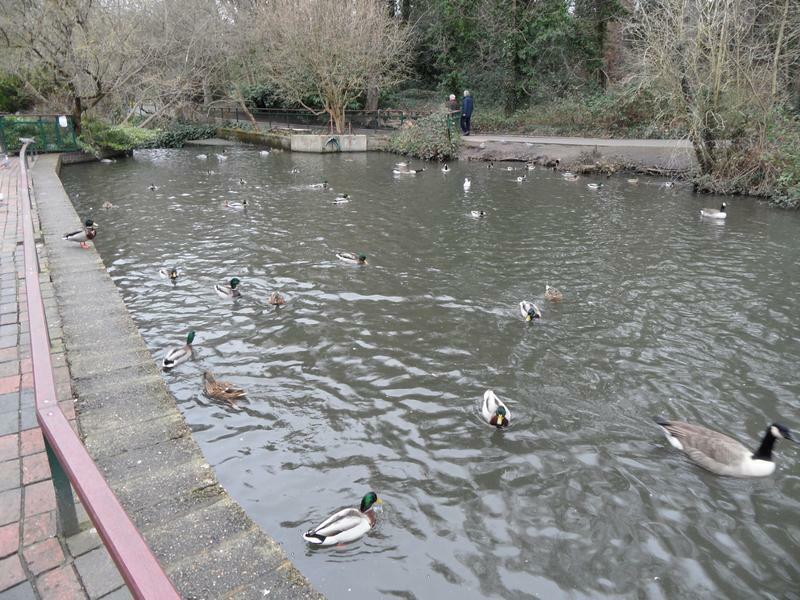 Today, the ducks and geese seem reluctant to leave the water for food, normally they run up to anyone feeding them here. 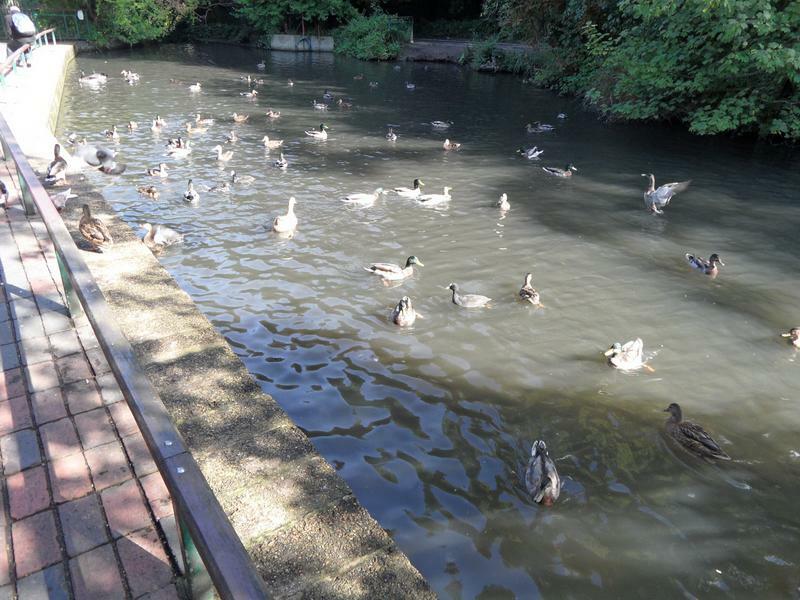 A few Mallards waiting for food. 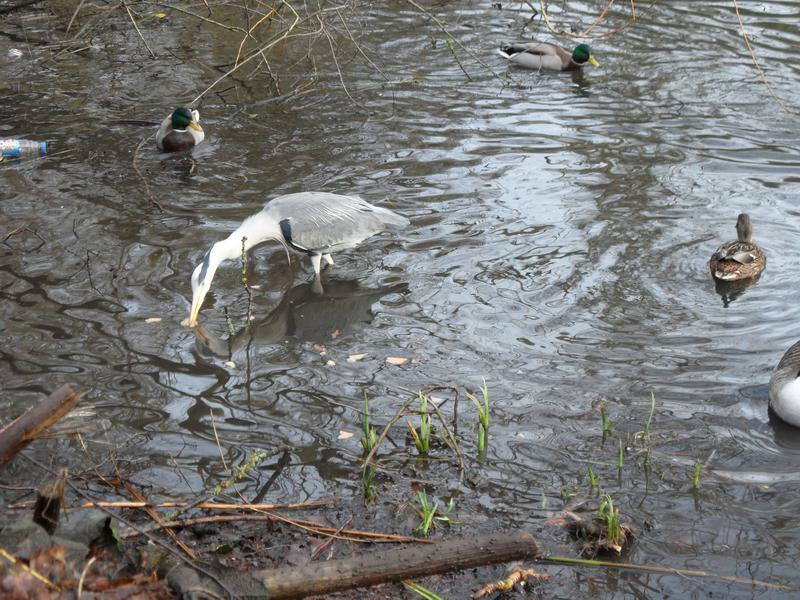 Don't often see a Grey Heron eating bread, but this one came wading across the lake looing for food. 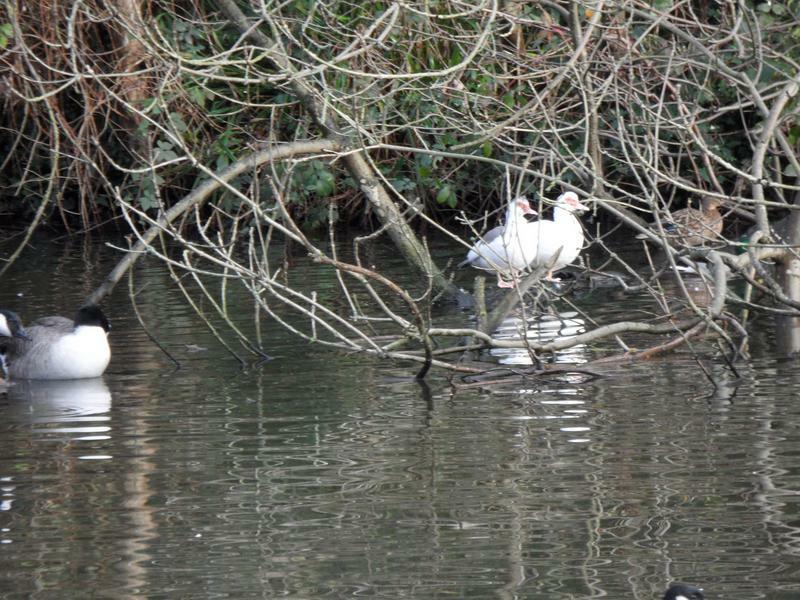 Meanwhile the two Muscovy Ducks are sitting on their usual branch on the far side of the lake. 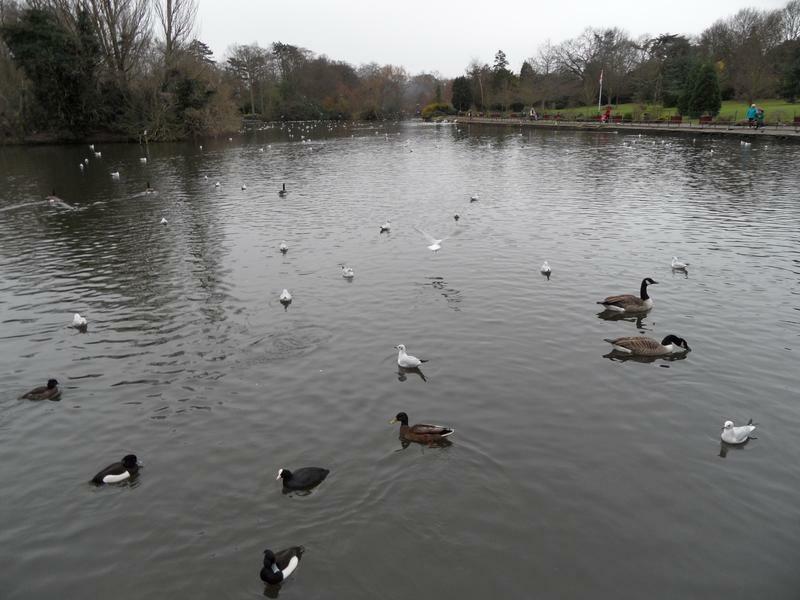 A few ducks and gulls on the northern lake. 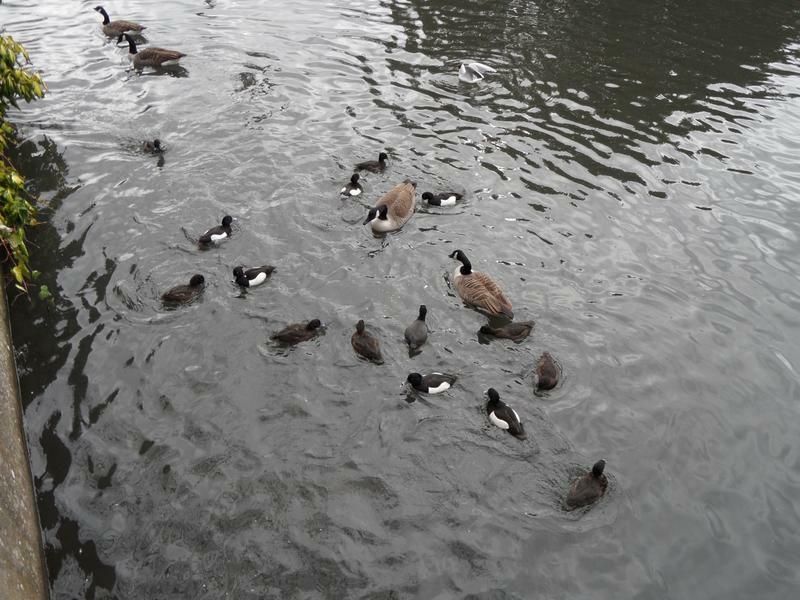 Lots of hungry Tufted Ducks a few geese under the centre lake bridge.